Click on the circular orange button to begin playback of each track. Your comments are welcome. What did you like? Did the tour add to your experience? What’s your favorite part of the show? Do you have suggestions for ways to improve the experience? Leave a comment below or email me. A link to a survey is coming soon. Antarctica Journal: Scroll the menu or search for topics to read the original blog entries. Special thanks to everyone who directly assisted with the production of this exhibition: Laura Amussen, Exhibitions Director at Goucher College; Rick Delaney; Jowita Wyszomirska; the digital production staff at Open Works Baltimore; Full Circle Photo; the Otis College of Art Summer Residency Program; and Nicole Atkinson, Push to Start, Inc. And in Antarctica: Peter West from the National Science Foundation Office of Polar Programs; field camp researchers and personnel Sam Bowser, Laura Von Rosk, David Ainley, Jean Pennycook, Katie Dugger, Andrew Fountain, Rae Spain, Dave Van Horn, Renee Noffke, and Amy Chiuchiolo; mountaineers Forrest McCarthy and Evan Miller; and especially Elaine Hood of Lockheed Martin, who organized the complex logistics to get me to these special places. Thank you to my “Artists U Working Group”: Zoë Charlton, Alex Heilner, Nate Larson, Tony Shore, Marcia Wolfson-Ray, Olu Butterfly Woods and Jowita Wyszormirska, for the inspiration to add sound recordings to this exhibition and for your ongoing feedback as I developed this project, to the hardworking staff at the Greater Baltimore Cultural Alliance and to the Puffin Foundation. And I am especially grateful to my husband Joel Marcus for his invaluable support while I was “on the ice” and throughout the exhibition preparations. Funding for this exhibition has been made possible in part by the Puffin Foundation and by the Rubys Artist Project Grants, a program of the Greater Baltimore Cultural Alliance conceived and initiated with start-up funding from the Robert W. Deutsch Foundation. I’ve finished two sculptures made from 3D scans of the Antarctic landscape so far. 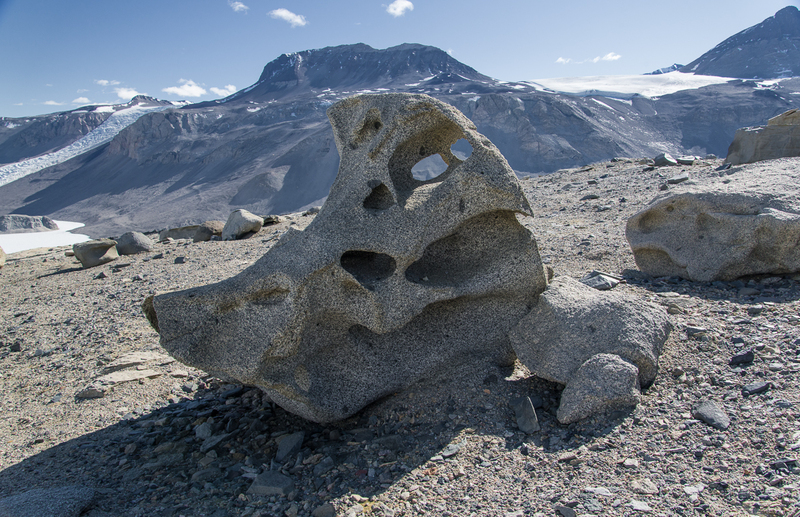 This latest one is of a ventifact — wind-eroded boulder — that I photographed in the McMurdo Dry Valleys, a trip I recounted in an earlier blog post. I call it the “Bird” Ventifact because from certain angles, it looks like a giant beaked bird with a crest. 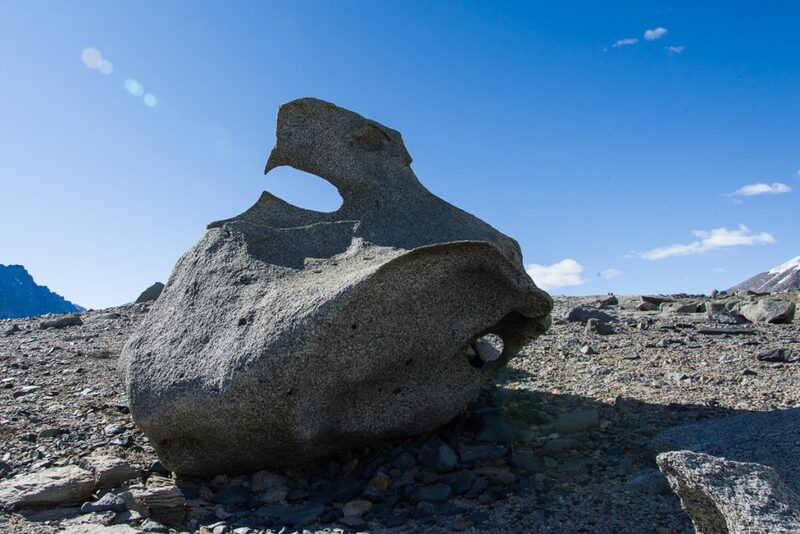 Ventifacts and figures: granite boulders at the top of the ridge above Lake Bonney have been sculpted into strange shapes. The “Bird” ventifact looks completely different from another angle. I took 31 photographs from different angles to make the 3D file. The “Bird” Ventifact from another side. 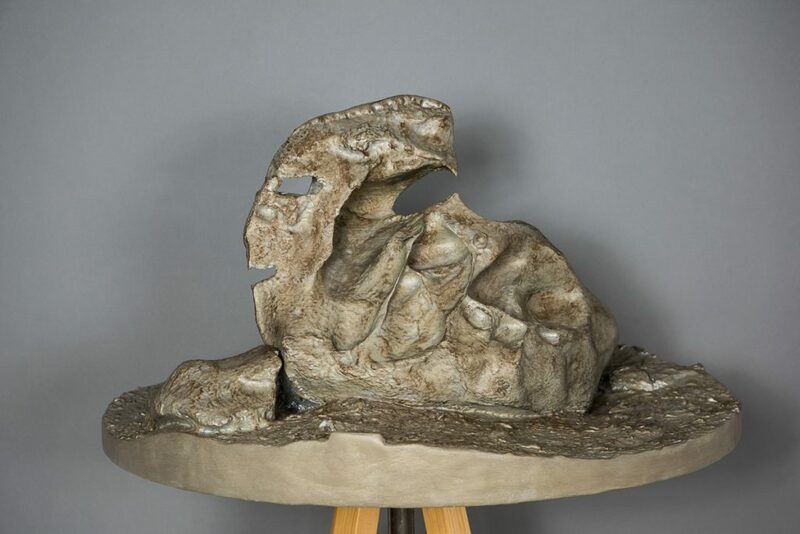 The finished sculpture is 16 x 29.25 x 29.25 inches. Bird Ventifact Sculpture, alternate view. Seals? Yes. Polar bears? No: A young Weddell seal raises its head to check us out before continuing its nap on the sea ice near Cape Bernacchi. It probably got onto the ice via a hole several yards away that was cut earlier in the season by Sam Bowser’s dive team. Let’s clear up one thing that I get asked a lot: there are no polar bears in Antarctica. That’s the Arctic. The only mammals are marine mammals, found along the coasts: seals — which I saw on a number of occasions — and whales —which I did not see at all. The only birds I saw were skuas, which are feisty brown birds related to gulls, and Adélie penguins. 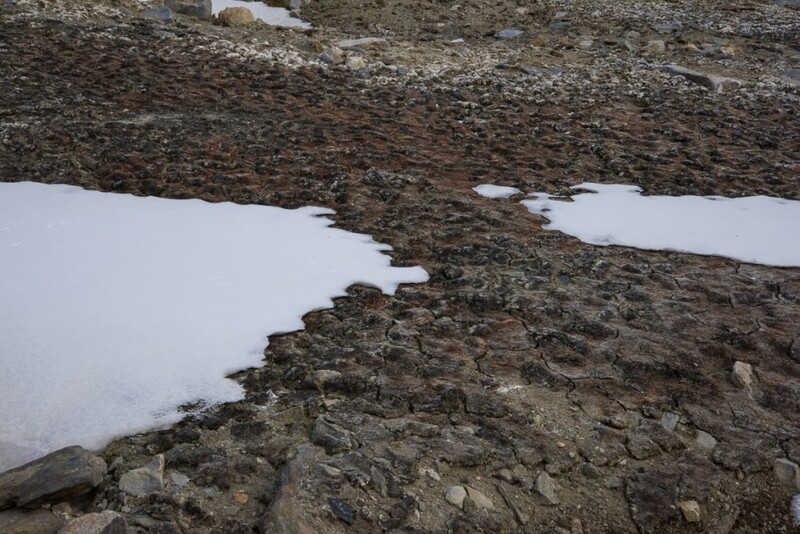 Uphill from the sea ice pressure ridges in New Harbor beneath the Double Curtain Glacier was a highly unusual sight — several square yards of gray and tan moss — the only plant life I saw growing in soil the entire seven weeks I was in Antarctica. 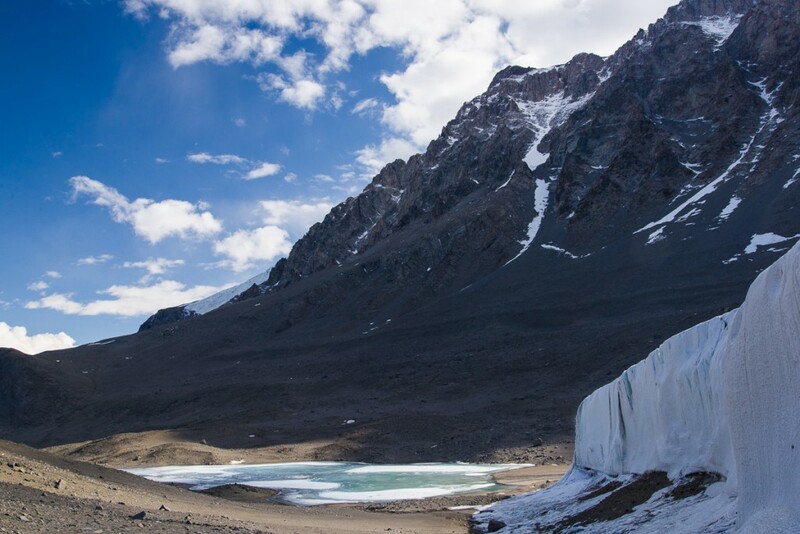 Further inland, walking the gravel hills and ice-covered lakes of the Dry Valleys, you and your companions are the only living things in sight — nothing green, feathered, scaly or furry. The exception was a lone skua occasionally spotted in the vicinity of the Lake Hoare field camp, nicknamed Taylor by the field camp residents. 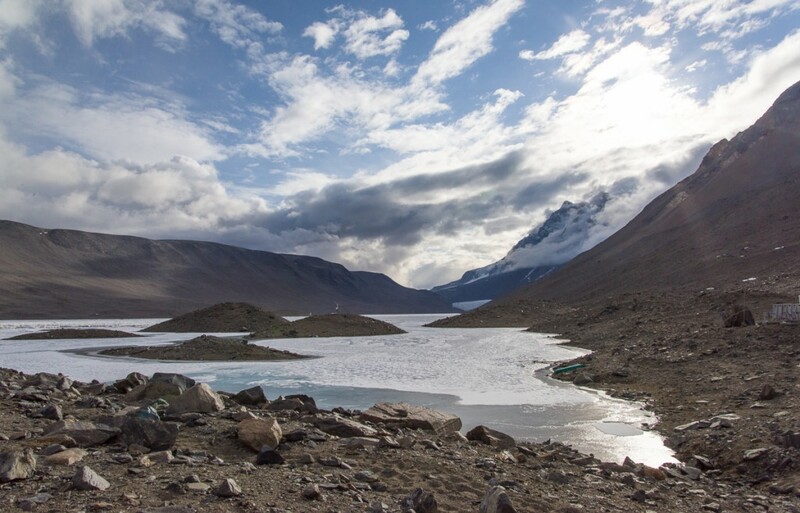 The major life forms of the Dry Valleys are microscopic organisms in the lakes, streams and soil that scientists sample and study as part of the long-term ecological research study, but of course, they’re not visible without a microscope. A rare sign of life: This patch of moss on a hill between the Double Curtain Glacier and a pressure ridge was the only plant I saw growing in the Dry Valleys. 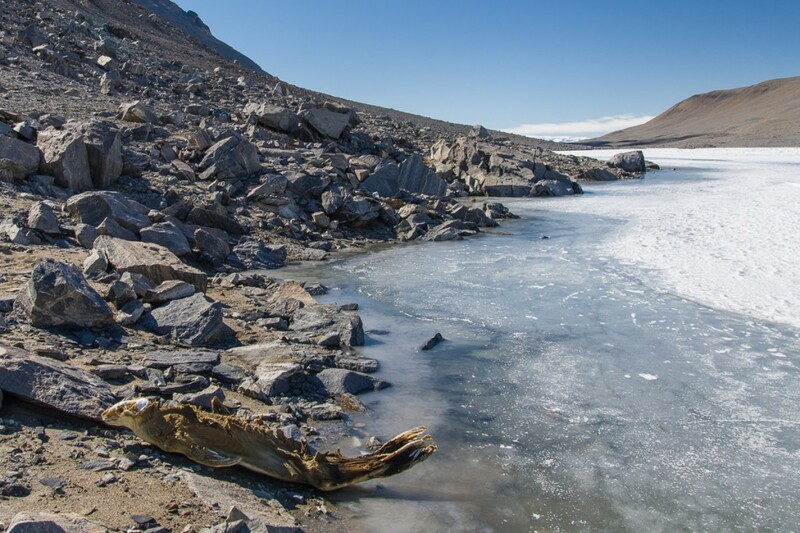 This mummified seal atop Lake Bonney traveled about as far as any have managed — around 41 miles from the sea. A closer look at the Lake Bonney seal, lying on its back atop ablated lake ice. The dry, freezing climate and lack of bacteria and invertebrates that break down carcasses in warmer regions leave the seals in varying states of preservation that make it impossible to tell how long they’ve been lying there by their appearance just by sight. Some are mostly skeletal, some still have a substantial amount of leathery skin attached, but you can’t tell if they’re a few years old or several hundred without doing a laboratory analysis of carbon and nitrogen isotopes. A research team led by Paul Koch and Brenda Hall in the 2012-13 and 2013-14 seasons has done just that. They saw these seals not as a weird curiosity, but as a way to investigate the history of seal populations over the past 1,500 years, and how they adapted to changing amounts of ice in McMurdo Sound in terms of their diet, which is also revealed by the chemical analysis. 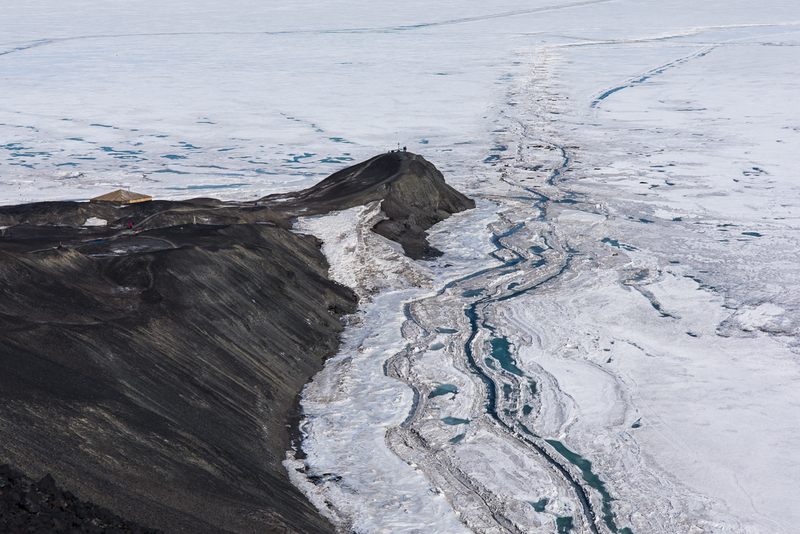 Up until about 500 years ago, McMurdo Sound had far less ice than it did afterwards, when ice shelves formed. Knowing how the seals responded and how their diet changed would help predict how warming oceans might affect them in the future. 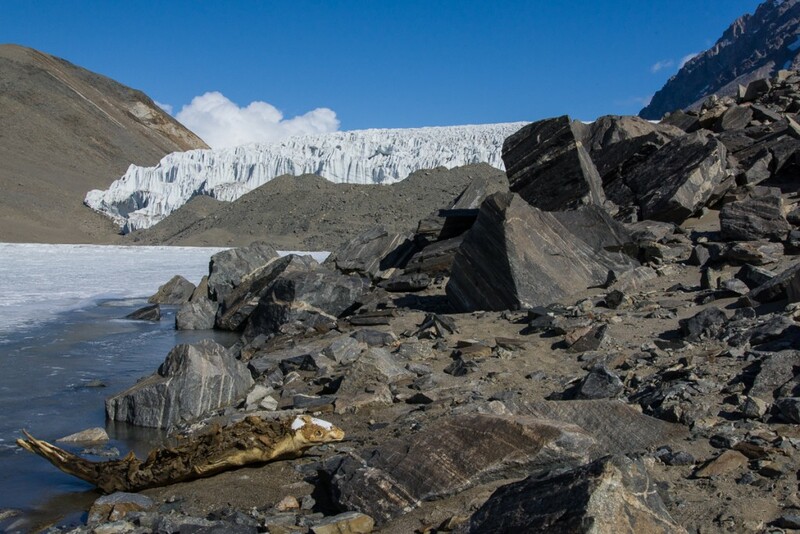 To that end, the scientists a undertook a comprehensive inventory of Dry Valleys mummified seals and took over 400 samples to be analyzed (read more about the study in the Antarctic Sun and this press release). “Studies of fossils let us see how species do or don’t adapt to environmental shifts. Here, we are using that approach to explore the adaptability and vulnerability of different Antarctic seal species to less icy conditions in the near future,” said Koch. If you’ve read every single one of my Antarctica blog posts, you’ve encountered a few of the following scenes before, but I thought it would be interesting to bring them all together in one place, along with some information about what is known about them. 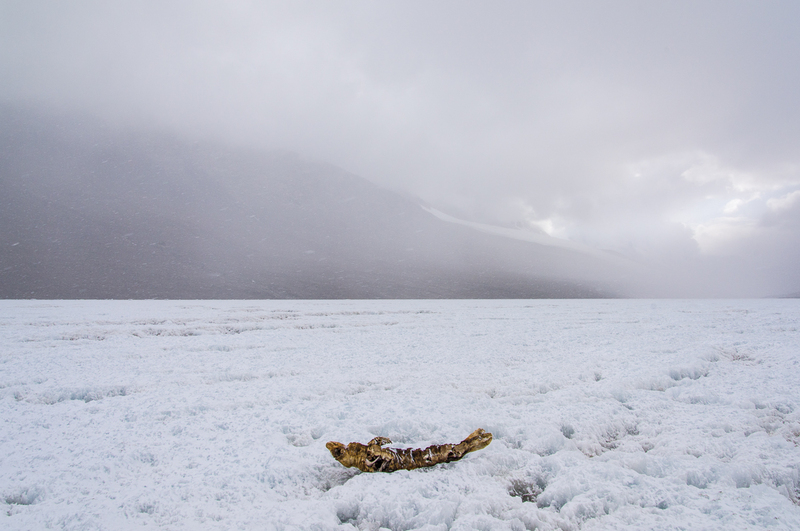 This seal near the Double Curtain Glacier didn’t get very far uphill before succumbing. The Ferrar Glacier is in the distance. Close-up of the seal skeleton. The flipper anatomy is very clear on the right. The presence of mummified seals has posed a scientific mystery since the first explorers of the region in the early 1900s ran across them. They’re generally small, and I have run across only one account of researchers encountering a live seal in the Dry Valleys. The current assumption is that these are young seals that get lost during whiteout conditions in the harsh Antarctic winter, when the seals usually stay near cracks in the sea ice. Without visual cues, they get turned around and crawl along in a futile search for the sea until they expire. 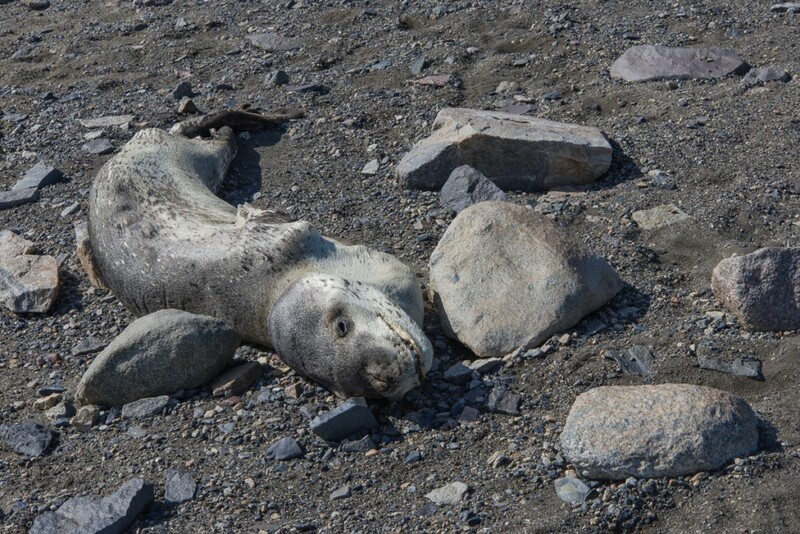 As of October 2015, Koch’s team published that it had reported identified mummies of over 300 crabeater seals, 100 Weddell seals and around 20 leopard seals, a proportional breakdown roughly corresponding to their current numbers in the sound. That sounds like a significant number of wayward seals, but the mummies can be as much as 1,500 years old. Koch told the Antarctic Sun that it may be that only one or two lose their way each year. The leopard seal shown below, on the Lake Fryxell side of the Canada Glacier, is a rare sight on a few counts. Leopard seals make up less than 5% of the mummified seals. This one is pretty much intact, including fur, which is unusual. And unlike the vast majority of the mummies, we know for sure that this one is a recent arrival, because this area is frequently traversed by Dry Valleys researchers and they took note of its appearance a couple of years ago. 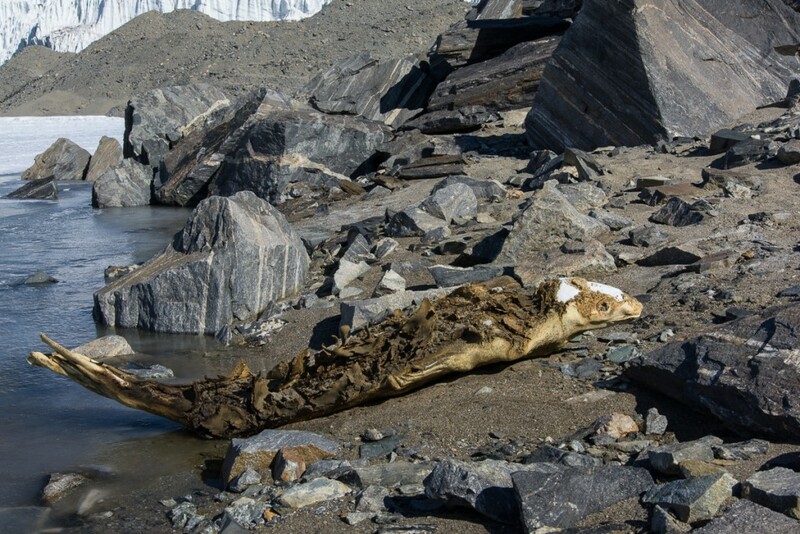 A mummified leopard seal is a rare sight. This one made it past Lake Fryxell, which is in the background. A closer look at the leopard seal. 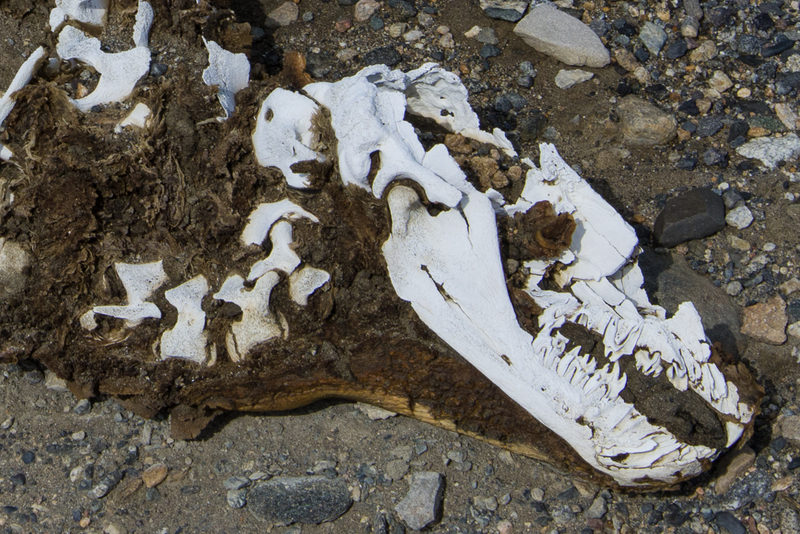 This seal skeleton was in the general vicinity of the leopard seal, on the Fryxell side of the Canada Glacier. Odds are it’s a crabeater seal, which are far more commonly found than leopard seals. (The remaining teeth look right for it to be a crabeater, too.) The top of the seal has been sandblasted off over the years by winds ripping through the valley, but you can see that the part facing the ground is probably in one piece. The same seal as above, with the Canada Glacier behind it to the right. 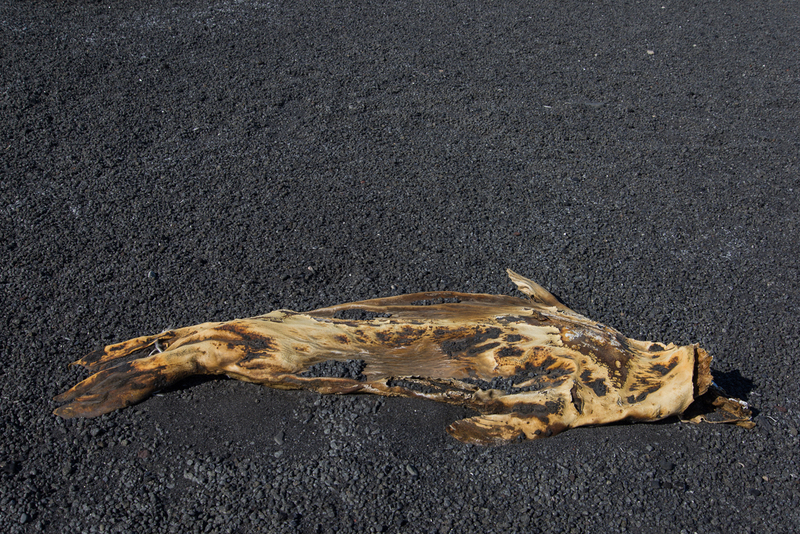 Mummified seal on the black sand beach at Cape Royds. 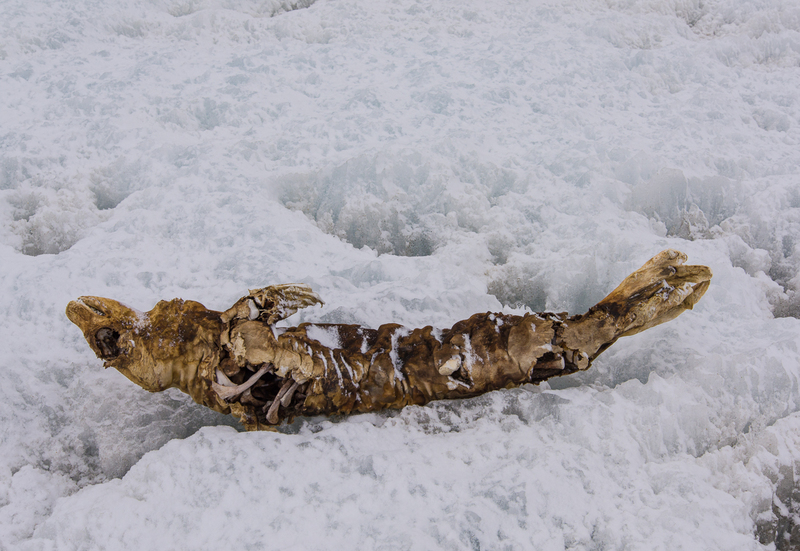 I photographed all the mummified seals I encountered, with the exception of one that had remarkably made it the length of Lake Hoare and part way up a hill near the Suess Glacier. 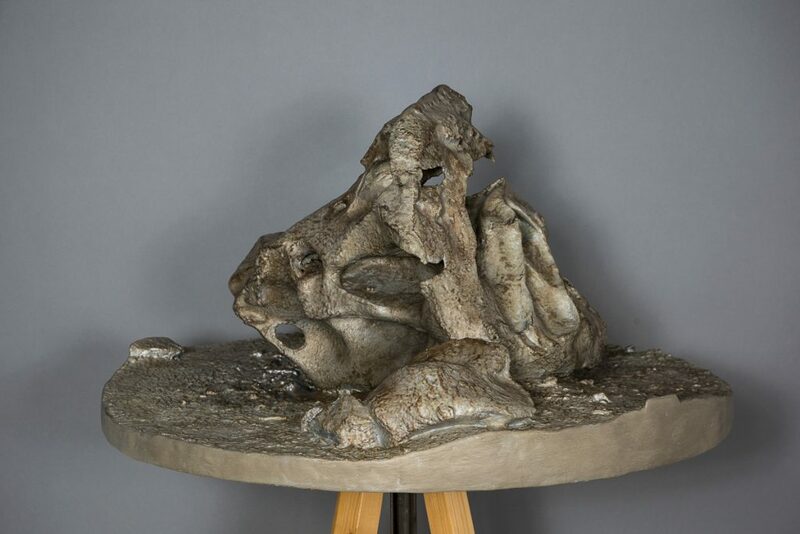 It was dismembered into two halves, lying in the dirt side by side, which for some reason struck me as more grotesque and disturbing than a dead seal in one piece. I just didn’t want to look at that again! But probably the strangest one I saw was also near the Suess Glacier: rather than lying on its back or its side, it’s perched on its belly, tail curving upwards and head lifted as if flash-frozen in mid motion. This mummified seal at the west end of Lake Hoare is unusual for coming to rest in a pose that gives it a strangely animated look. Rae, the Lake Hoare camp manager, suggested that it was underwater for a long time, and revealed by a retreating shoreline. This view faces the direction the seal came from. 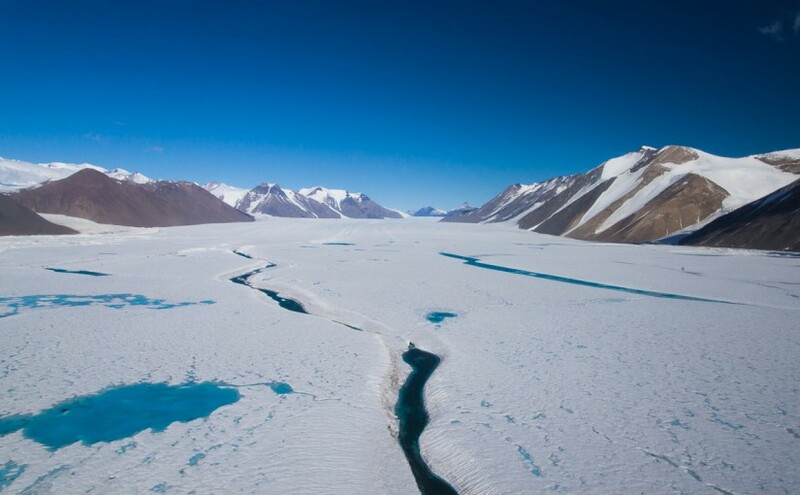 It would have to have crawled around the Commonwealth Glacier, down the length of Lake Fryxwell, around the Canada Glacier and down the length of Lake Hoare to reach this point! Close up of the seal near the Suess Glacier, looking west toward the glacier, which is in the upper left corner. 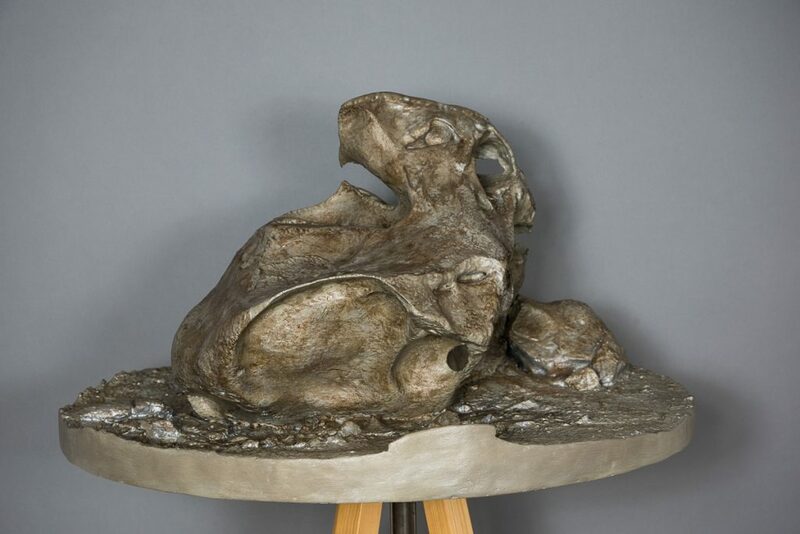 The scientists who have studied these seals are interested in them as a fossil record and a way of understanding the history of ocean ecology. What drives the seals to travel for miles over land and how they survive the journeys is ultimately beside the point in terms of their research. 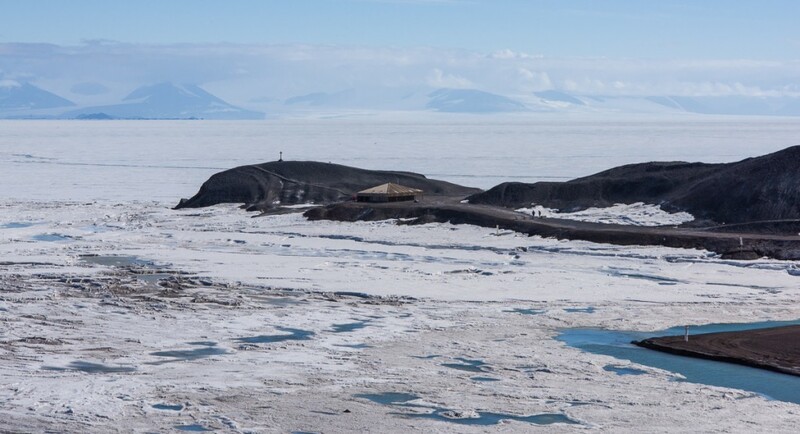 The lack of information about that aspect is a reminder, though, of how little we still know about what Antarctic animals do during the long, dark winters — that includes seals and penguins. At one of the science lectures, I asked Jennifer Burns, who has been studying Weddell seals for over 20 years, if she had seen any changes in behavior related to climate change. She responded that she hesitates to make comparisons because monitoring and tracking hardware is so much better quality now than 20 years ago. Devices are smaller and less intrusive to attach to the animal — in the past they were bulky and generally didn’t stay on long. In years to come, perhaps more seals will be tracked and shed some light on the mystery of the lost seals. 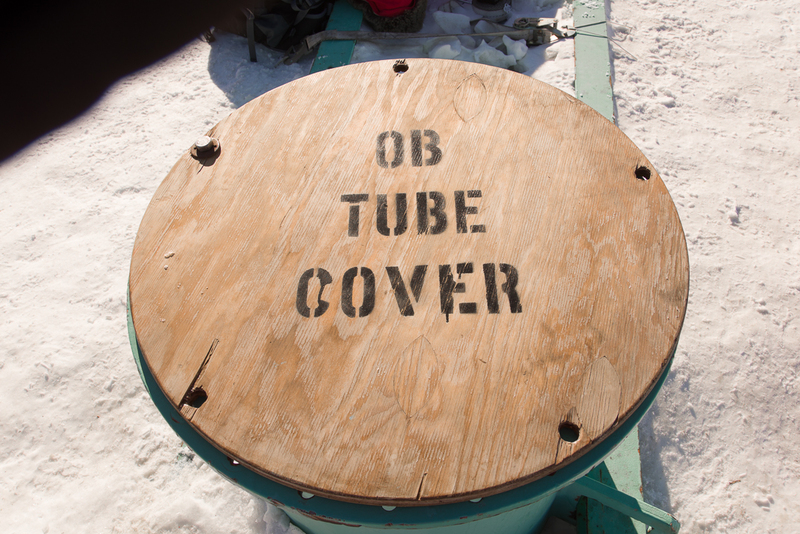 The entrance to the Ob Tube. Biologists who study the creatures that live on the ocean floor in McMurdo Sound do their work during the first part of the summer research season. 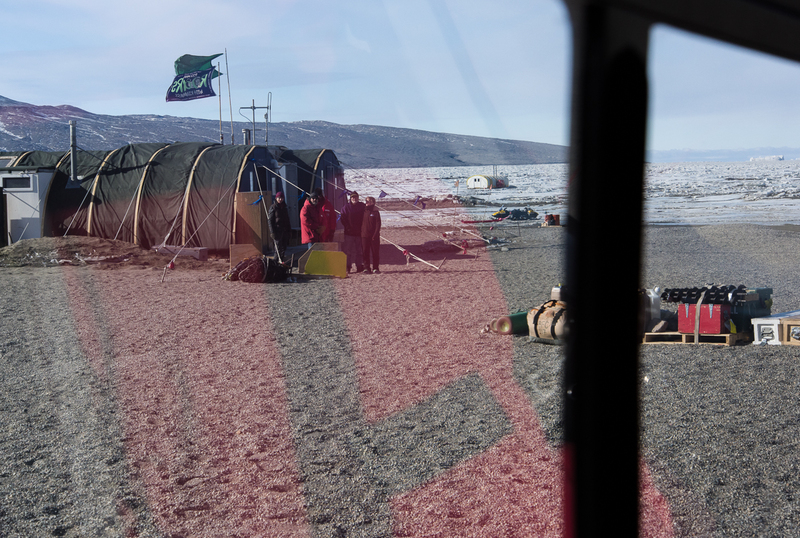 That’s when the sea ice is strong enough to support the heavy tractors that tow the dive huts onto and off the ice. Huts on the sea ice are removed by mid-December, when air temperatures warm and cracks in the ice widen and deepen. 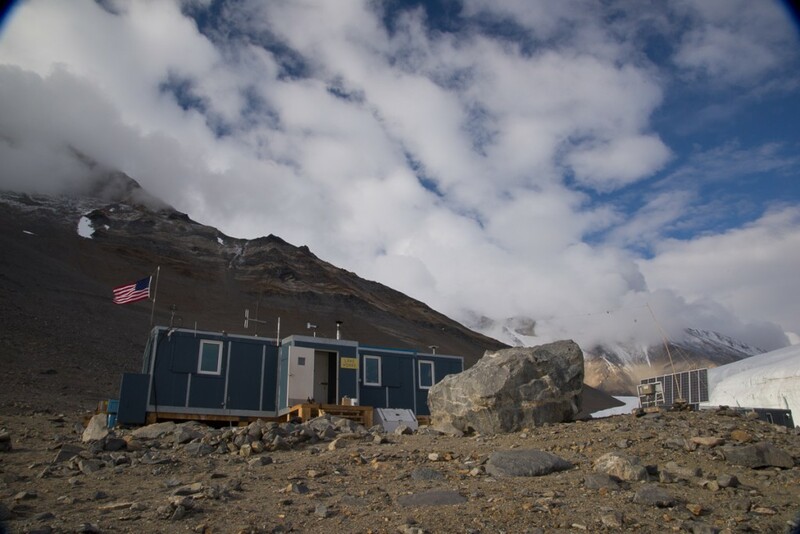 In a previous blog post, I’ve already written about my stay at Sam Bowser’s field camp at New Harbor, which is across the sound from McMurdo at the edge of the Dry Valleys. 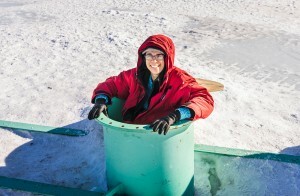 Other scientists collect samples right by the base, from a dive hut set up on the sea ice that’s a short downhill walk from the Crary Lab and the helicopter pad. Ready to climb inside the Ob Tube. Photo: Shaun O’Boyle. Near the hut, a smaller hole is drilled in the ice and the Observation Tube is installed. 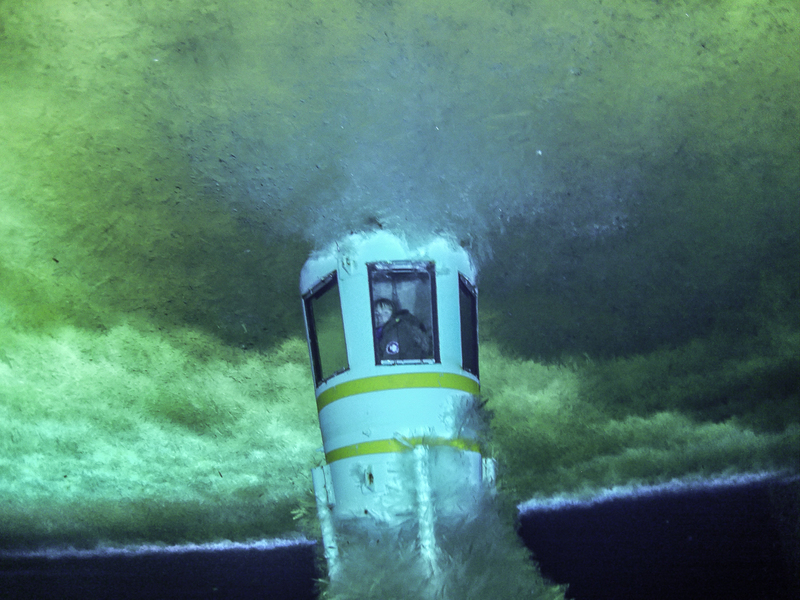 Known around town as the “Ob Tube,” it’s basically an underwater manhole with windows, dating back to the days when the U.S. Navy ran McMurdo. Anyone living on the station is permitted to go to the station firehouse any time of day or night and pick up the key, as long as they are accompanied by at least one other person. 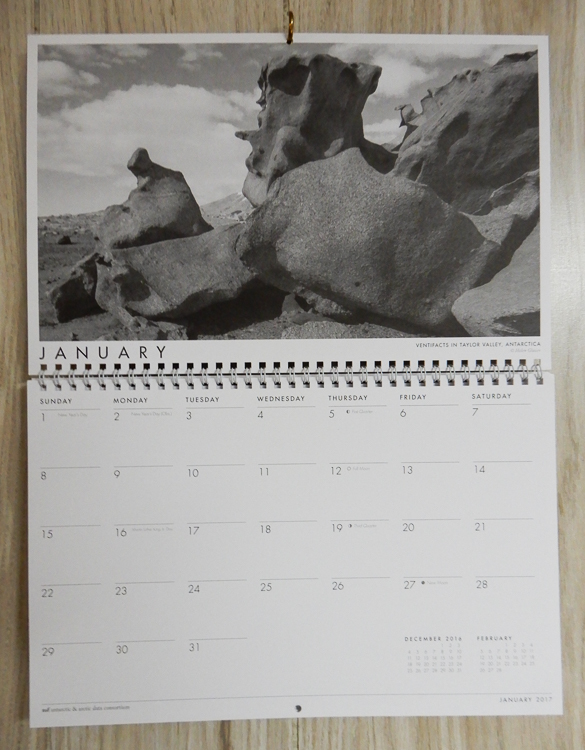 I went with Shaun O’Boyle, the other Antarctic Artists and Writers Program participant at McMurdo while I was there, on the morning of November 27th, timing our visit for a morning when we knew biologist Gretchen Hofmann’s dive team would be working there. Getting down: looking up at the handholds inside the Ob Tube. 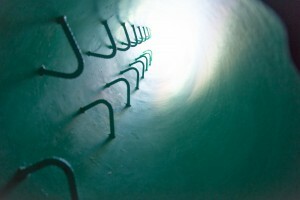 A visit to the Ob tube is not for the claustrophobic. I’m not a large person, but climbing down the tube via metal handholds while wearing a down parka didn’t leave much room to maneuver. You descend the last few feet via a rope ladder, which is visible in the background of my inadvertent selfie below. 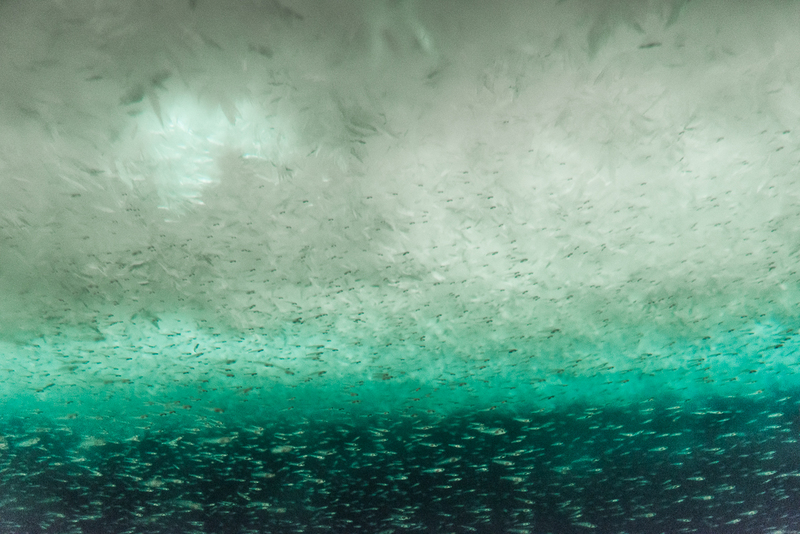 Standing at the bottom, you are surrounded by windows and looking up at crystal chandeliers of sea ice. Schools of tiny fish scoot past. 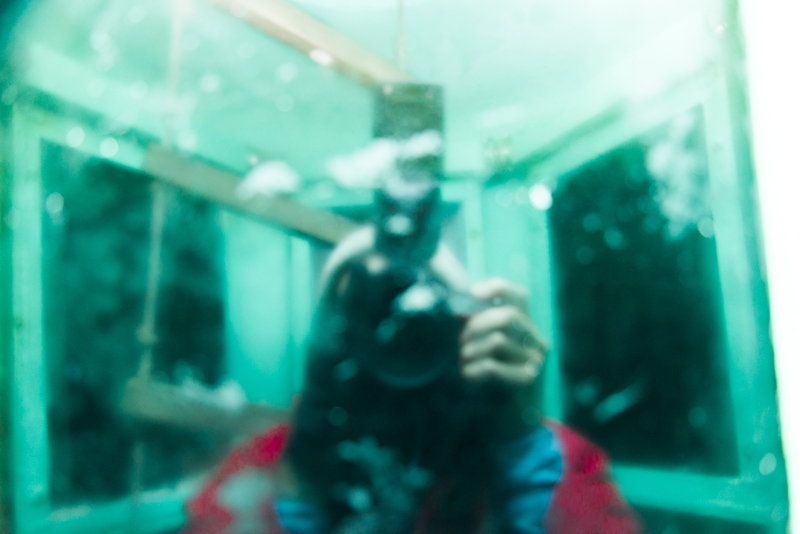 Inadvertent selfie: I tried using my flash, but just ended up with a photo of my reflection. Instead, I had to set the ISO to Auto and photograph by available light. You can see the rope ladder in the background. 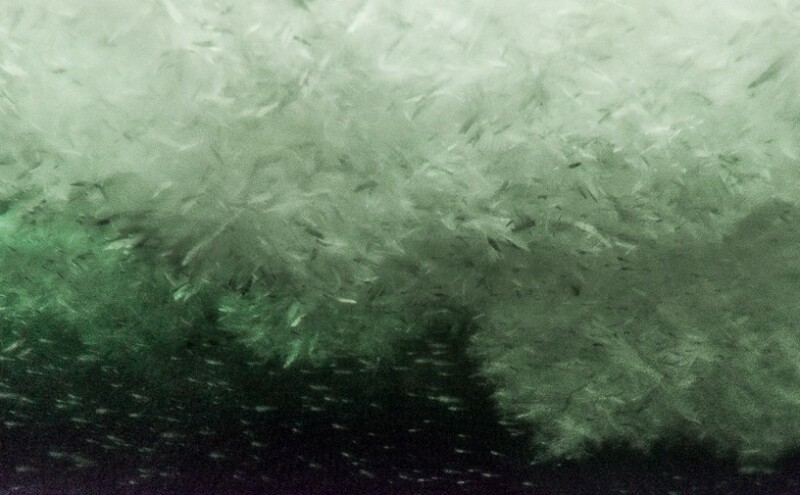 The Ob Tube provides a unique view of the underside of the sea ice, which is covered with mounds of platelet ice, clusters of thin, irregularly shaped slivers of ice, each a few millimeters thick and around one to four inches in diameter, that attach together at apparently random angles. 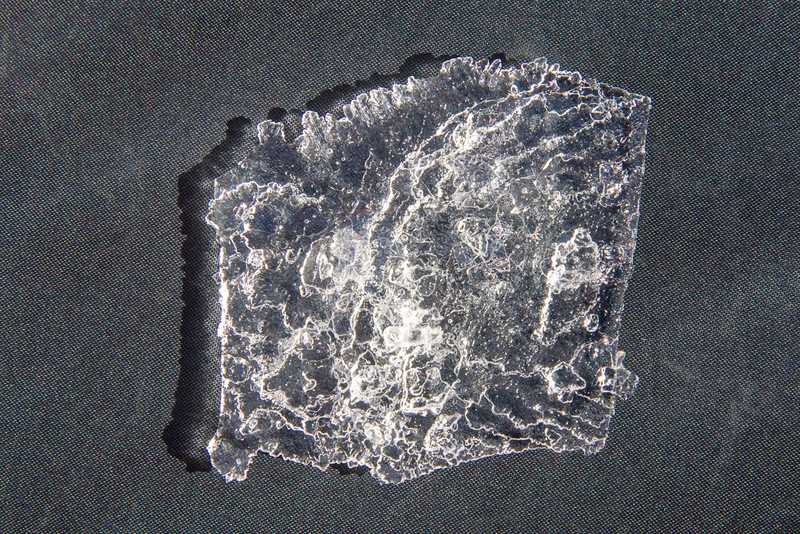 Composed of 80% seawater and 20% fresh water, platelet ice is a peculiarly polar phenomenon that Encyclopaedia Britannica’s sea ice article calls “perhaps the most exotic form of sea ice besides marine ice.” A scientific paper based on research at McMurdo explains that these “semi-consolidated” layers of ice can be anywhere from a few inches to several meters thick and in Antarctica are “commonly observed beneath sea ice in regions adjacent to floating ice shelves.” Located not far from the ice shelf/sea ice border, the Ob Tube is perfectly situated to observe platelet ice. 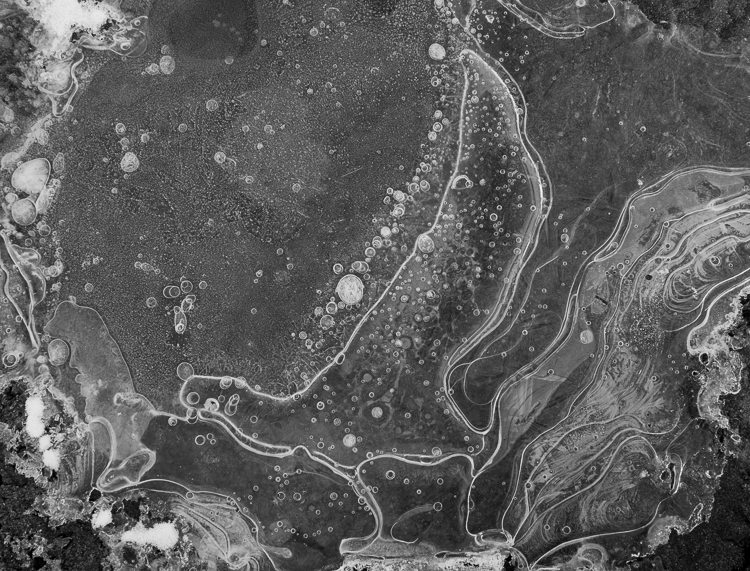 Mounds of platelet ice have formed beneath the sea ice above the Ob Tube. Exotic? Encyclopaedia Britannica thinks so. 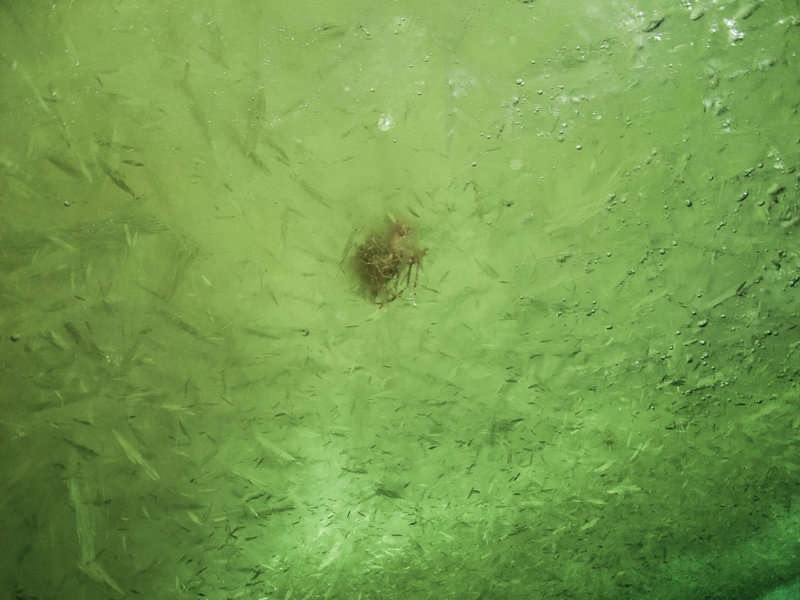 Outside the Ob Tube, large schools of tiny fish swam past. Umi, a doctoral student from UCSB, was diving for pteropods. A closer look at a single platelet. It’s a good thing Shaun and I got to the Ob Tube when we did, because a few days later, it was decided that it was time to pull it out and haul the dive hut back to dry land. 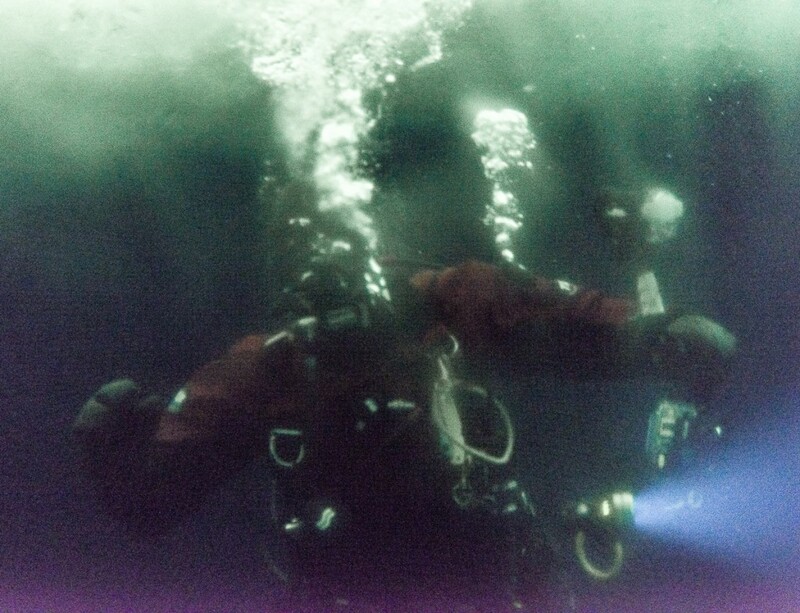 I went back to dive area on December 5th, when Gretchen’s team was making their last dive. 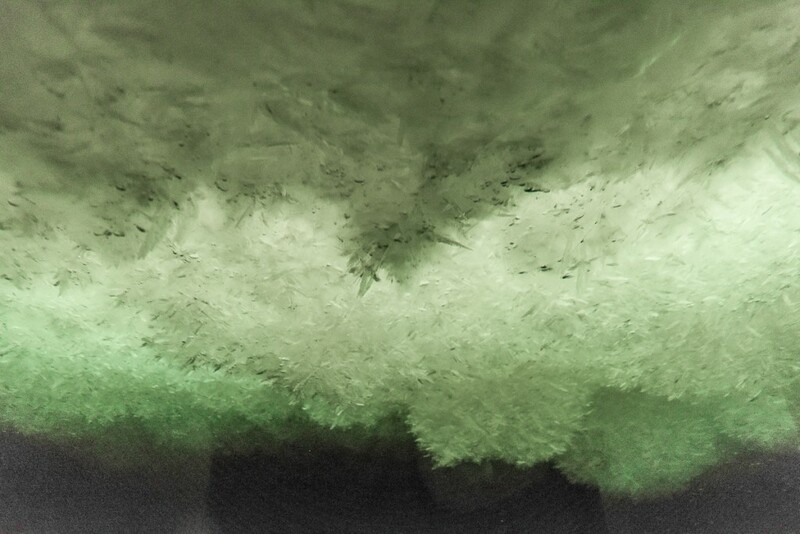 Steve Rupp, one of the two dive supervisors on staff at McMurdo each season, offered to take some photos of the outside of the Ob Tube for me, and to bring up some platelet ice for me to photograph up close. Elaine, my logistics coordinator, came along to help me. The plan was to scatter the platelets on some pieces of discarded tent fabric I’d borrowed from the McMurdo Craft Room as a backdrop, but periodic gusts of wind over 25 mph didn’t make that easy. 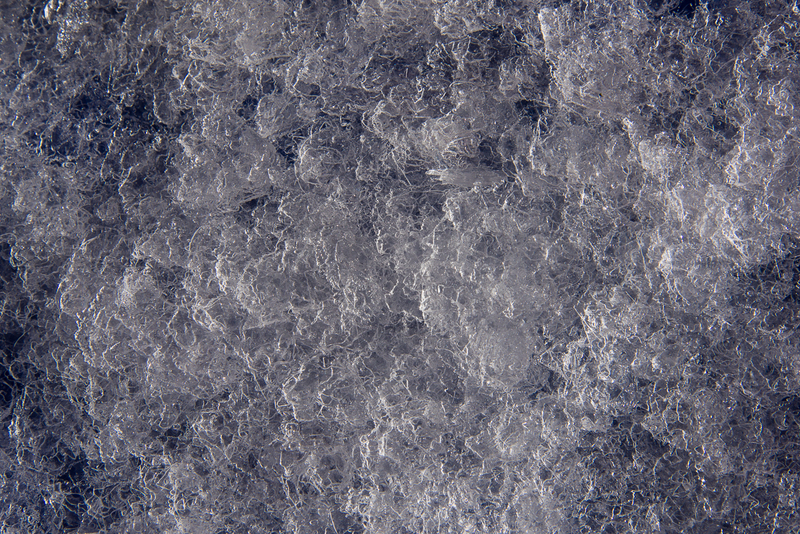 What you can’t see in this photo is Elaine, who is truly a good sport, comically sprawled on her stomach holding down the fabric with both arms, while I scattered handfuls of platelet ice from a plastic bucket and took pictures. 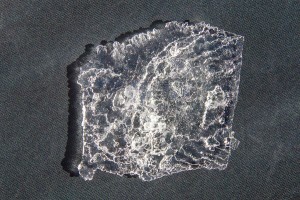 A quantity of platelet ice spread out on a cloth. 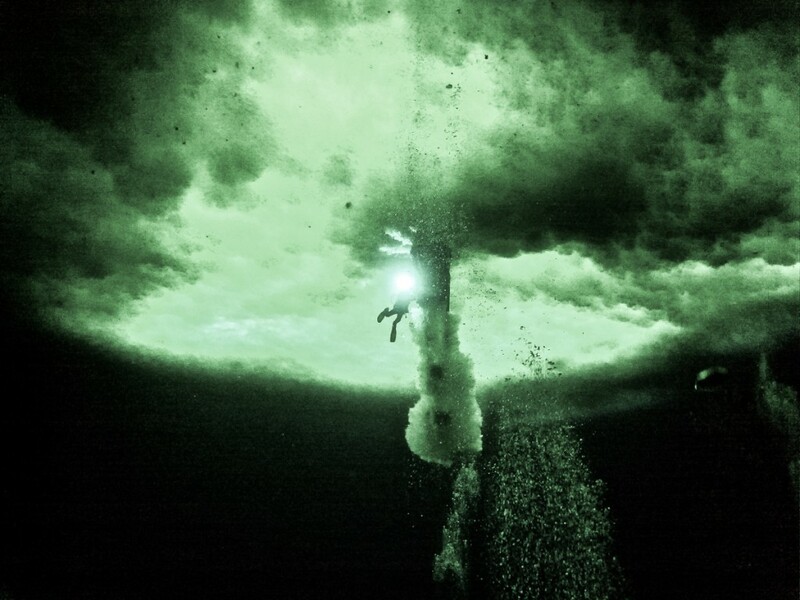 The dive hole inside the hut is where the scientific team divers enter and exit the water. 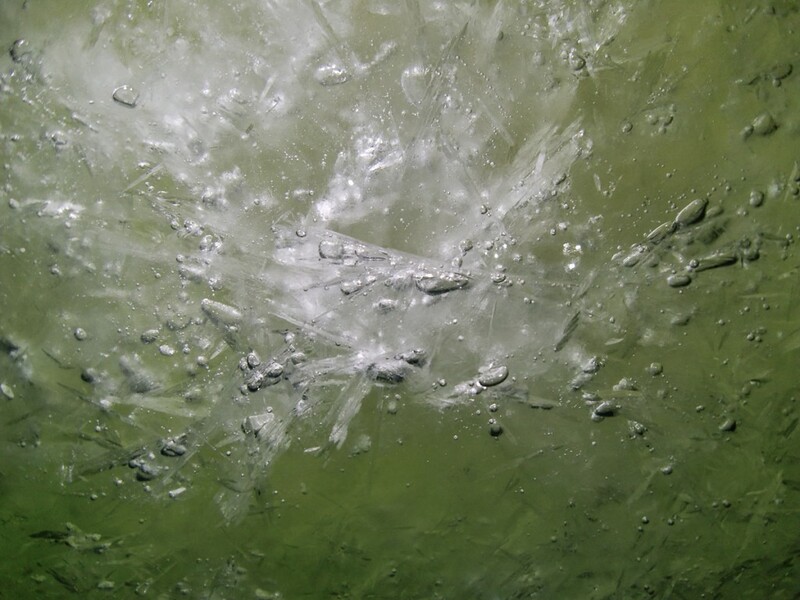 Close-up of floating platelet ice inside the dive hole. More floating platelet ice, illuminated from below by a light Steve was holding, and resembling a palette knife painting. Platelet ice also attaches to the bottom of the Ob Tube during the time it’s submerged. Photo: Steve Rupp. A grad student looks out the window of the Ob Tube. Photo: Steve Rupp. 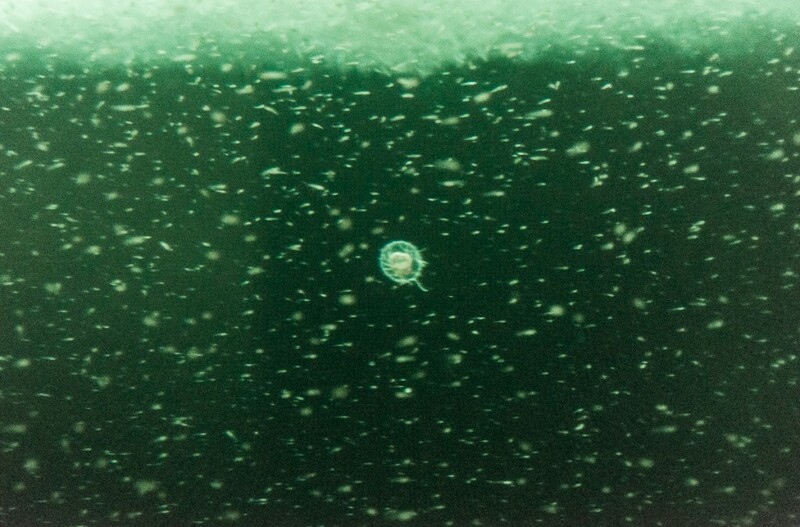 Not sure what this spiky ball stuck in the platelet ice is — a sea urchin? Photo: Steve Rupp. 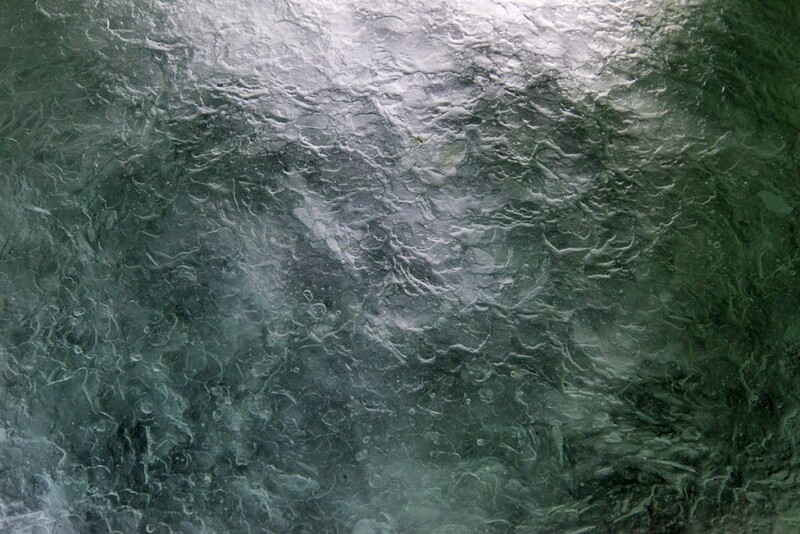 A closeup of the platelet ice beneath the sea ice surface. Photo: Steve Rupp. 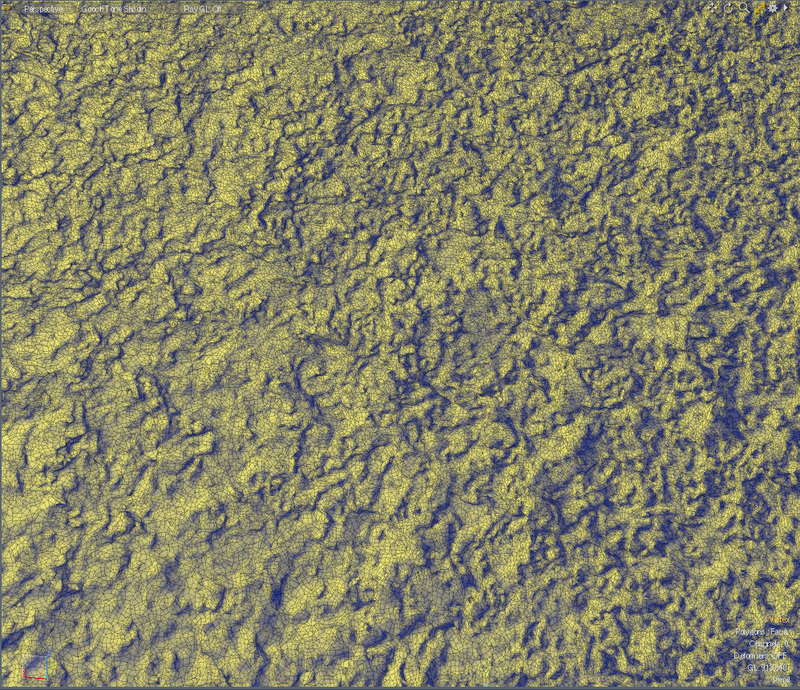 3D scan of the surface of loose platelet ice. 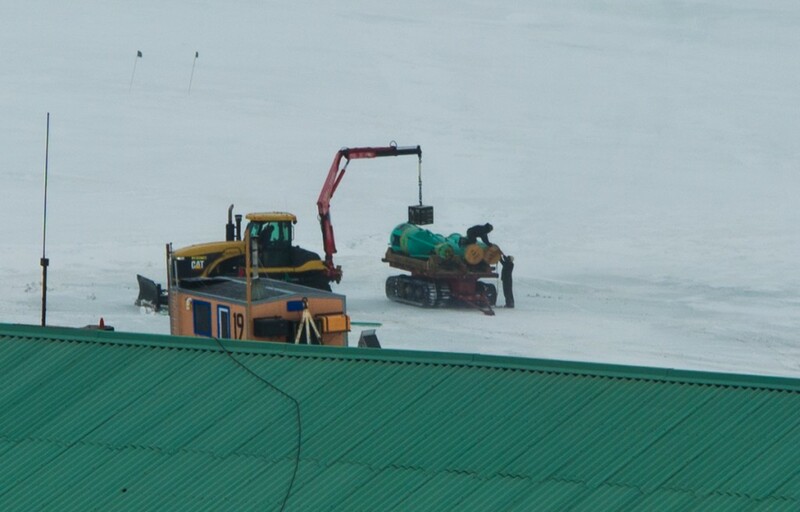 By December 8th, the sea ice was beginning to soften, so the observation tube at McMurdo Station was removed while they could still take heavy equipment onto the ice. Close-up of the Ob Tube removal. The orange dive hut is in the foreground. 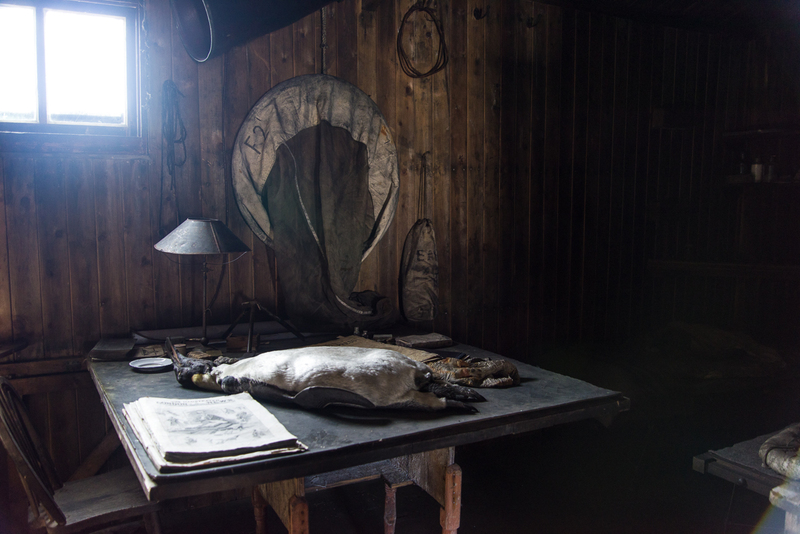 Inside the hut, a taxidermy Emperor penguin lies beside a copy of “The Illustrated London News” on a work table. 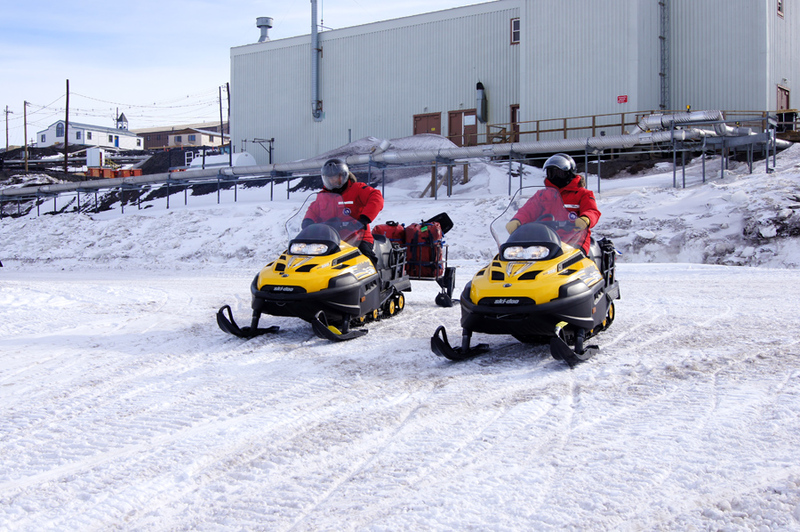 One day in late November, five of us took a day trip over the sea ice by snowmobile to visit Scott’s Hut at Cape Evans. 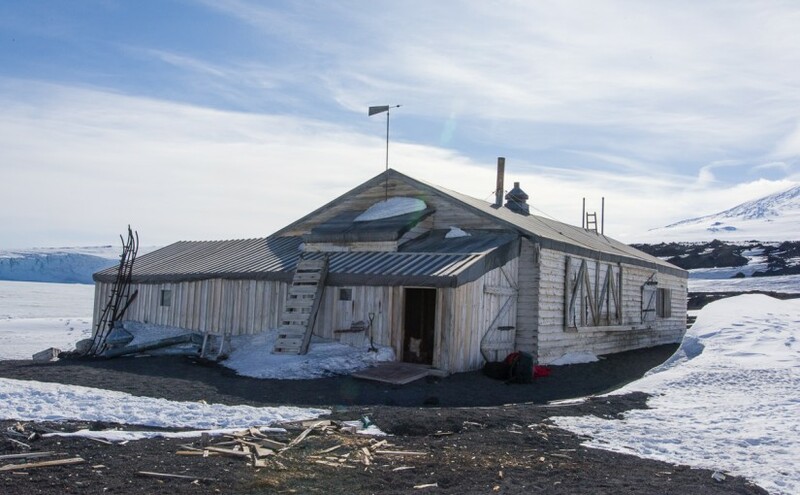 To paraphrase the words of a bronze plaque outside the building, the hut is protected by international treaty and maintained as an historic monument to the British Antarctic Expedition of 1910-1913 led by Robert F. Scott, who built it in January 1911 as the expedition headquarters. (Read a brief history of the expedition.) 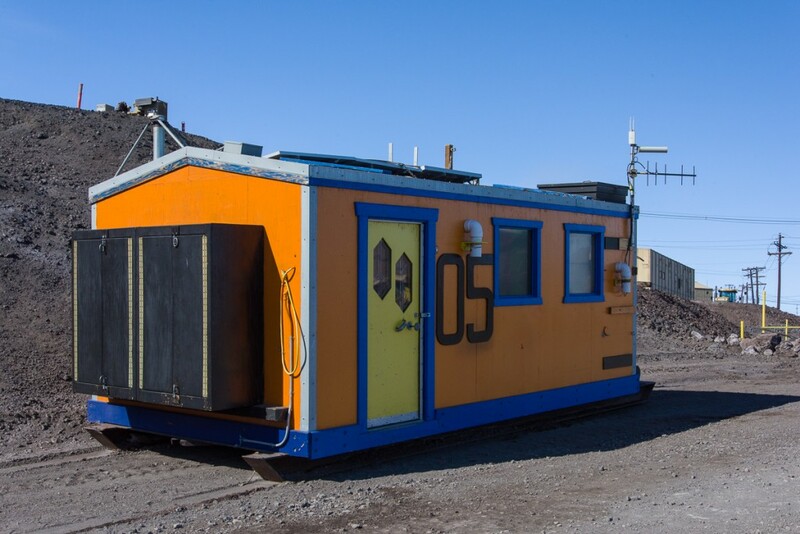 Like Shackleton’s Hut at Cape Royds and Discovery Hut at McMurdo, it is administered by an historic trust headquartered in New Zealand. To obtain a key and enter, at least one member of your party has to have received authorized training. I was amazed at how much stuff had been left inside, and because of the cold dry climate, it’s in a remarkable state of preservation. It’s like stepping across the threshold into a time capsule from 100 years ago. The half-buried anchor (the dark right-angled shape near the center of the gravel area) and an assortment of crates and other detritus have been left undisturbed for over 100 years. 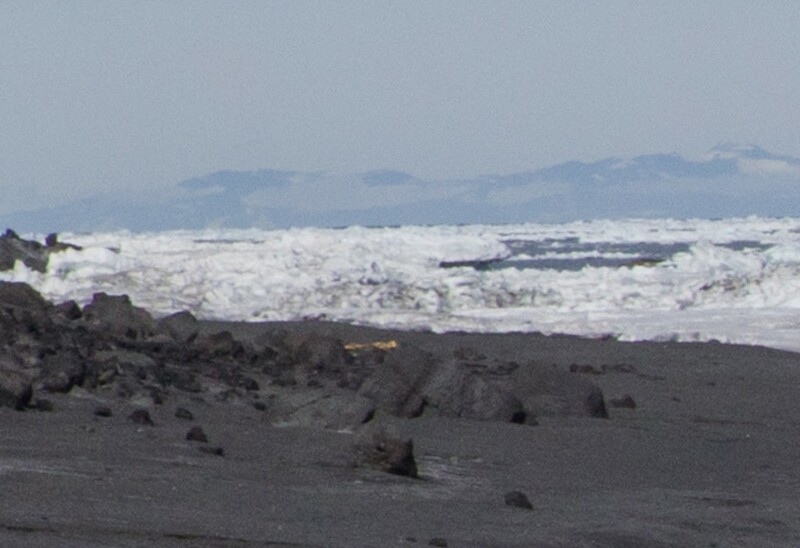 Like Cape Royds, the coast of Cape Evans is covered with volcanic gravel from Mt. Erebus. This view looks north from the top of Wind Vane Hill, overlooking the hut, where there is a memorial cross to three explorers who perished in 1916 (see next photo). Beyond the hut, on the sea ice, is a seal study hut. Along the ice edge on the right is the Barnes Glacier. To the left, on the sea ice, that dark spot is our snowmobiles. 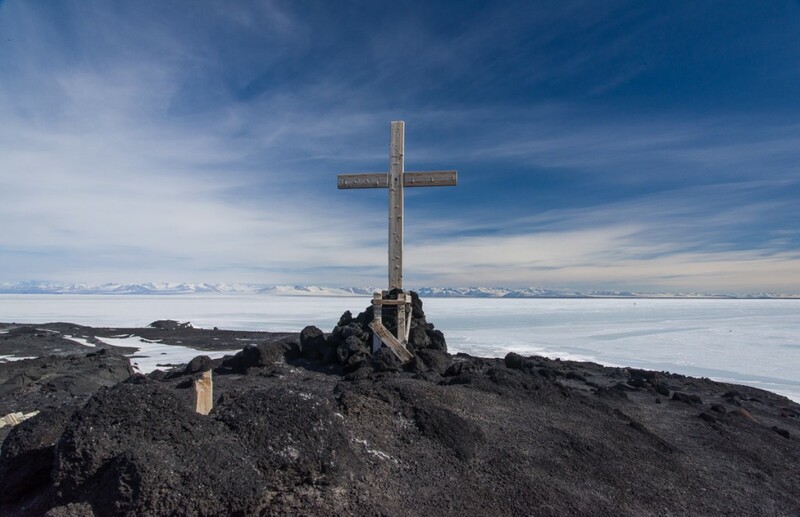 The memorial cross above Cape Evans was erected by the Ross Sea Party, led by Captain Aeneas Mackintosh, of Sir Ernest Shackleton’s Imperial Trans-Antarctic Expedition of 1914-1917, in memory of three members of the party who died in the vicinity in 1916. 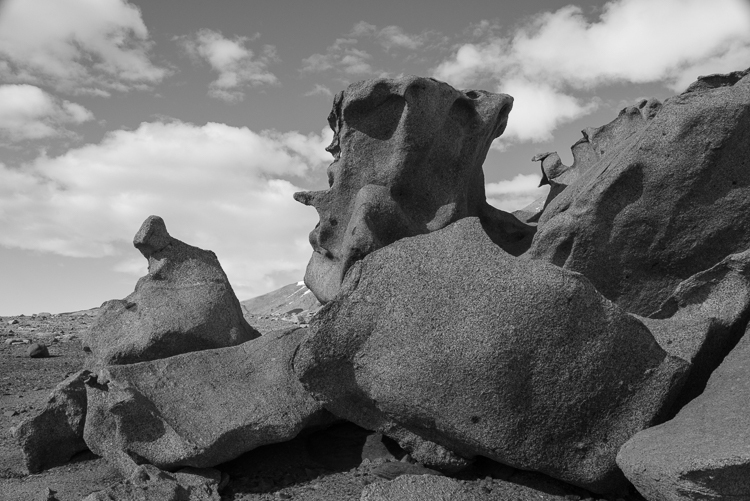 The trip was of particular interest to Shaun O’Boyle, a photographer who was the only other Antarctic Artists and Writers Program grantee whose residency overlapped with mine. 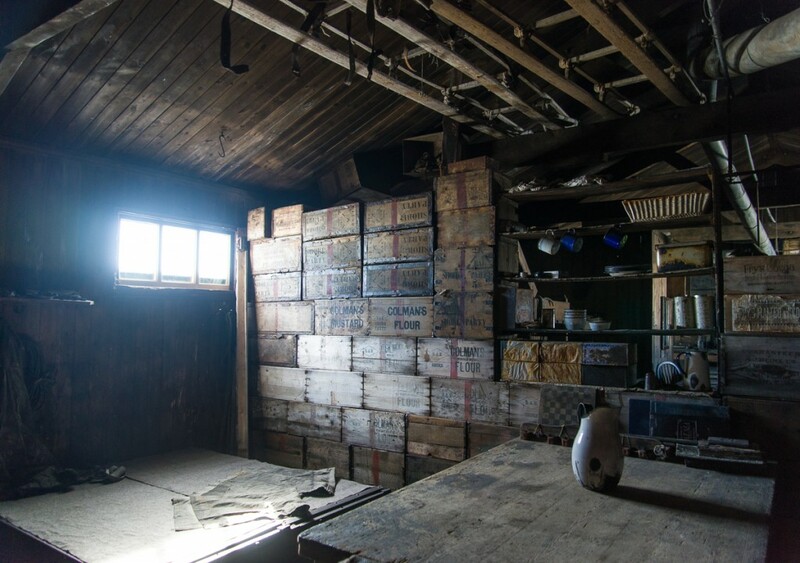 Shaun has a background in architecture as well as photography and his project, “Portraits of Place in Antarctica,” focused on documenting the buildings and manmade structures in the area around McMurdo from the past 110 years. Three Lockheed Martin staffers also came with us, McMurdo veterans Ralph Maestas, a videographer, and his colleague Joolee Aurand, who both also ran the base TV station, and Mike Lucibella, who was there for his first season as editor and reporter for The Antarctic Sun, the official news outlet for the U.S. Antarctic program. Cape Evans is the largest of the historic huts. 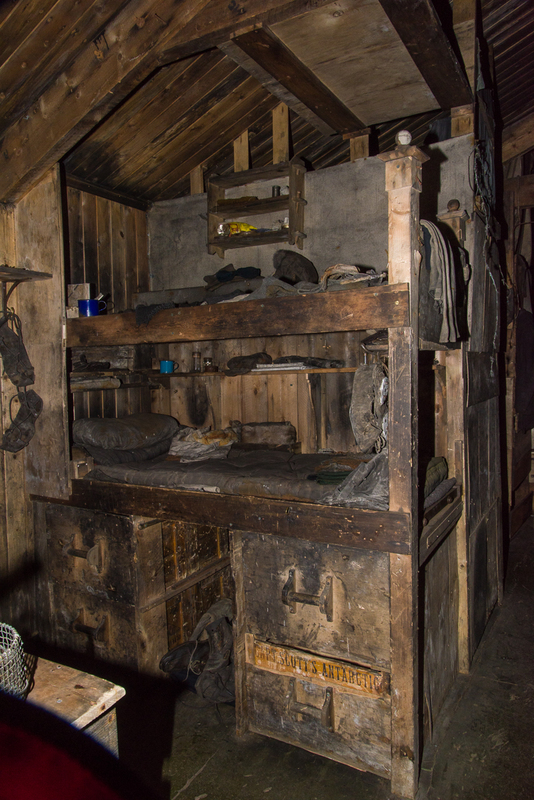 There is one large section where the men slept in bunk beds, cooked, kept their medical supplies, had a darkroom for photography, and work tables for their telegraph and laboratory equipment. Seeing the crepuscular light shining in through dusty windows onto the dark wooden walls, old pitchers and crockery was like walking into a painting by Vermeer or Chardin. What surprised me was how much stuff the explorers left behind. Did they think that maybe other explorers would make use of them in the future, or was it just too much trouble to pack it up and take it home to England? Whatever their reasons, they left not just equipment and leftover tins and crates of food, but personal items: wool socks, fur boots, blankets, bedrolls, and arrangements of photos glued to boards for decoration. Not to mention a copy of the London Illustrated News and a large, stuffed Emperor penguin. Cape Evans still life: entering the main room, a shaft of light illuminates a wall of wooden crates and a porcelain pitcher. 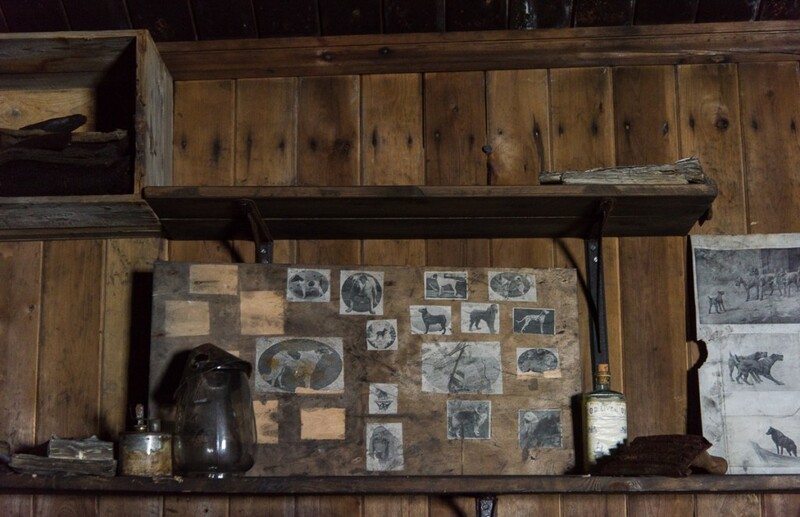 The men decorated the walls with arrangements of photos attached to boards. Somebody was a dog lover. The kitchen is still stocked with provisions, dishes and cookware. 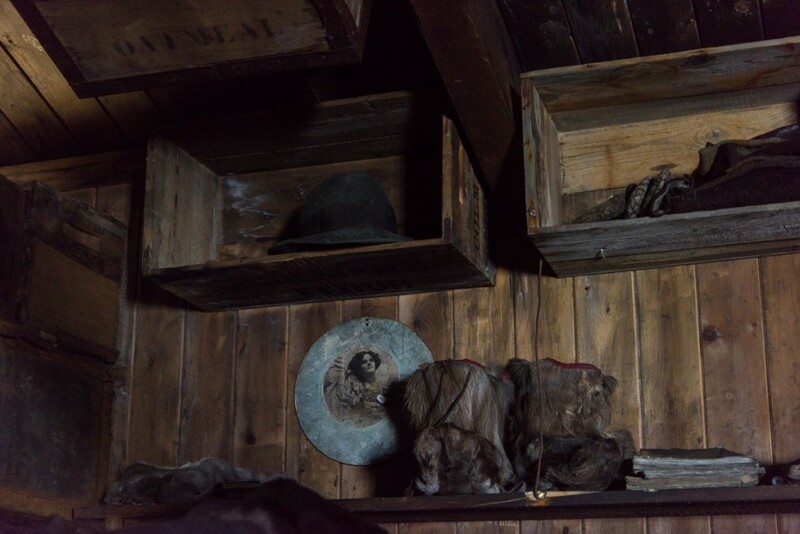 Another photo on the wall, beside a pair of sealskin boots. 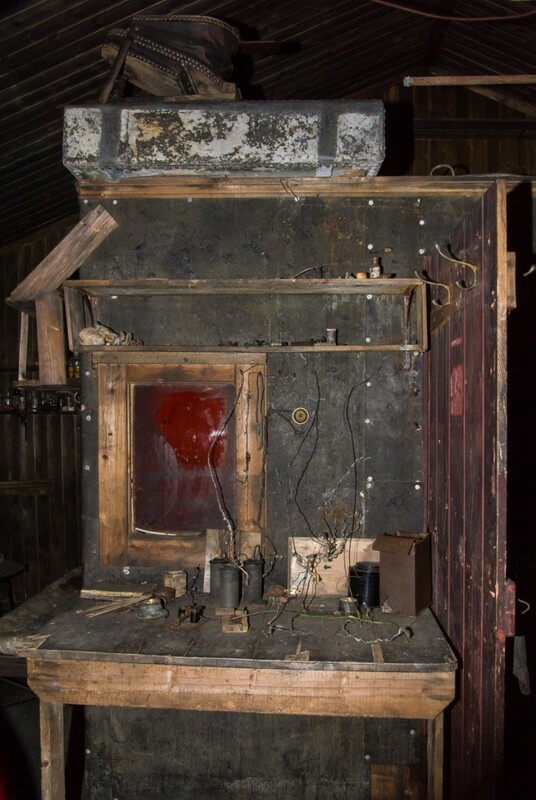 Cubbyholes had been fashioned by nailing empty wooden crates to the wall. Bunk beds with pillows, blankets and personal items that were left behind. The laboratory table was squeezed in between two bunks (it faced the bunks shown in the previous photo). 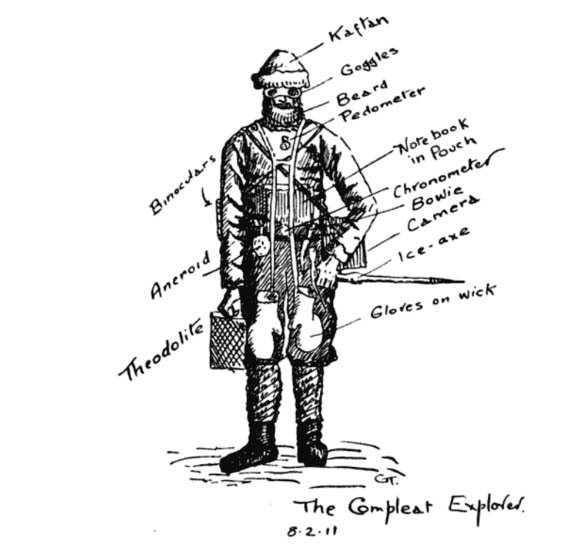 In addition to reaching the South Pole, an important goal of the expedition was to collect scientific data. What remains of the Cape Evans communications center. I suspect they did take home the good stuff. 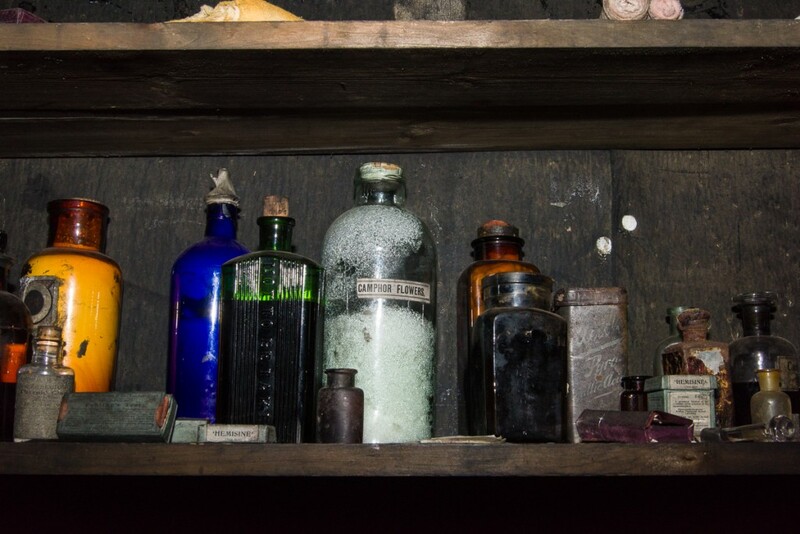 A small partitioned area in the back had long shelves along two walls lined with boxes of bandages and bottles of chemicals and medicines, includes bygone remedies such as camphor flowers (center) and the small green box on the right, labeled “‘HEMISINE’ (Trade Mark) A permanent Solution of the crystalline active principle of the super-renal gland.” It bears an advisory to store in a “cool dark place” — can’t get much cooler and darker than here! To the left of the Hemisine is a metal container of pyrogallic acid. It was either being used as a photographic developer or, despite what we now know about its toxicity, a remedy for skin conditions. Shaun was in his element here. He’s interested in history and loves photographing in old buildings. That stack that looks like a burned mattress drenched in tar is actually a 100-year-old pile of seal blubber. Exiting the living area, an enclosed corridor led to the stables and contained a bed-sized pile of seal blubber, blackened with age. 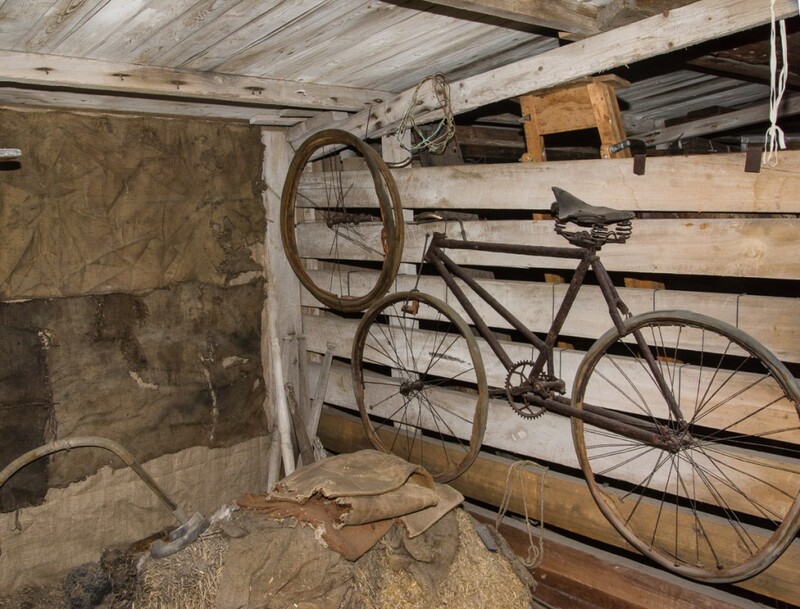 Around the corner were stalls with even more boxes of supplies, tools, equipment, as well as decidedly more curious leftovers such as a box of penguin eggs, a hand-carved wooden wheelbarrow, a bicycle (a bicycle? in Antarctica? ), and accessories for what turned out to be an ill-advised idea to use ponies for transportation. 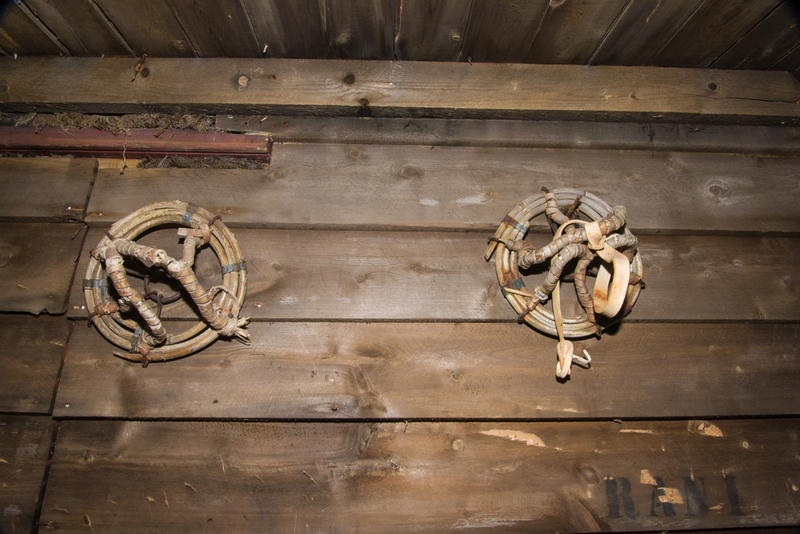 A couple of snowshoes for horses hang on one wall. We noticed some names stenciled on the same wall, and were puzzled at first, until realizing that those were probably the names of the horses. The stables were used for storage. 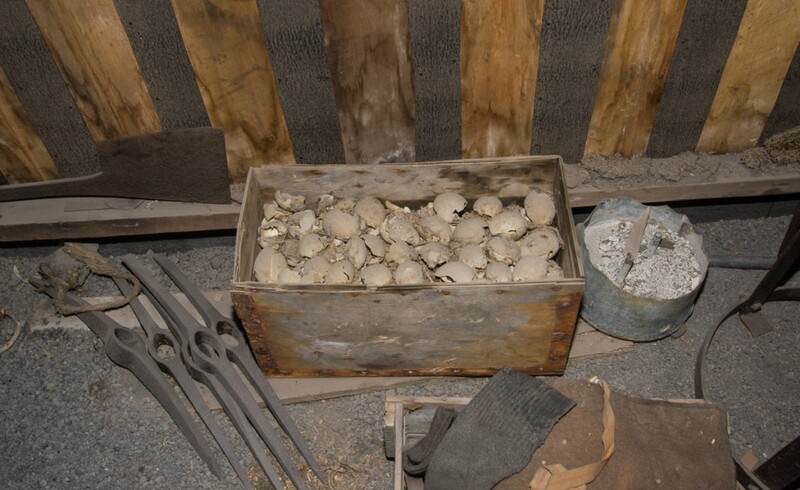 Here’s a box of penguin eggs collected for scientific study and some extra pickaxes, minus handles. 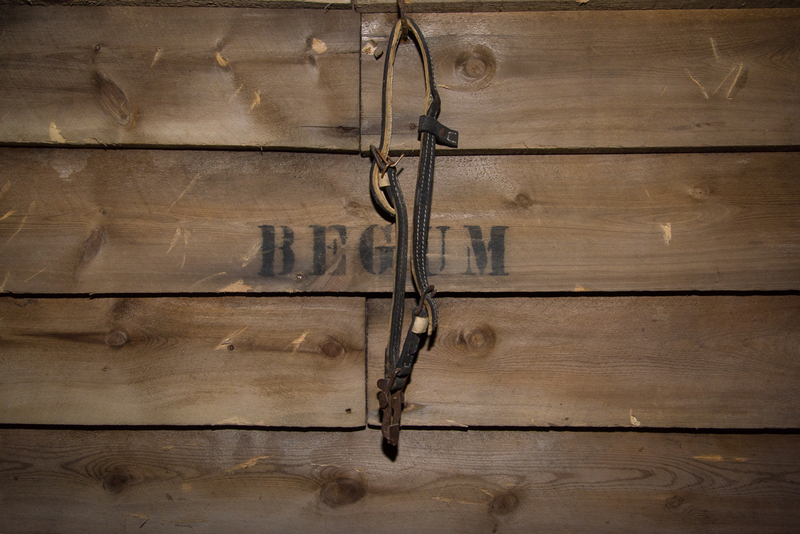 Begum, whose name is stenciled on the stable wall, must have been one of the ponies. You didn’t know they made snowshoes for horses, did you? They even brought a bicycle to Antarctica. I doubt it got much use once they arrived. Not sure where they were expecting to ride a bike with skinny tires. 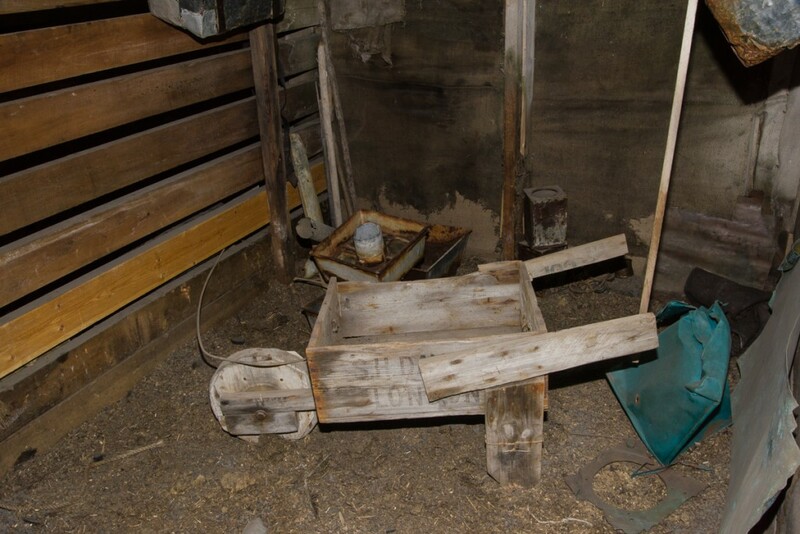 Someone made a mini-wheelbarrow from a wood crate and a hand-carved wheel. 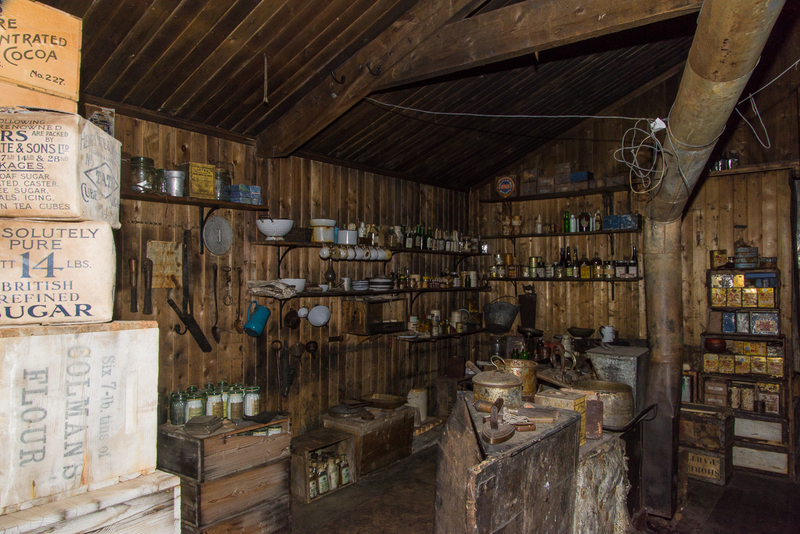 You might be wondering — as we did — how much of this was authentically left as is and how much of it was rearranged and staged by the New Zealand historic trust staff who maintain the huts. 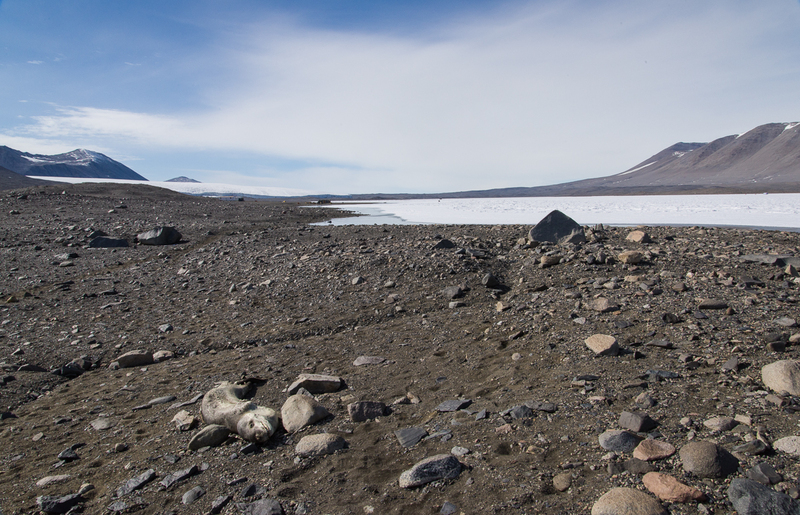 A few weeks later, I was sitting in the field camp hut at Cape Royds one evening with penguin researchers Katie and Jean, when one of them heard some voices in the distance. “Here come the Kiwis,” she said. Al Fastier, the program manager for the historic sites; conservator Lizzie Meek; Martin Wenzel, a restoration carpenter; and two young women who were assisting them had been working down the hill at Shackleton’s hut for the past several days. They were about to leave and came in to say goodbye, a bottle of Scotch in hand. We managed to make room for all eight of us and their parkas in the small room (I think it was no larger than 12 x 15 feet, including the camp stove, plywood desks along one wall, propane heater, wash-up station and boxes of food). 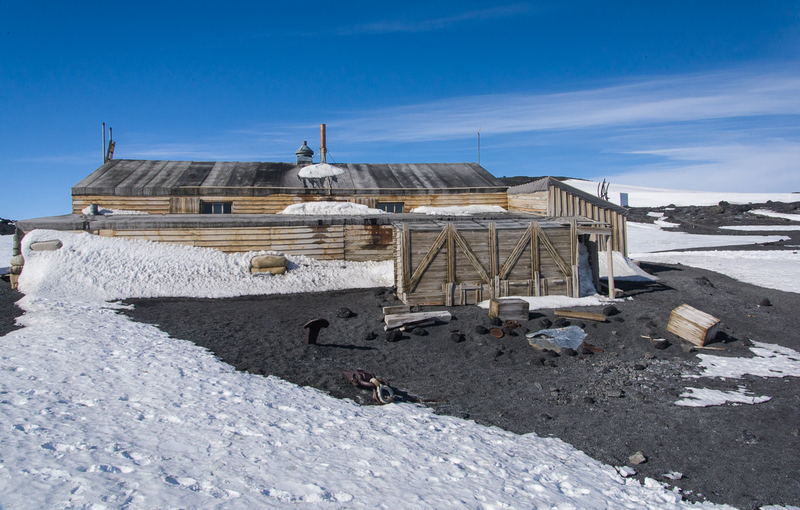 I had not been issued a permit to visit Shackleton’s hut before going to Cape Royds, so I had not gone in. 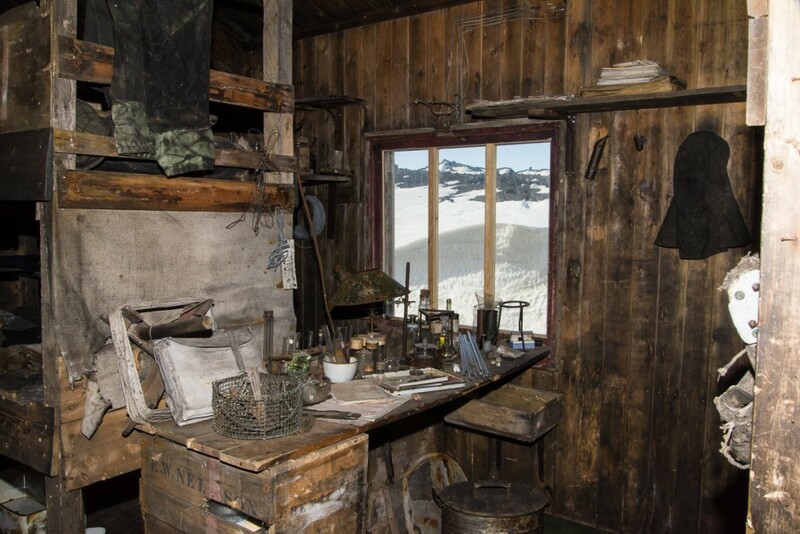 I asked them about something I’d heard from somebody else, that Shackleton’s hut was less staged and in a more natural state than Scott’s at Cape Evans. This made the Kiwis smile. Actually, they said, it was the other way around. 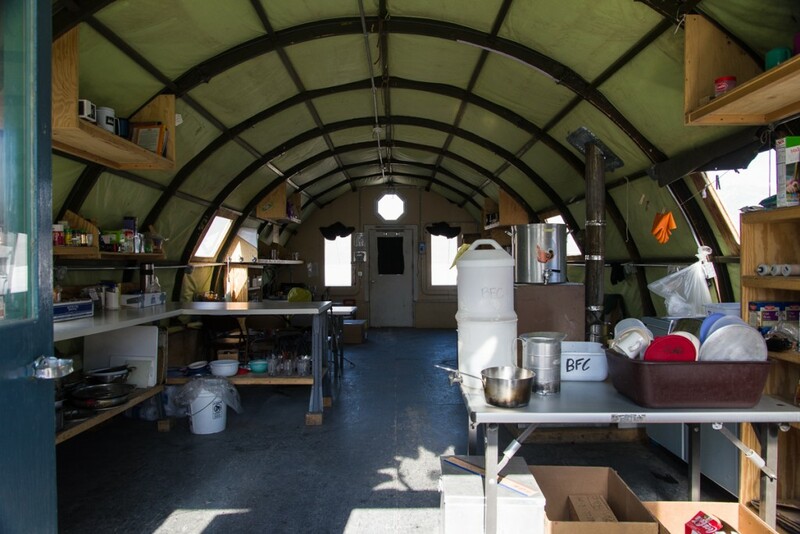 Katie noted that when she first started to coming to Cape Royds in the early 2000s, the items inside were in more disarray, and in a way she preferred it that way; you felt more of the human presence. The Kiwis acknowledged that over time items had been removed for conservation, then put back, and that there was a balancing act between protecting them and making it possible for visitors to walk around, while not going overboard with arranging. 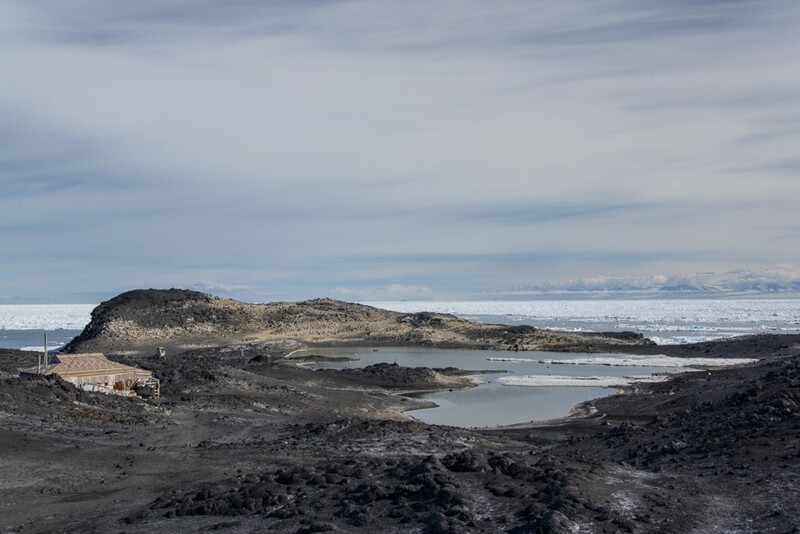 Shackleton’s Hut at Cape Royds is on a hill overlooking Pony Lake, the sea ice, and the Adélie penguin colony (the bluff with tan patches is where the penguins nest). Conversation turned to a hot topic this season: the so-called “Shackleton’s axe” — authentic or hoax? The helicopter pilots had recently noticed a pickaxe sticking out of the top of a tall, pointy-topped mound of volcanic gravel, the metal part wedged into the gravel and the handle pointing up at a jaunty angle. 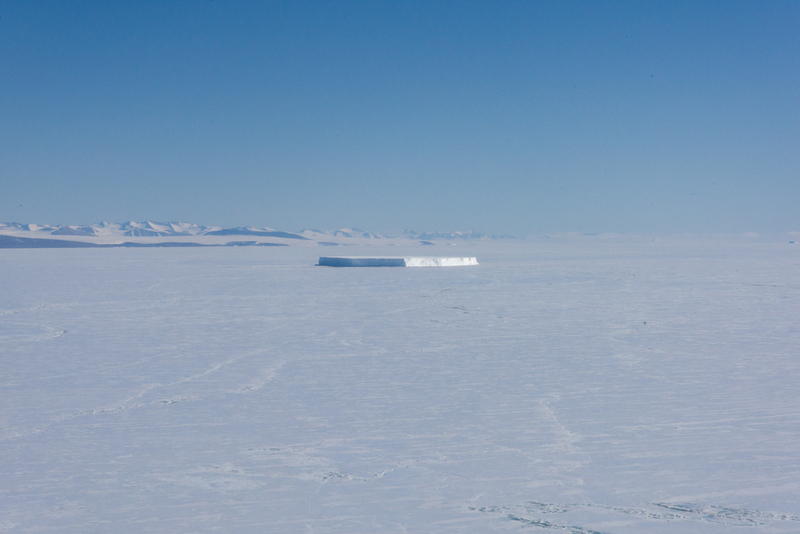 On the flight to Cape Royds, our pilot had pointed it out to Evan and me and said it was two miles by air from the field camp. That doesn’t sound like much, but over rugged, hilly terrain, it would be a considerable hike. The sudden appearance of the axe poking out of the pile, even in midst of that forbidding and remote area, struck many people as a possible prank. Lizzie said she’d looked at high-resolution photographs of it and that the markings on the axe were consistent with the period so it plausibly belonged to Shackleton’s party. 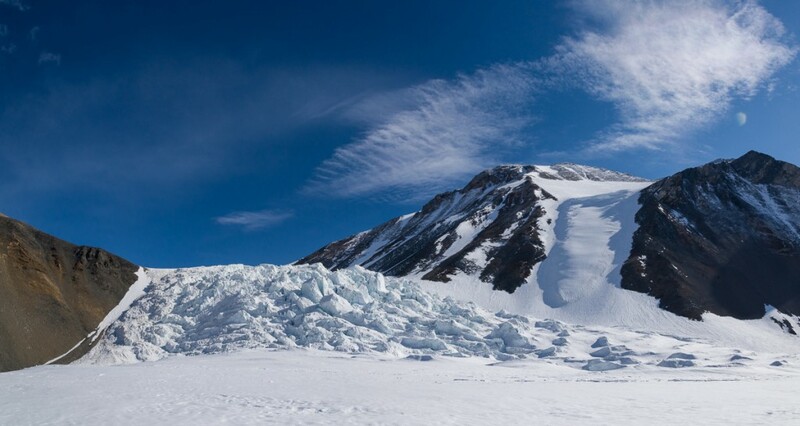 Al said that it was plausible that the mounds were used as landmarks for supply caches for Shackleton’s epic trans-Antarctic journey and that an axe could have been stuck in the top to help the expedition team find it. That makes sense, though as Jean pointed out after they’d left, why it seemed to suddenly appear, and at a picture-perfect angle, remains an open question! Shaun’s blog has some good photos of the pickaxe, and indeed, of the Cape Evans hut and the other two huts. 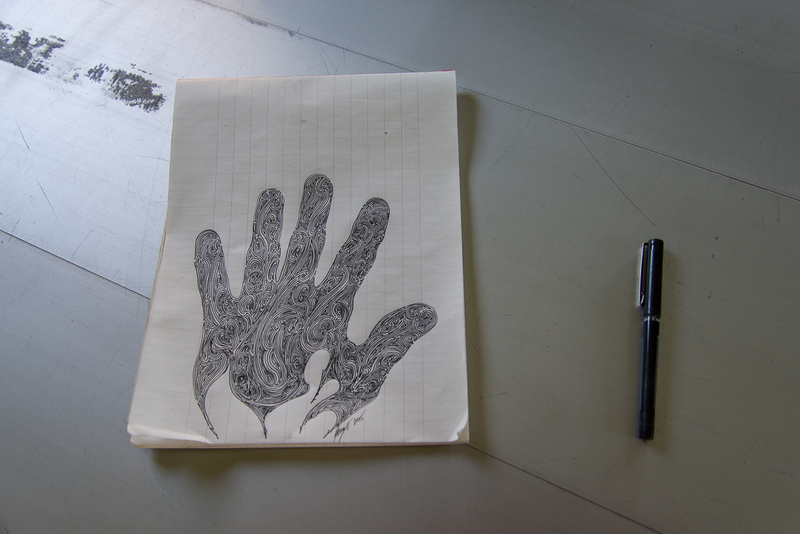 They’re worth checking out to see a different approach to the same subject matter than mine. For one thing, he processed his photos mostly in black and white, for another, since this project was specifically about architecture he spent a lot more time in the huts than I did, returning for repeat visits. In general I’ve found it interesting to compare our photos of the same places, seeing which places where we chose similar shots and where our different interests and personalities emerge. 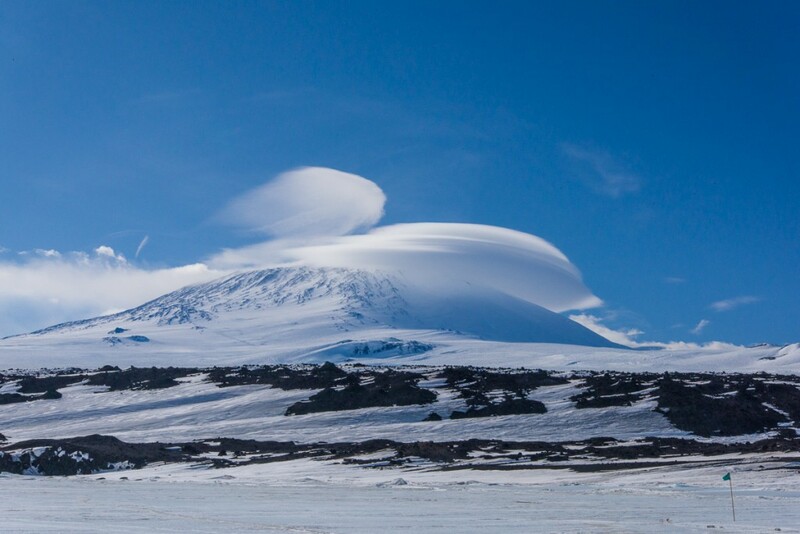 Note: Cape Evans is where I took a photograph of an unusual cloud formation over Mt. Erebus that the Cloud Appreciation Society, a large online database of cloud images and information, chose as its January 2016 Cloud of the Month (see below and earlier post). Cap and banner cloud atop Mt. Erebus from Cape Evans, AKA the Cloud Appreciation Society January 2016 Cloud of the Month. I took this photograph of the Canada Glacier from a helicopter a few days before hiking there. It gives a good overview of where we went on the hike. Lake Hoare is on the left, Lake Fryxell on the right. Halfway up the hill are the ice falls and the long tongue-like glacier that I photographed at close range in some of the pictures below. The evening of December 18th, I shook the snow off my tent from the snowstorm earlier that day and spent my first night at the Lake Hoare field camp. Though the dense fog and gray skies lingered long after the snow stopped, camp manager Rae had checked the forecast and said the skies were expected to clear overnight. Sure enough, in the morning we awoke to bright sunshine. I set out on a day hike with Renee, Rae’s assistant at Lake Hoare, to cross over the Canada Glacier and visit the eastern side, which faces Lake Fryxell. 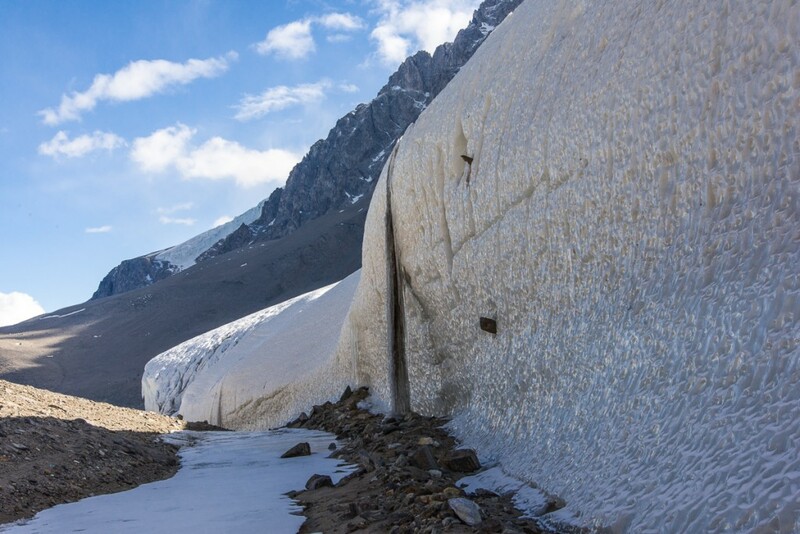 The Canada Glacier snakes down from Mt. McLennan, which is about 1,600 meters (5,250 feet) high on the north side of the Taylor Valley. 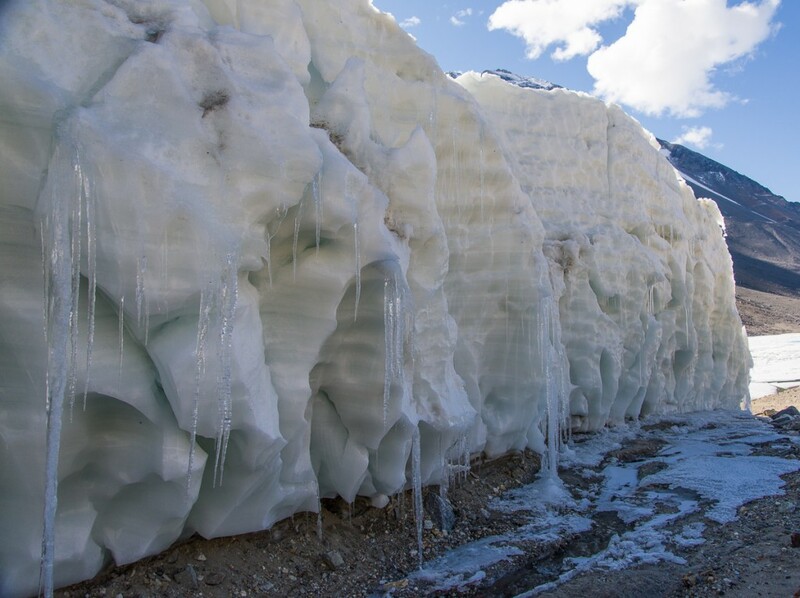 The Lake Hoare camp is nestled beside the western side of the glacier, a tall wall of ice with a relatively smooth and rounded profile reminding me of an adobe house. In the course of walking over it and visiting the other side, I would see that the other side of the glacier looked very different. 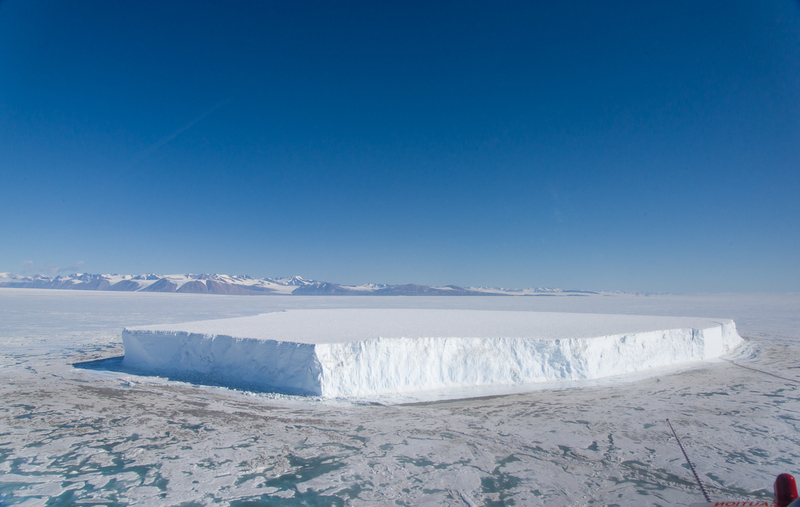 Panorama of the Lake Hoare side of the Canada Glacier beside the field camp, a smooth wall of gently rounded forms punctuated with vertical slits of deep blue ice, the very top of which is about 10 meters (32 feet) high. 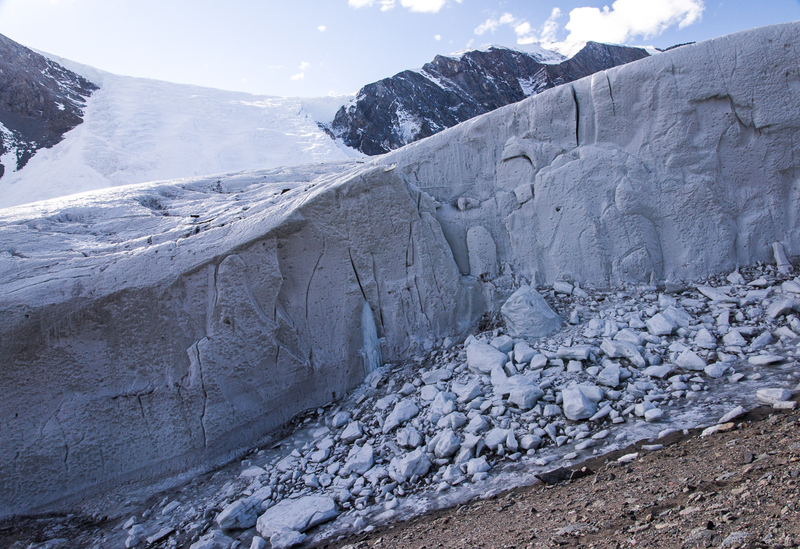 Beside the lake, a section of the glacier has crumbled and fallen into a pile of ice chunks. The glacier was named during Robert F. Scott’s 1910-13 expedition in honor of a Canadian who was a member of the team, Charles S. Wright. Renee is an avid hiker who runs a backcountry lodge at Glacier National Park in Montana during the summer. Before we left, she told me, “I always hike with poles,” and offered to let me use one of hers. In all my years of hiking I had never had used walking sticks or poles; they’d struck me as just another thing to carry. But I figured this was not familiar terrain and if as strong a hiker as Renee relied on them, I’d follow her lead. We started up the steep rocky moraine beside the Canada Glacier with the stream ecology team, who were planning to take water samples at various locations. Beside the glacier are piles of large and medium sized rocks and the Andersen Creek, fed by meltwater that comes off the glacier, but it was still so cold and shady in that area that the stream sampling team was having trouble finding thawed meltwater to collect. 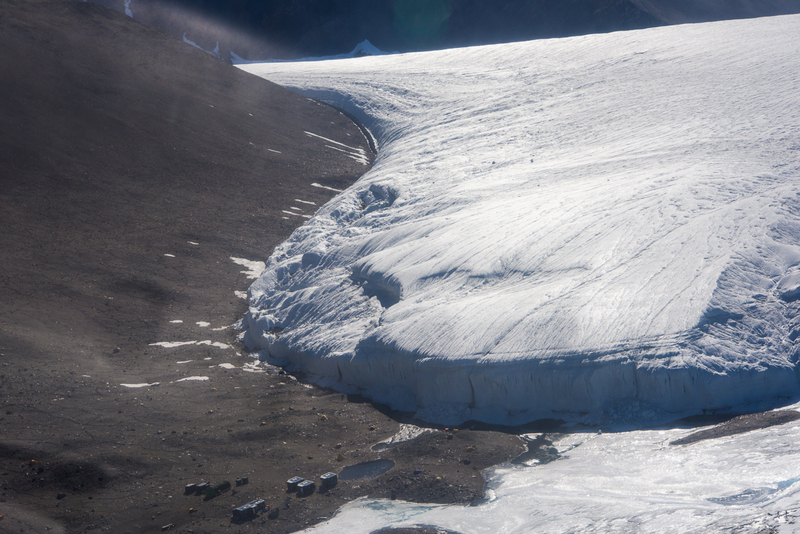 When we came to an area where the top of the glacier flattened out, we parted ways as they headed for another of the sampling spots. Renee and I put crampons on our boots and headed toward the ice falls, a slope where gravity had creased the glacier and separated it into rows of irregular boulder-sized chunks of blue ice. 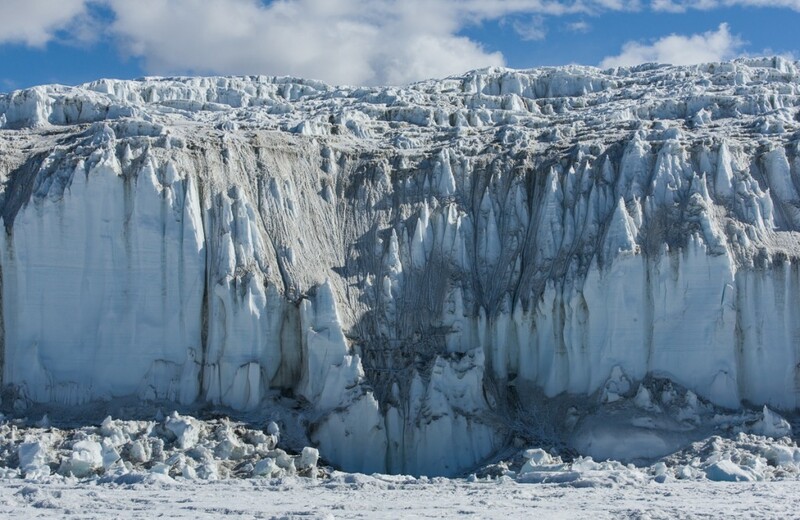 To the right of the falls, an enormous tongue-shaped section of the glacier clings to a steep face of Mt. McLennan. When we got on top of the Canada glacier, we approached the ice falls. We got close enough for me to photograph it, but it’s not safe to walk up to the edge. 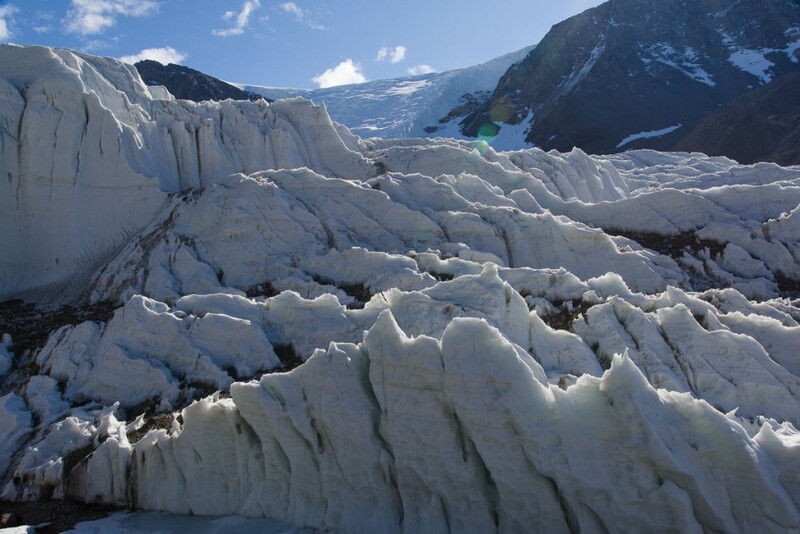 To the right of the ice falls, this enormous tongue-shaped section of the glacier flows down a steep rocky slope. 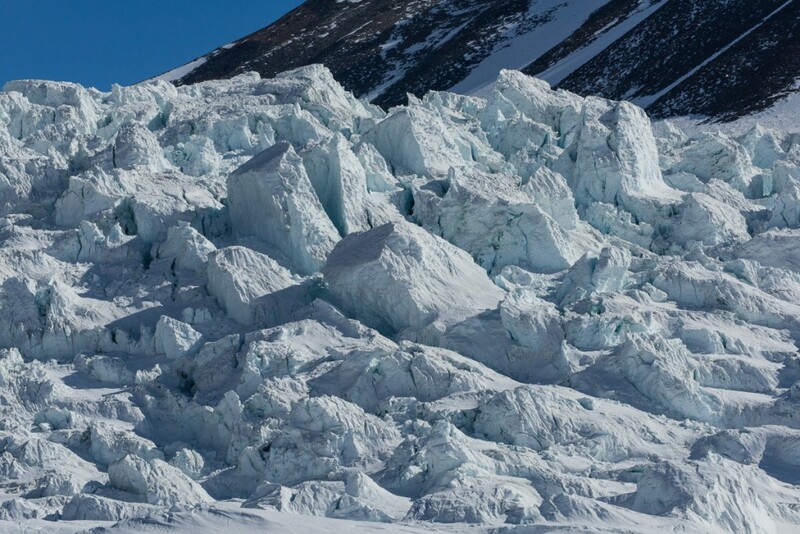 Ice sculpture: enormous chunks of blue ice form creases, ridges and terraces on the hillside. On the south side of the valley across from the Canada Glacier, the Kukri Hills were dusted with the previous day’s snow. Before that, they were mostly bare and brown. 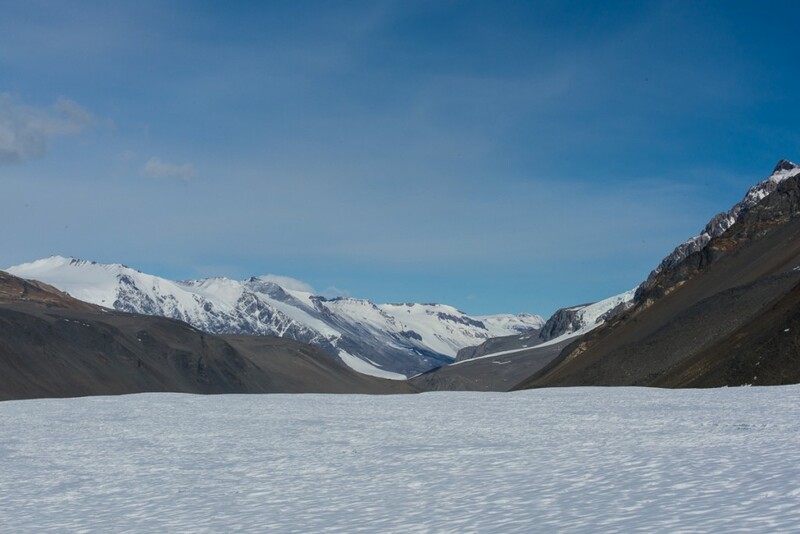 View of Taylor Valley from on top of the Canada Glacier. Our next destination, Lake Fryxell, lay ahead to the east. We were up high enough to see the ice-covered summit of the Mt. 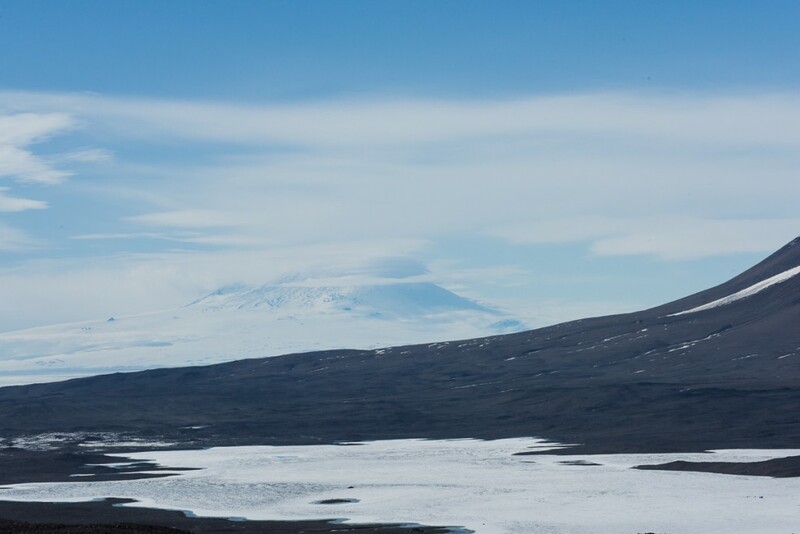 Erebus volcano in the haze across McMurdo Sound about 13 miles away. After crossing the glacier to the gravel hill on the other side, we ate lunch in a sheltered spot, then headed downhill towards the Lake Fryxell field camp. Our plan was to get in the ATV that stays on the sea ice during the research season and double back across the lake ice to have a closer look at the Fryxell side of the Canada Glacier. Lake Fryxell from the Canada Glacier. The 12,448-ft. summit of Mt. Erebus, about 13 miles away, can be glimpsed through the haze. 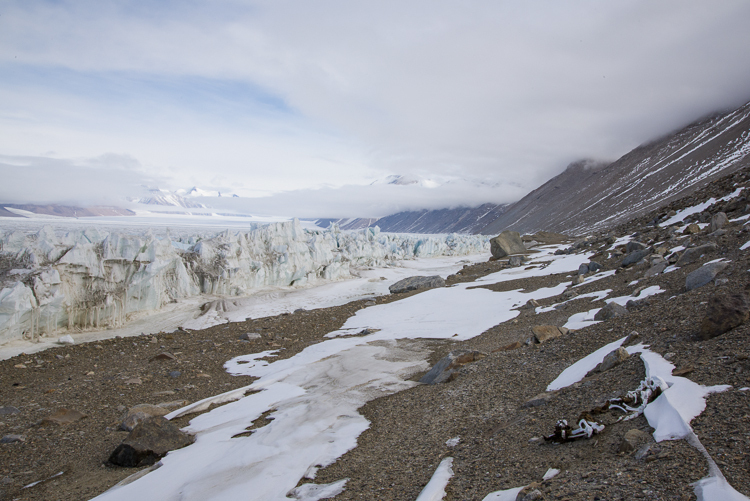 One square kilometer adjoining the Lake Fryxwell side of the Canada Glacier on the lower part of the hillside (to the left in the above photo) is off limits to all except scientists with government-issued permits. 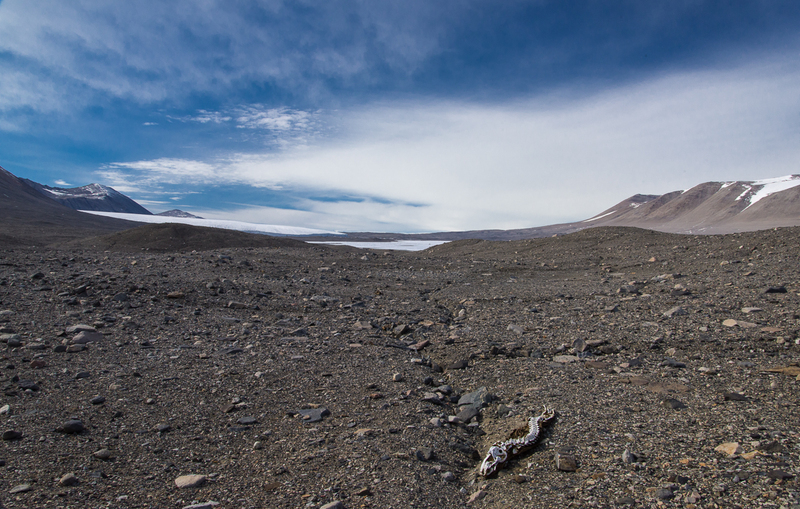 Hiking across the gravel to Lake Fryxell we encountered the first of two mummified seals. I made a tentative ID of the one below as a crabeater seal, based on its teeth. 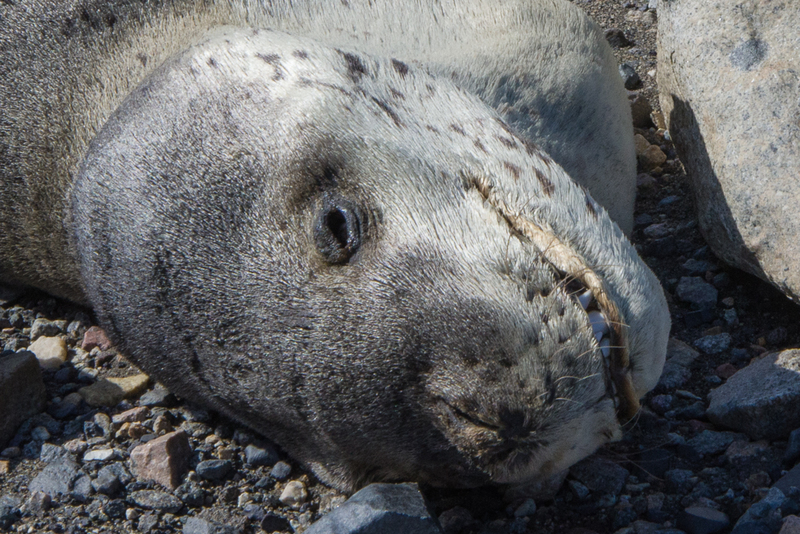 The three types of seals found in this part of Antarctica — leopard seals, Weddell seals and crabeaters — all have different shaped teeth. 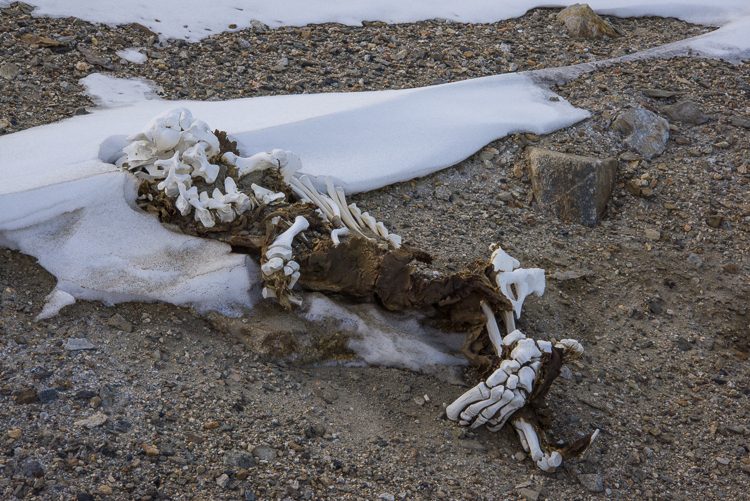 On the way from the Canada Glacier to the Lake Fryxwell camp we encountered a mummified seal that was mostly reduced to a skeleton. 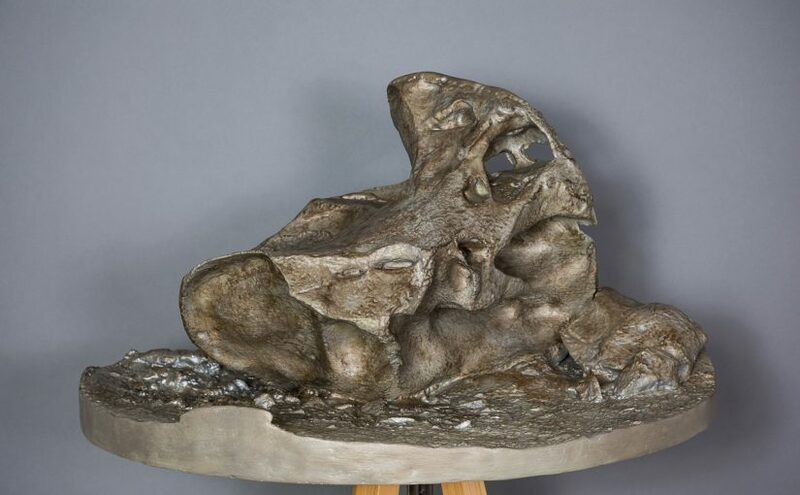 The animal must have been very disoriented as it laboriously crawled over the land, because it died headed in the opposite direction from the sound after traveling several miles. In the distance the small white wedge in the center is Lake Fryxell. Beyond that on the left, is the Commonwealth Glacier. 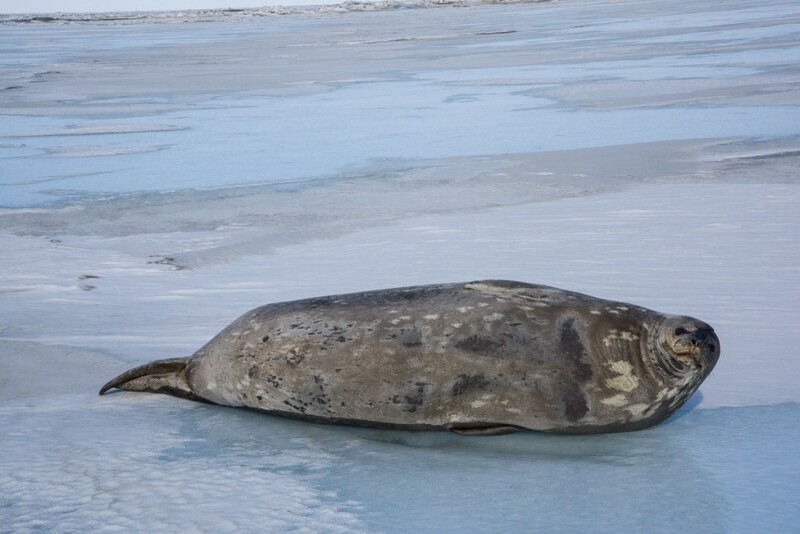 The next seal we encountered was easily identified as a leopard seal, because due to the freezing temperatures and the lack of organisms such as bacteria and insects, it still had its fur, even though, according to the people at Lake Hoare, it had died there about three years ago. Leopard seals are ferocious predators — when I asked Sam Bowser if his dive team ever saw them at New Harbor, he responded, “No! And I wouldn’t want to.” Leopard seals could attack the divers. Weddell seals, which the divers often do see, are essentially harmless and non-intimidating, even though they weigh over 1,000 lbs. But even a young leopard seal that had drawn its last breath a few years ago looked somewhat sinister with it’s long powerful jaw. Between the Canada Glacier and Lake Fryxell we approached a more recently deceased seal. 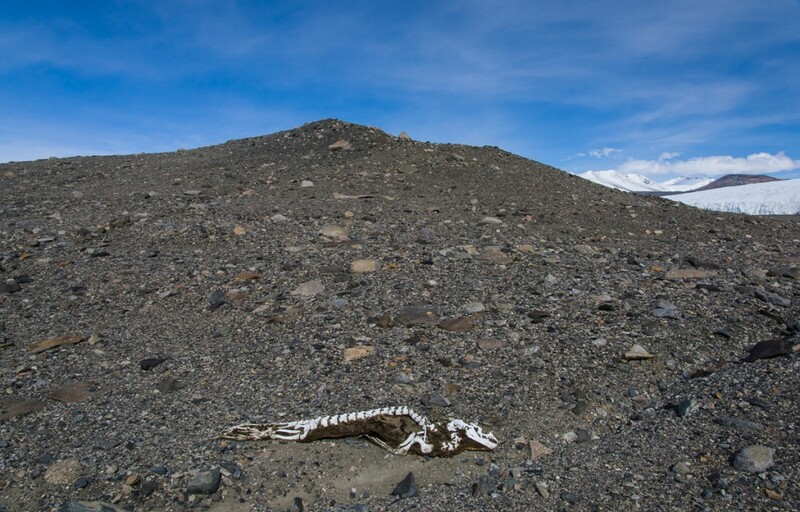 It’s difficult to determine how long most of the mummified seals of the Dry Valleys have been there, but because this area is frequently traversed by scientists during the research season, they know it showed up around three years ago. Close-up of the seal shown in the previous photo. After three years, it has hardly decomposed and still has its fur. Leopard seals are fierce predators and you would not want to get this close to a live one. Eventually, we reached the Lake Fryxell Jamesway hut. Nobody was staying at the field camp, though a team of carpenters were expected to return shortly to resume work building a new hut on the site, of the same design as the one at Lake Hoare. When they’re done, the Jamesway will be dismantled, and these photos will be documents of a vanished era. The Lake Bonney Jamesway will be replaced next. There’s something cool and retro about the Jamesways, especially the quirky improvisations and embellishments added over the years as teams of researchers have come and gone, but whatever the boxy Lake Hoare hut lacks in character it is way more functional and comfortable. 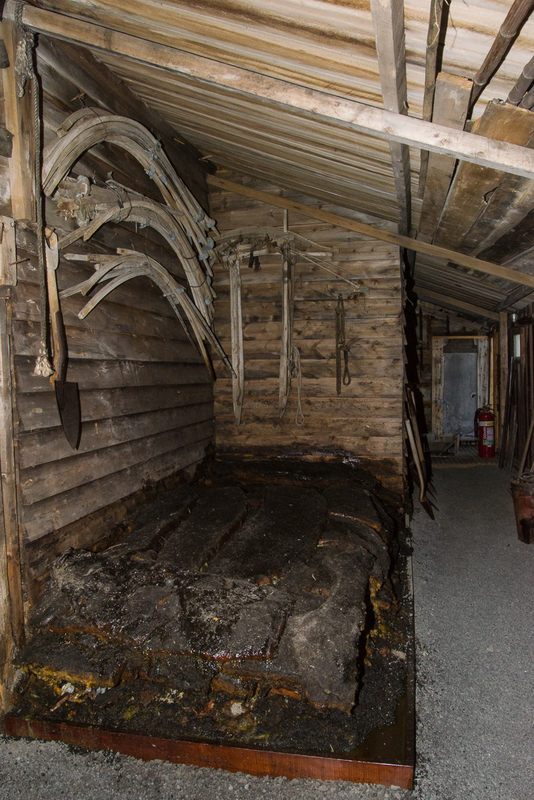 Take a good look at the Lake Fryxell hut, because it won’t be around much longer. Inside the Lake Fryxell Jamesway, with the kitchen area in the foreground. Renee and I stopped inside the hut for a snack. Someone had passed their down time making an intricate drawing on graph paper, signed, dated and left behind on the kitchen table. The newer huts will look like the one at Lake Hoare. After eating a snack in the hut, we headed for the ATV, which was parked on the thick, permanently frozen layer of ice that covers Lake Fryxell. This time of year, the margin of the lake melts, and is a few feet deep. So how do the limnologists (lake scientists) get onto the ice? The ingenious solution, arrived at with Rae’s input, was to have an aluminum rowboat rigged up so that at either end a loop of rope was attached to the boat. Through those loops runs a very long loop of yellow rope, which is threaded through two pulleys, one set up on shore and one on the ice. Get in the boat, pull the yellow rope hand over hand and the boat travels across the water and glides up onto the ice. It kind of reminded me of the old rope tows at ski areas in the 1960s and ’70s. Once on the lake ice, we walked to the ATV, pulled out the pan underneath it protecting the ice in case oil dripped from the engine (every effort is made to not have any alien materials enter the environment), and made sure the tires weren’t frozen to the ice. Renee got it started, I straddled the back part of the seat behind her, and off we went. Pull, pull, pull your boat, gently ‘cross the stream. In the distance, Renee waits at the ATV for me to finish photographing the glacier. There were some raised areas of ice at that end, left behind when the rest of the lake ice surface ablated (vaporized). There is nothing as irregular as the ice structures on Lake Hoare, but driving over and around them made for a bumpy ride in places. The Lake Fryxell face of the Canada Glacier looks completely different than the Lake Hoare side. For one thing, at its tallest, it’s about twice as high — around 20 meters. That’s because the land slopes beneath it and the surface of Lake Fryxell is actually about 55 meters lower in elevation than that of Lake Hoare. If you look at the second photo from the top of this post, taken from a helicopter, you can see the slope. I am guessing that it’s this downhill gravitational pull as well as the directions of prevailing winds and sunlight that make it look so different — spiky and Gothic with narrow pointy-topped spires, as opposed to the rounded contours on the west-facing side, which get the warmer afternoon and evening sun. 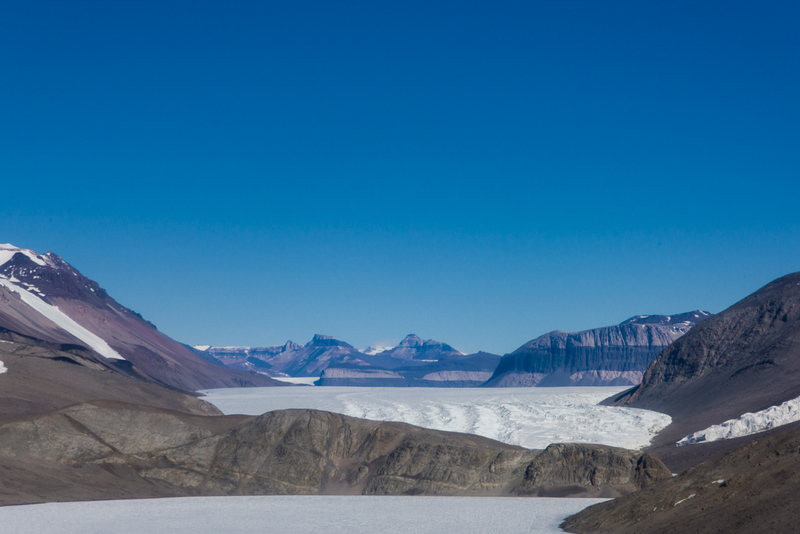 The Canada Glacier as seen from the far west side of Lake Fryxell looks like a packed metropolis of ice steeples. Renee waited patiently while I shot some 300 photos of the glacier side. That’s way more photos than I usually took at a site, because I wanted to see if I could produce a 3D capture (i.e. scan) of the complex surface, and since I hadn’t had much experience tackling something that is both that immense and that detailed, I wasn’t sure how many different angles I would need. So I decided to err on the side of “more than enough.” Eventually some of these 3D captures will be produced as sculpture. (Read more about the process.) Recently I processed one section that I shot that day. It took the software about 18 hours to calculate the relative distances between points to produce a model of the section below, and another few hours for it to generate a polygon mesh, but I’m really pleased — and relieved — with the results. Below is one of the source photos, followed by screenshots of the model. 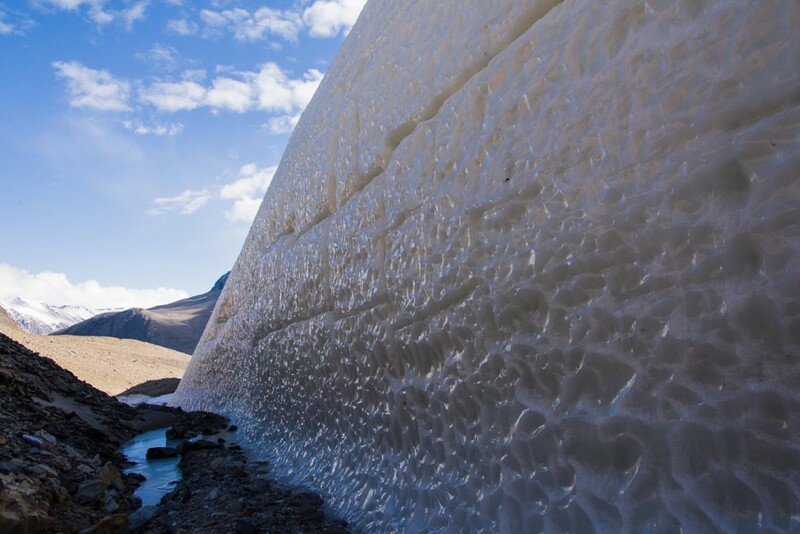 Source photo of a section of the Canada Glacier from Lake Fryxell. Two screenshots of the model produced by uploading 28 still photos to photogrammetry software. The software also captures the surface color from the photographs. The top view shows the model with that color, the bottom shows the mesh without the color. As you can see, the software was able to figure out the locations of points in space so that you can look at the model from elevated vantage points I did not have, which is pretty remarkable when you think about it. All my shots were taken looking up at it from the lake. 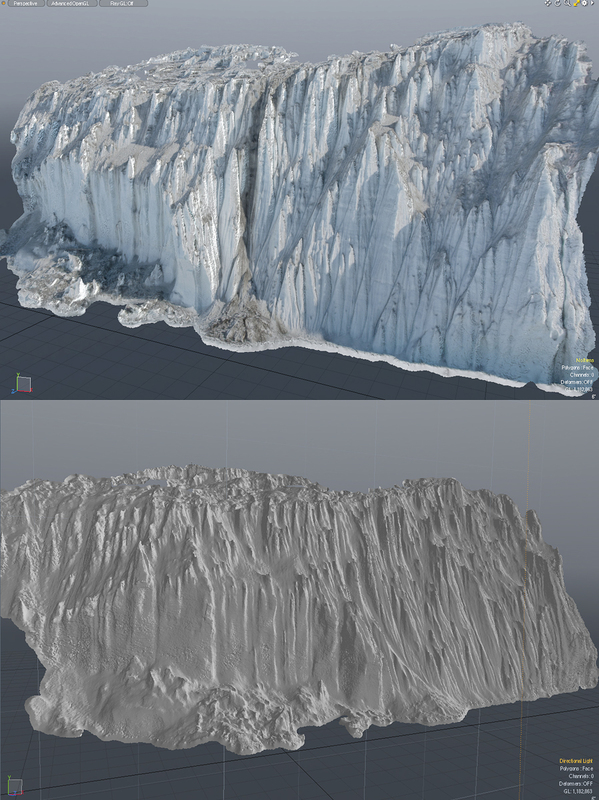 I photographed a much longer extent of the glacier so if the software can handle it, I might be able to get and even longer model of that side. I also have photos of a long section of the opposite side yet to process. After returning the ATV to its parking place, the hike back to Lake Hoare was more challenging than the hike out had been, due to gusty winds that had kicked up. The rowboat tilted to one side while Renee was pulling it to shore and I immediately shifted my weight onto the gunwale to stabilize it, to her great relief (amazing how those instincts kicked in from the long ago days of taking out sailboats at Camp Whippoorwill, when I was 13 ). The sky started to cloud, and on the top of the glacier, the previous day’s snowfall was swirling around, making me even happier to have a pole in my hand to prod the ice in front of me, and also glad that I’d stopped to photograph the ice falls in the morning. Then we walked down the moraine to camp. All told we’d been out for about eight hours. 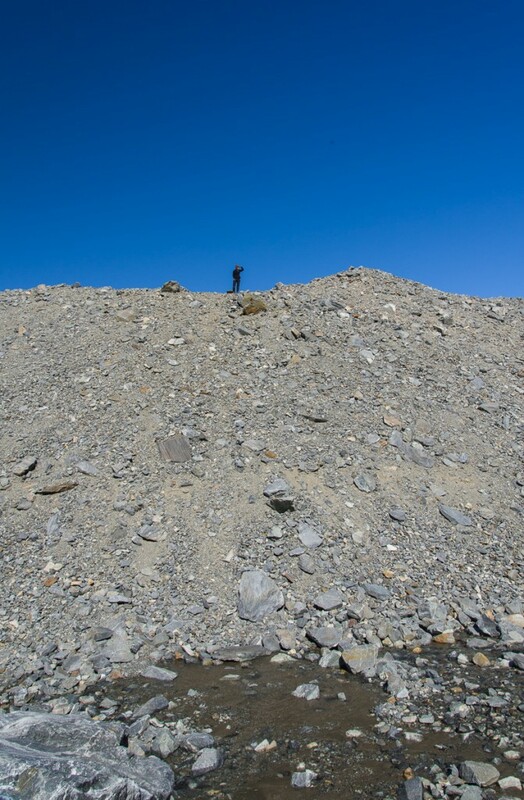 Photographing — or for that matter doing scientific research — in the Dry Valleys is often very physical, and involves a lot of walking up and down hills while carrying a pack. And I still had a lingering cold the entire time, but was damned if that was going to stop me. Last week a woman who writes a travel blog called me up to interview me about the Antarctica trip. She asked about my formative travel experiences. This got me thinking about the aforementioned Camp Whippoorwill, where I was introduced to hiking and camping in the Adirondacks, and Crossroads America, a cross-country teen tour I took the summer I turned 16. I spent those nine weeks riding around the U.S. in a Ford Econoline van with nine boys and girls and two adult leaders whom I’d never met before the day we started out. All my belongings were in a duffel bag, we camped outdoors almost every night, and we all had to get along with kids at close quarters whom we might not otherwise have chosen as friends. I’m grateful and maybe a little surprised to arrive at this age with the energy, physical conditioning, and the ability to tolerate a lack of creature comforts and to roll with the inevitable glitches that arise, but I think it goes back to those formative experiences: reaching the summit of an Adirondack peak on a day where you could see for miles, singing to keep our spirits up while we walked in plastic ponchos getting drenched with rain, campfire meals of tuna-rice-a-pea (open cans of tuna, rice, peas and cream of mushroom soup, and stir), picking up my ground cloth after sleeping in the open at the bottom of the Grand Canyon to find a little white scorpion had also spent the night there. Somewhere were planted the seeds of confidence, resilience and determination to push onward until you reach your destination that have never left me. I think my teenage self would have been happy to know that. 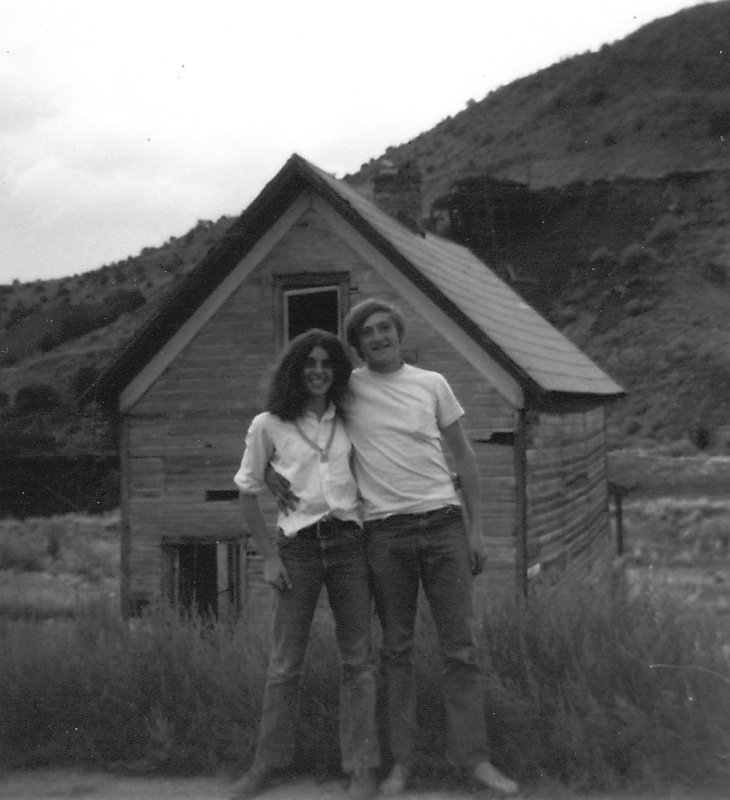 With one of my fellow travelers in a New Mexico ghost town on the Crossroads America trip, 1971. 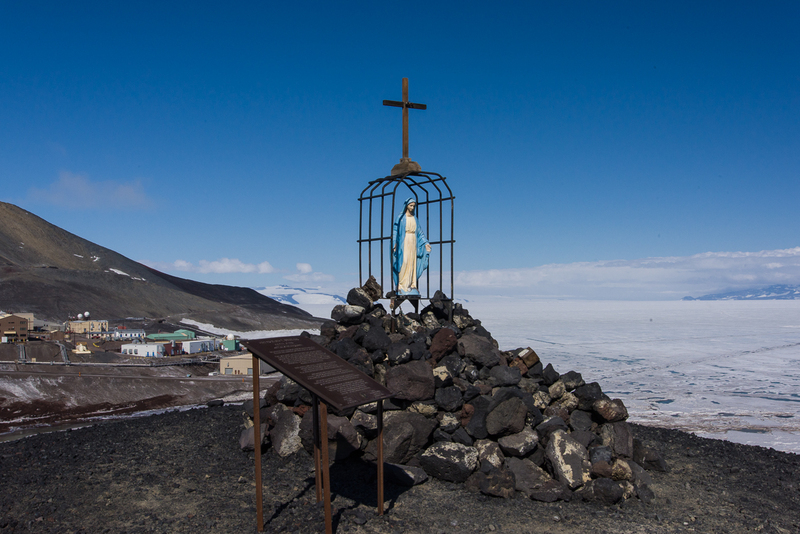 The Our Lady of the Snows shrine is one of the many memorials atop hills along McMurdo Sound to men who lost their lives in Antarctica. This view of the statue is framed by Observation Hill in the background. 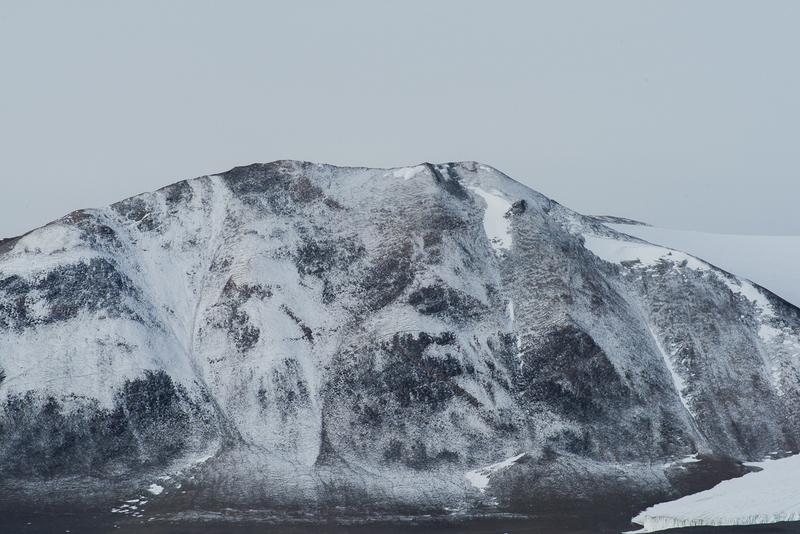 It was late in my stay at McMurdo when I finally got around to walking the hiking trails at two places I could see every time I walked out of my dormitory: Hut Point and Observation Hill — Ob Hill as the McMurdites call it. These photos were taken on two different days. When I arrived in November, the Ob Hill loop trail that circles it about one-third the way up was open, but the trail to the steep summit was closed due to ice. On December 29, six days before I left, I took advantage of a mild day (i.e. 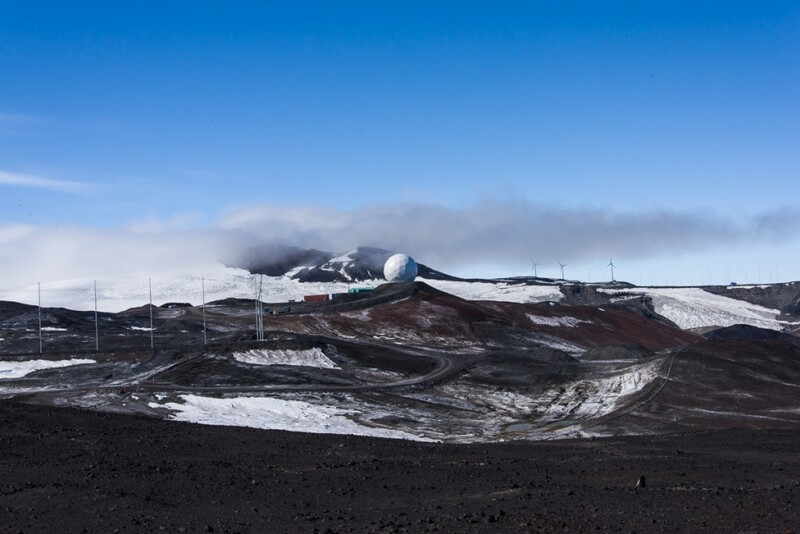 it was 20 degrees F with no wind — that counts as mild at McMurdo) and walked up to the top of Ob Hill, which has an elevation of about 750 feet. There it is on the right in the photo below. 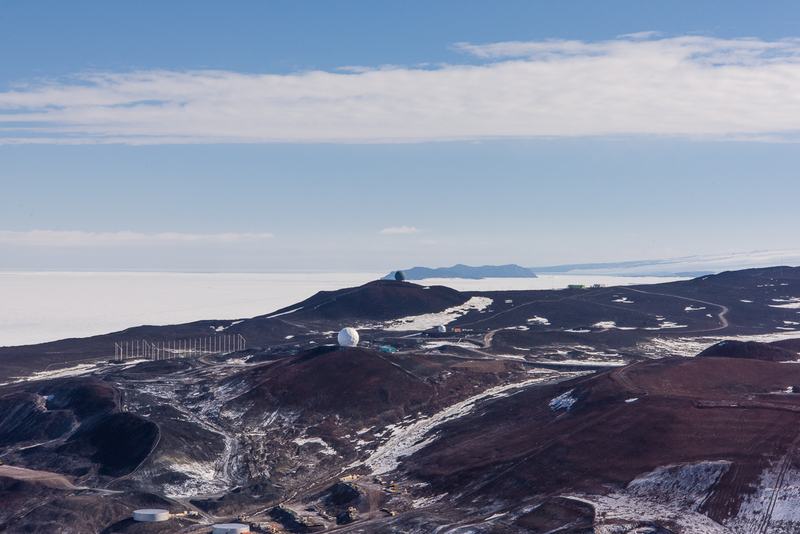 Panorama of McMurdo from the Hut Point ridge, with Observation Hill on the right. It took 15 minutes to walk to the Ob Hill loop from my dormitory (I lived in one of the four identical brown buildings near the large blue building that you can see in the photos above and below; click any photo to see an enlargement). It took 20 more minutes to get to the summit on a progressively narrower trail that is very steep with a lot of loose, gravelly volcanic rock surrounded by larger volcanic rocks. If you see the shaded ridge up the center of the hill in the photo above, that’s pretty much the line of the trail. The further up you climb, the steeper it gets. I had flashes of mental images of myself skidding off it and bouncing off rocks on the way down like a playground ball, so I tread carefully, pausing frequently to make sure I was on the best path, and reassuring myself periodically, “You’ve got this.” A few days earlier the annual Ob Hill Uphill, a competitive race to the top, had taken place. Hopefully, the racers spread out before they got to the upper part, because I cannot imagine how you’d pass someone on that trail. No, I don’t have that need for speed. But hey, I’ve got this. I made it to the top without a mishap. There, wedged between two rocks, I found a new black water bottle with a McMurdo emblem that sold in the station store for $30 (left from the race?). As my good deed of the day, I brought it down and handed it in to the Recreation Office. If that was your bottle, you’re welcome! 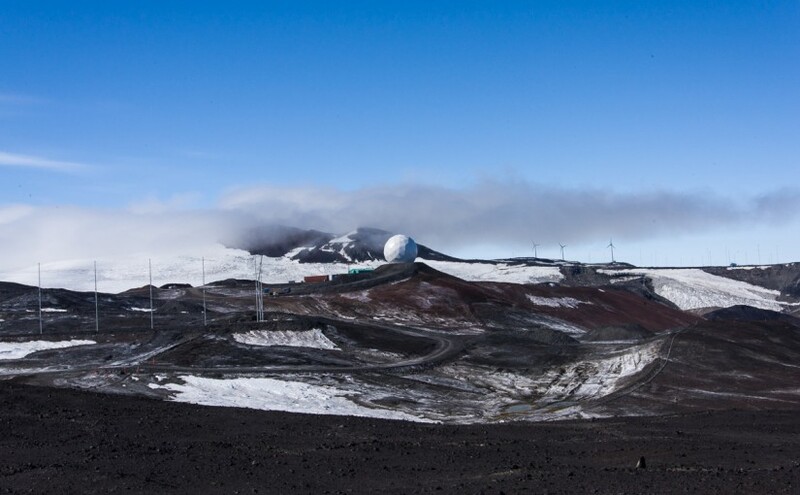 From the summit, you have an excellent view that encompasses McMurdo, New Zealand’s Scott Base, the golfball-shaped observatories, the Dellbridge Islands and Mount Erebus. Looking down at McMurdo from the opposite direction, standing on the Observation Hill summit, with Hut Point on the left. 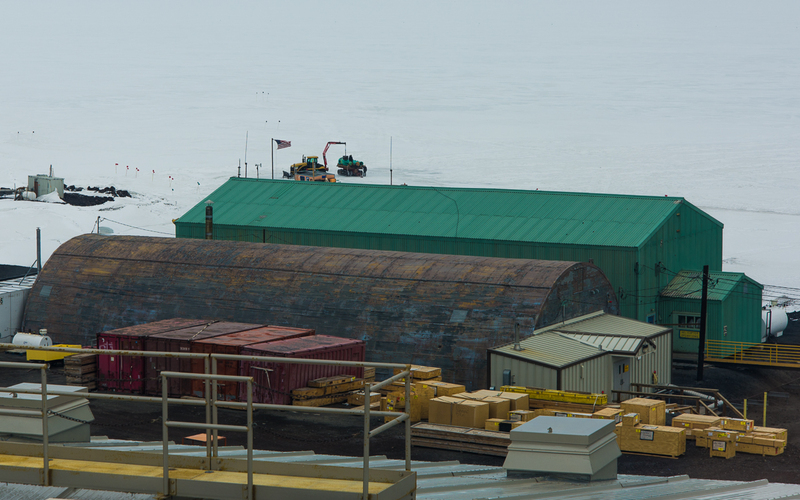 The green buildings of Scott Base from Observation Hill. 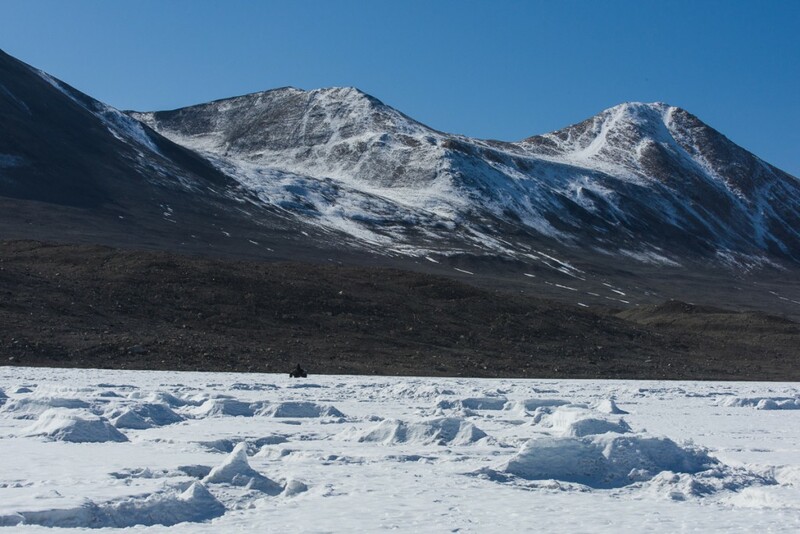 Beside the base are the Scott Base pressure ridges. The black dots are Weddell seals. Beyond the hills topped with “golf balls,” one of the Dellbridge Islands is silhouetted against the sea ice. The wooden cross atop Observation Hill. 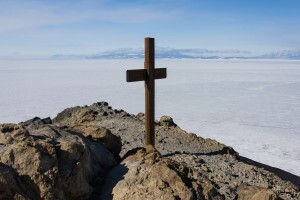 At the top of Observation Hill is a nine-foot wooden cross, built in 1913 and hauled there by sledge by the crew of the Terra Nova, the ship that carried British explorer Robert F. Scott and his party to Antarctica for their attempt to become the first to reach the South Pole. Scott and four men reached the pole in January 1912, only to find that Norwegian Roald Amundsen had beat them to the record by five weeks. All five of them died in March on the return trip. Their tent, containing their bodies and belongings, was discovered by a search party eight months later, including Scott’s last diary, where he recorded their final days and ended his last entry, “For God’s sake look after our people.” The sad story is summarized here. George Vince’s cross at Hut Point memorializes another unfortunate explorer from the early Antarctic expeditions. 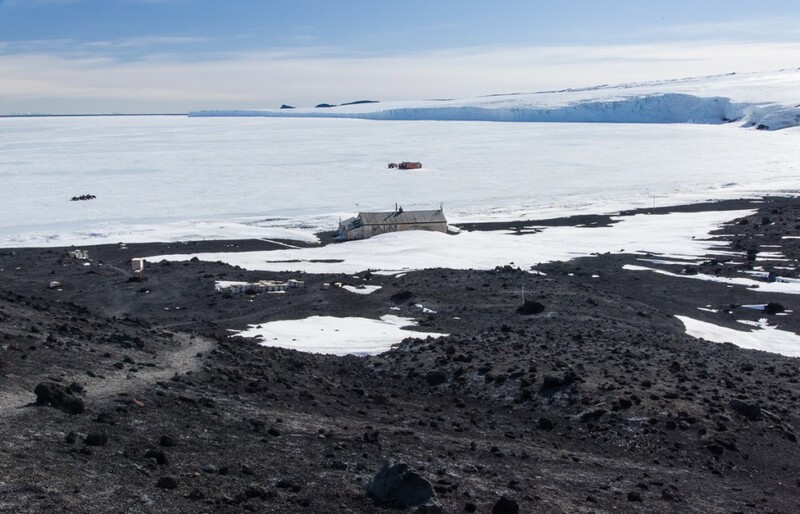 The other place to take in a view of McMurdo is from Hut Point, so named for the historic Discovery Hut that sits at the end of it, which was built in 1902 for Scott’s first Antarctic expedition, in 1903-07 and used by subsequent exhibitions until 1917. Below is the view of Hut Point from the back door of my dormitory. You can see the hut and another melancholy monument, this one dedicated to George Vince, a member of Scott’s party who died in an accident in 1904, when he fell off the cliffs into the McMurdo Sound while trying to make his way back to the hut during a blizzard. Hut Point extends out into the sea ice, which by late December had numerous melt pools. In the right foreground is part of the ice pier where the cargo ship brings supplies to McMurdo in January. Looking back toward the sea ice gave me a good look at the cracks and melt pools that were developing as the ice thawed. A large number of Weddell seals had congregated there. 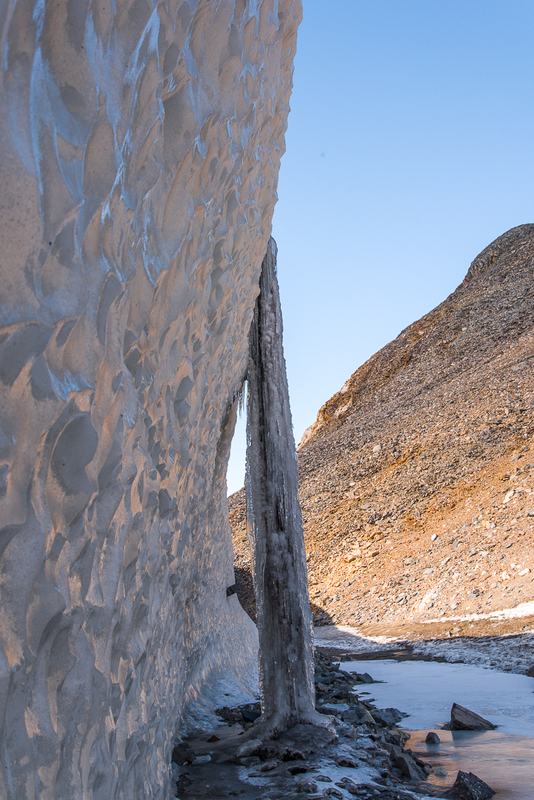 Shaun O’Boyle, who was also photographing in McMurdo this season for an Antarctic Artists and Writers Program project, arrived before I did and has posted his photos from these two hikes. Comparing his photos from late October and early November to mine, you can see the changes in the landscape and the sea ice that took place within about two months. Looking down at Hut Point from the trail. Cracks had opened in the sea ice, leaving ample room for Weddell seals to come out of the ocean and rest. Climbing further up the ridge, I looked down at the other side and found a small pond with three glowing green spots. 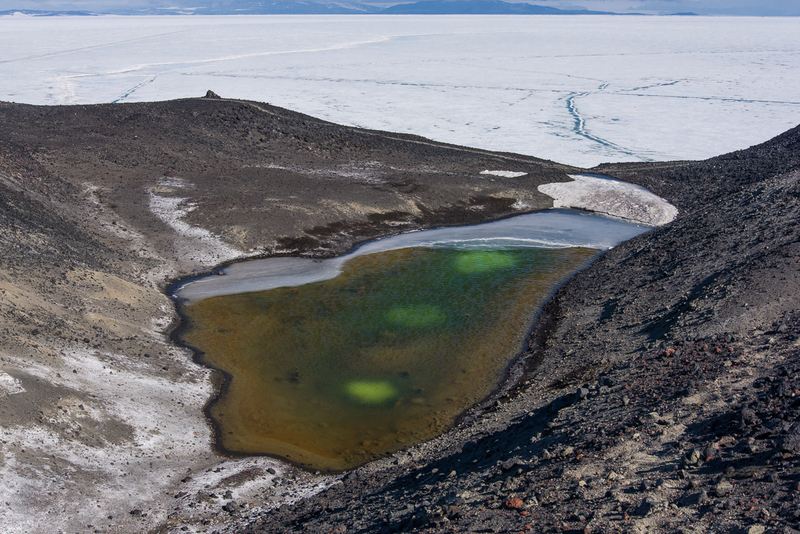 You seldom — or never — see anything green in the Antarctic landscape, so it was a weird sight. I assume there is some algae growing there, because no green plants grow in Antarctica. 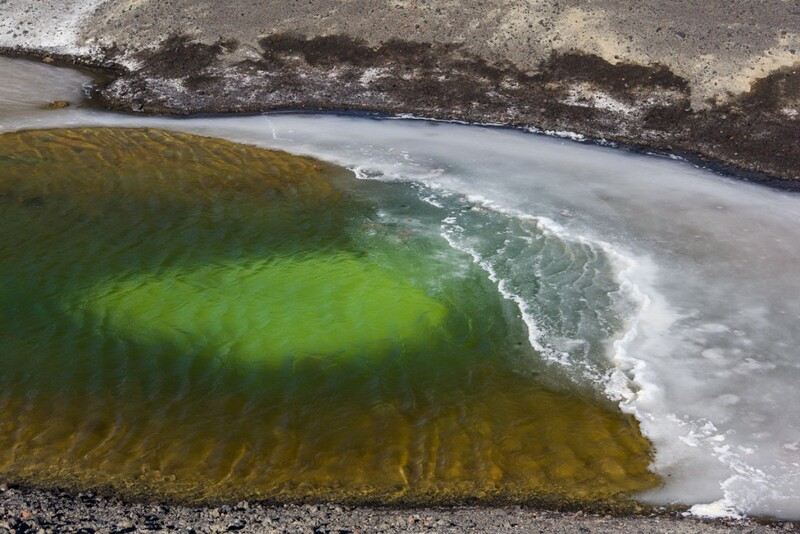 A small pond seen from the Hut Point Trail has three glowing green spots of what I assume is algal growth. 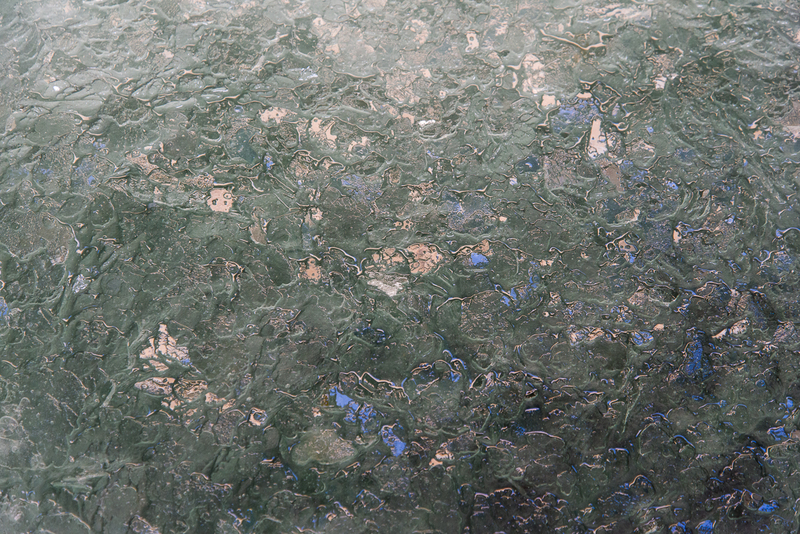 A closer look at the luminous green Rothko-esque patches from the pond’s shore made them no less mysterious. 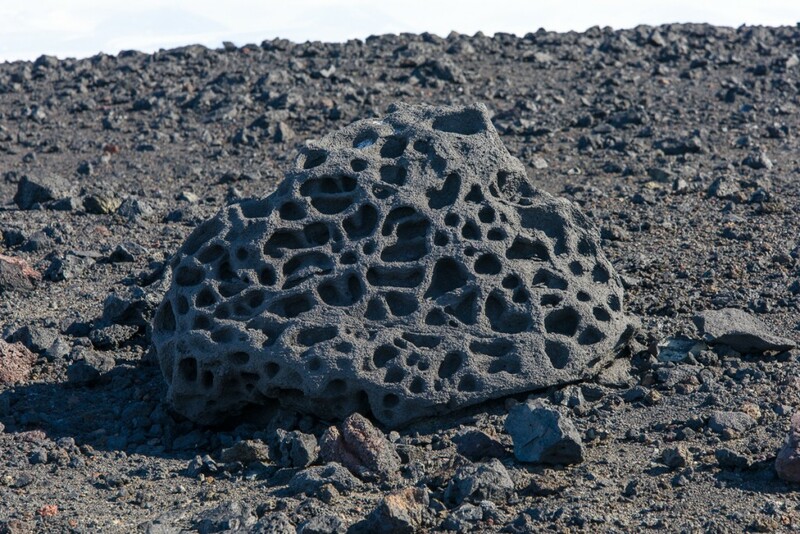 A volcanic rock on the windswept Hut Point Trail has an intricate pattern of perforations. The ridge trail leads to the small, dark “golf ball” and then winds back into town. I planned to walk the entire loop, but the wind kicked up with 20-knot gusts coming from the sea ice. Not only was it making my eyes water, but as I walked along the top of the ridge, I had to brace myself to keep my footing. I decided that it was time to turn back. As I headed back, I came upon another hilltop memorial, Our Lady of the Snows. 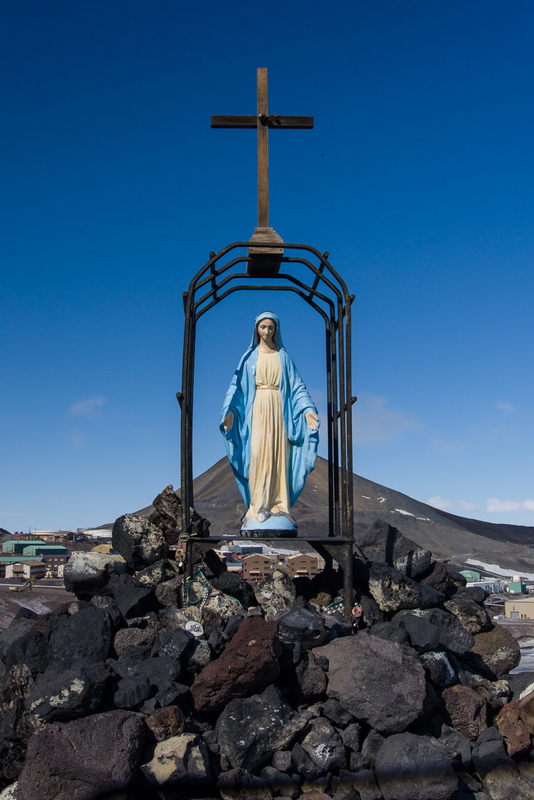 A statue of the Madonna on a ironwork frame topped by a cross, and held in place by a pile of volcanic rocks. Beside it, a plaque explains that during the construction of McMurdo in 1956, Petty Officer Richard T. Williams of the U.S. Navy Seabees was part of a crew bringing supplies across the sea ice from a ship anchored 30 miles away, when the tractor he was driving broke through the sea ice north of Cape Royds and “plunged 350 fathoms to the bottom of McMurdo Sound. His body was never recovered.” I hadn’t realized until reading the plaque that Willy Field, one of two airfields used by the U.S. and New Zealand Antarctic Programs, was named for him. It’s formal name is the Williams Air Operating Facility. 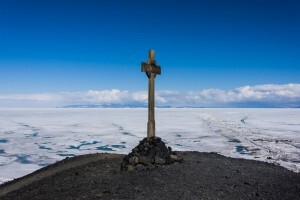 Our Lady of the Snows gazes northwest across the sea ice, where a Navy construction worker drowned 60 years ago during the building of McMurdo Station. This shrine was erected the following year, in 1957. A fishing hut is stored uphill from the ice pier during the off-season. 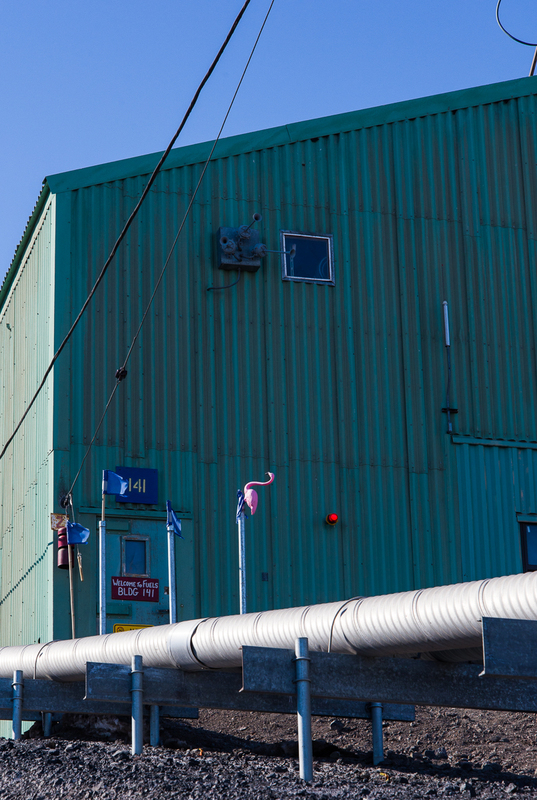 Paging John Waters: a pink flamingo perches on a pipe outside the Fuels building. 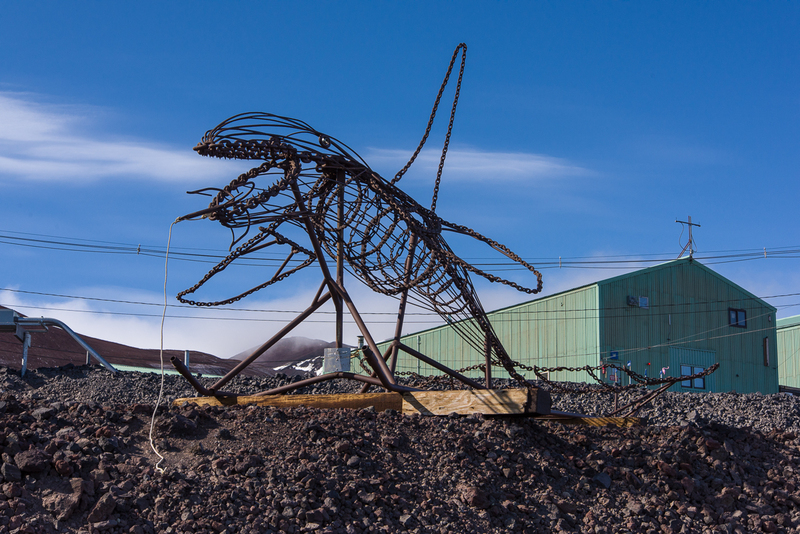 An anonymous worker made a sculpture of a whale that sits on a berm beside the road from the ice pier to the main area of the station. A helicopter taking me to New Harbor on Nov. 21st lifts off from McMurdo. Riding in a helicopter never got old. Photo: Elaine Hood. The New Harbor team gathered outside the Jamesway huts to see me off when I flew out a few days later. 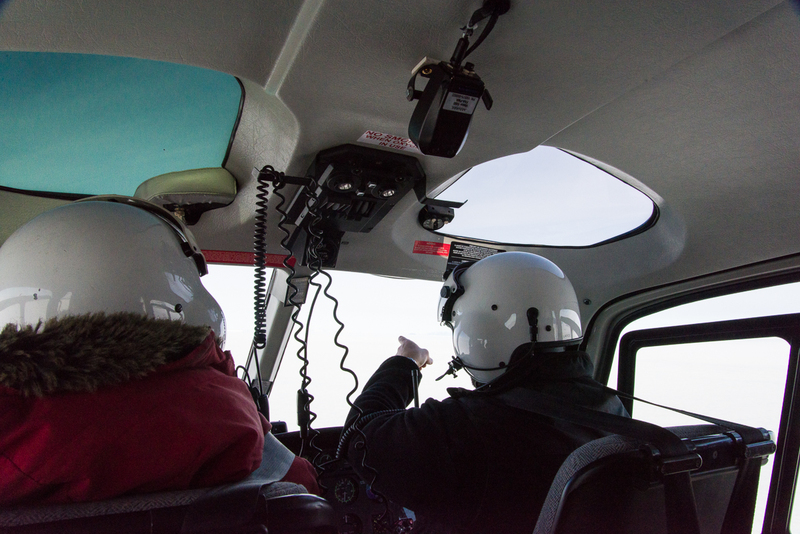 To travel to the four field camps I visited during my stay in Antarctica I took a total of eight helicopter trips. Traveling by “helo,” as they say there, or watching them take off, land, and pick up sling loads never got old. 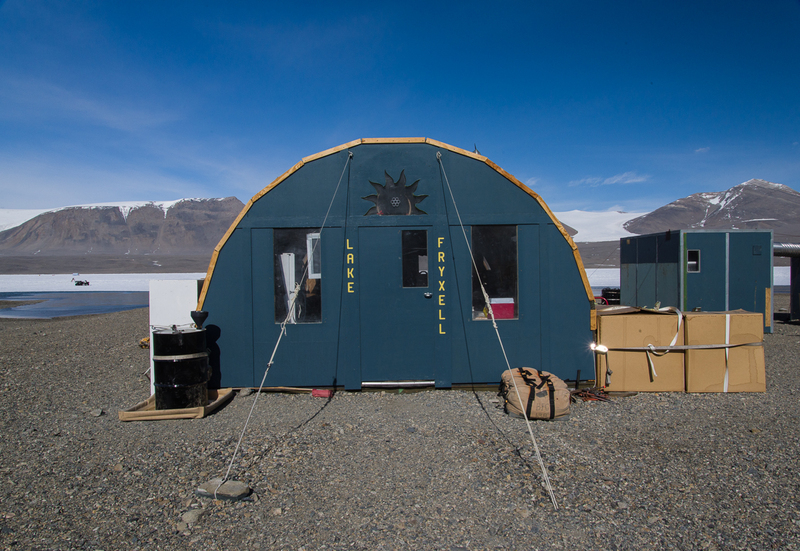 I don’t think it was just because I was an Antarctic newbie; even at the field camps where helicopters took off and landed a few times a week, or in the case of Lake Hoare, a couple of times a day, camp residents would stand at the hut window or just outside the door to watch. Since all fresh water, fuel and food is brought into the field camps, and all waste is packed out, the helo pilots are busy all day during the field season. And when I say all waste is packed out, I mean everything: gray water (water left from washing hands, faces, and dishes), human waste (metal drums for the pee, five-gallon plastic buckets for the poop), trash (sorted into recyclables, non-recyclables, and food waste). 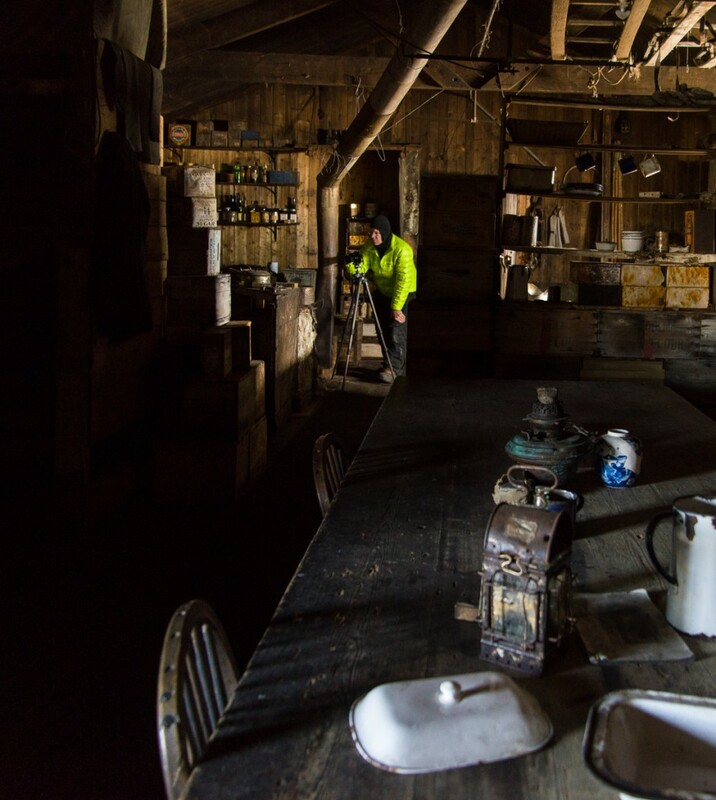 By treaty, all traces of human presence are to be removed from the environment, which as you can imagine, demands a lot more thoughtfulness in sorting and disposing of trash than we’re used to, not just in the field, but at McMurdo, too. Heavy items are suspended under the helicopter as a sling load. Laura Von Rosk has posted a short video of sling load take-offs from New Harbor on the Bravo! 043 Facebook page (see December 9, 2015 post). Helicopters take off and land vertically, which is a different sensation than the headlong forward motion of an airplane liftoff. On December 16th, a brilliantly sunny day, I shot this video of the helo take off (posted on YouTube) from McMurdo Station on the way to Blood Falls in the Dry Valleys. (I’ve already discussed Blood Falls in the previous post.) The video starts just after the helo has risen off the ground and is turning around to head out over the sea ice. Mt. Discovery is in the distance. Helmets are equipped with microphones and earphones so passengers can communicate with the pilots during the trip, because helicopters are noisy. That’s one of Mike’s colleagues pointing out the sights on the return trip from New Harbor. I was sitting in the back seat of a four-seat helicopter. Mike, the helo pilot that day, knew that I was interested in ice, and asked if I’d like to see the recent changes to the edge where the sea ice meets the ice shelf. Well, yeah! 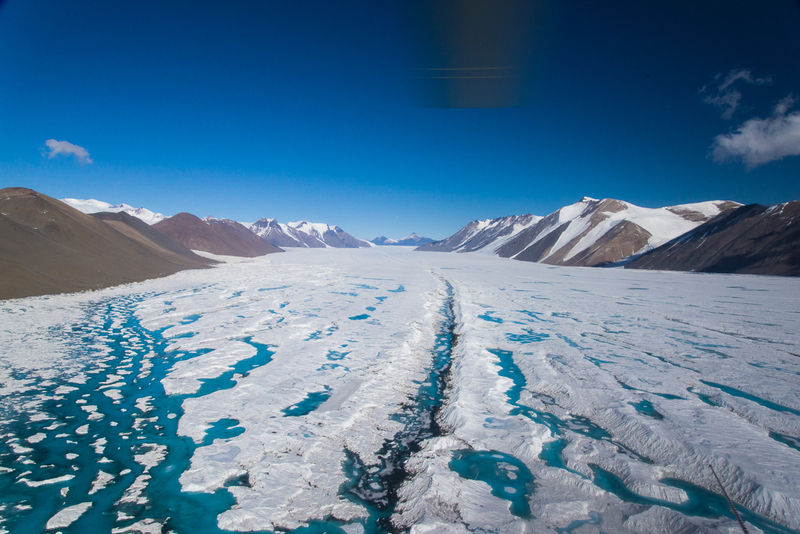 The last time I’d flown across the sea ice to the Dry Valleys had been almost a month before, and it was indeed different. 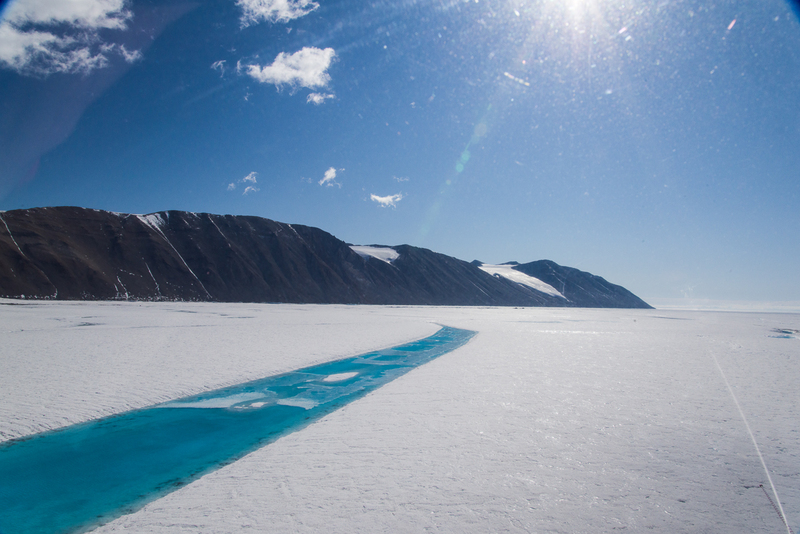 Meltpools filled with blue water streaked the surface of the ice shelf, including a stream flowing to the sea ice. 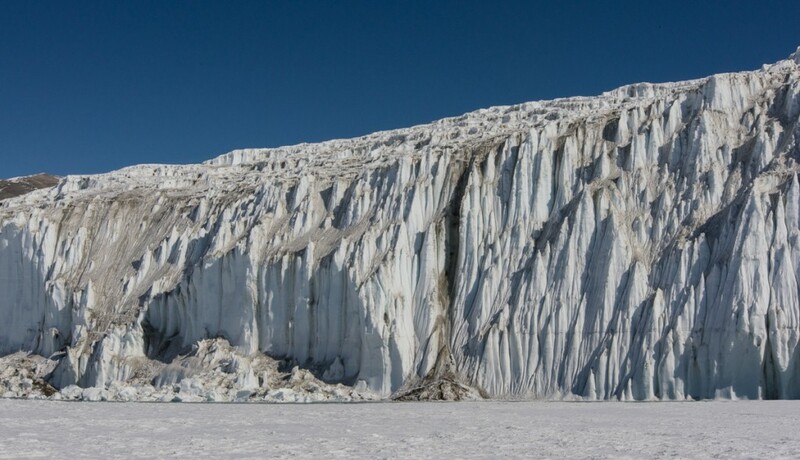 The rest was a corrugated pattern of white ice and snow outlined by dark brown sediment that had blown there from the surrounding mountains, carried by fierce Antarctic winds. 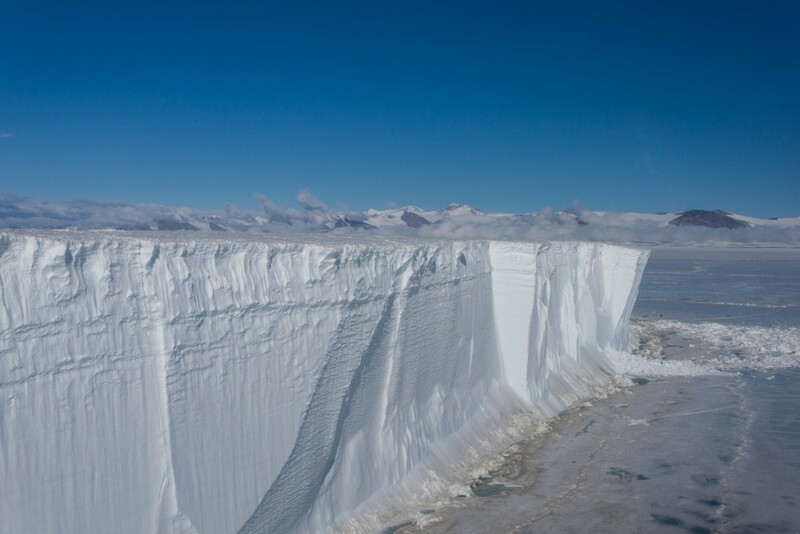 The Edge: On December 16, Mike showed me the recent changes in the edge where the sea ice meets the ice shelf. Mt. Discovery is in the distance. We flew over a large crack in the sea ice that was remarkably regular in shape: three fairly straight segments at close to right angles. 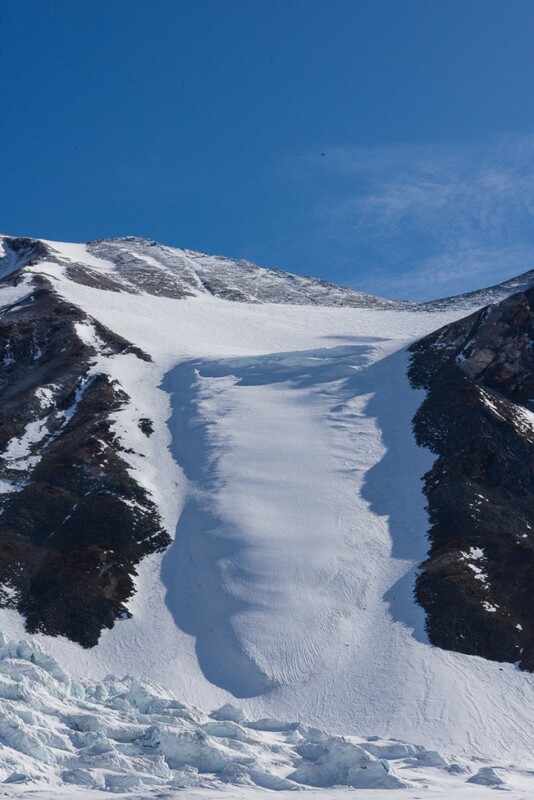 When I showed this photo to glaciologists Doug MacAyeal [pron. mac-hale] and Ian Willis, they told me that it was the result of movement analogous to that of the tectonic plates of the earth’s crust, where forces were pulling the sea ice away from the ice shelf, creating the two cracks that are vertical in the photo. The horizontal crack had then opened between those two cracks, connecting them; Doug pointed out how its edges were jagged, rather than clean. 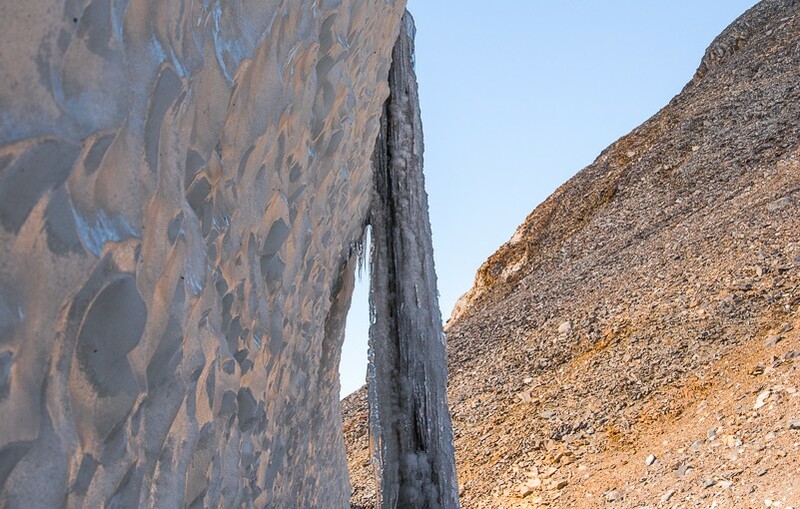 Zigzag: This crack resulted from ice dynamics where the two parallel cracks separated and the horizontal one formed between them. 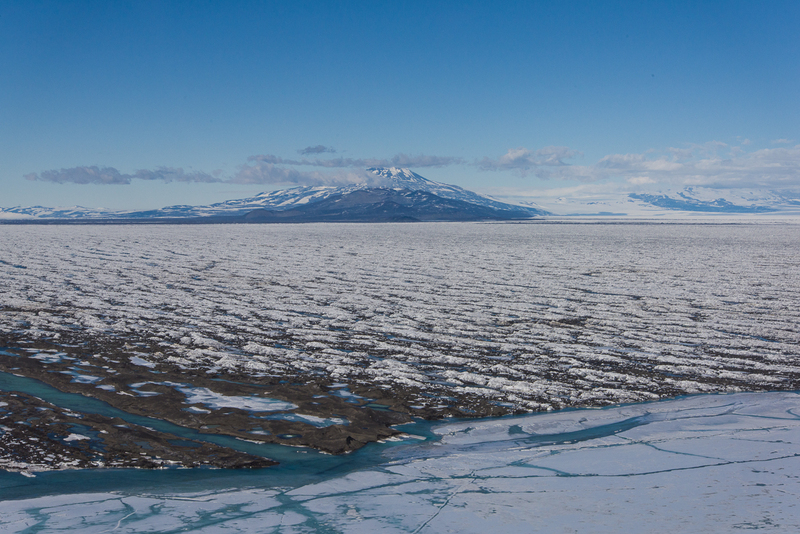 As we headed across McMurdo Sound toward the Kukri Hills and the Dry Valleys a low white object appeared in the distance, resembling those gift boxes they give you at a department store. It was a huge tabular iceberg that has been frozen in the sea ice for at least a few years, according to another of the helo pilots. I had flown over it once before, on the way to New Harbor. At a distance, the iceberg stuck in the sea ice of McMurdo Sound looks like a department store gift box. As we got closer, the immense scale became evident. What looked like a perfectly flat top and planar sides from a distance was inflected with vertical ridges and horizontal lines. 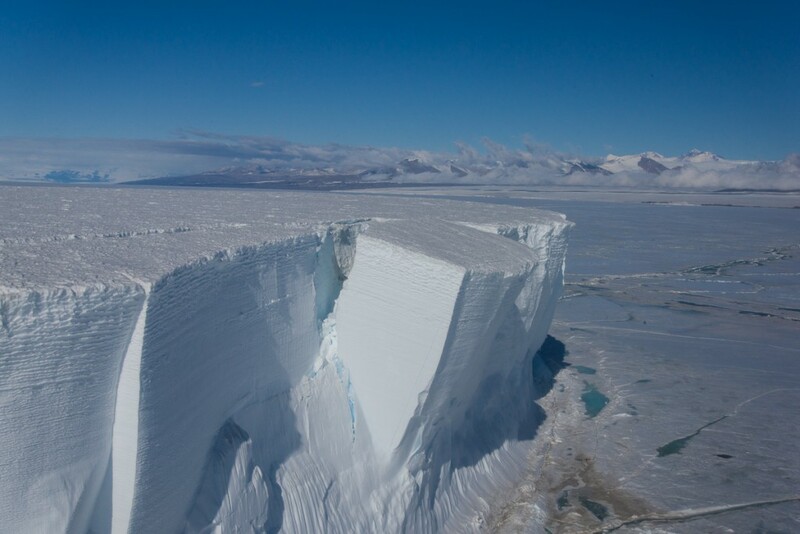 Tabular icebergs have flat tops and steep sides, and are created by breaking off from ice sheets or ice shelves, so presumably this one was once part of the ice shelf. Approaching the tabular iceberg. It is not as rectangular as it appeared from a distance. That’s part of the helicopter in the right foreground. And an even closer view of the side. At one corner, a huge chunk is poised to fall. The helo pilots have been watching it all season: “I’d love to be flying over it when that happens,” one told me. That will be quite dramatic when it gives way and tons of ice come crashing onto the sea ice, though odds are nobody will be around to see it. 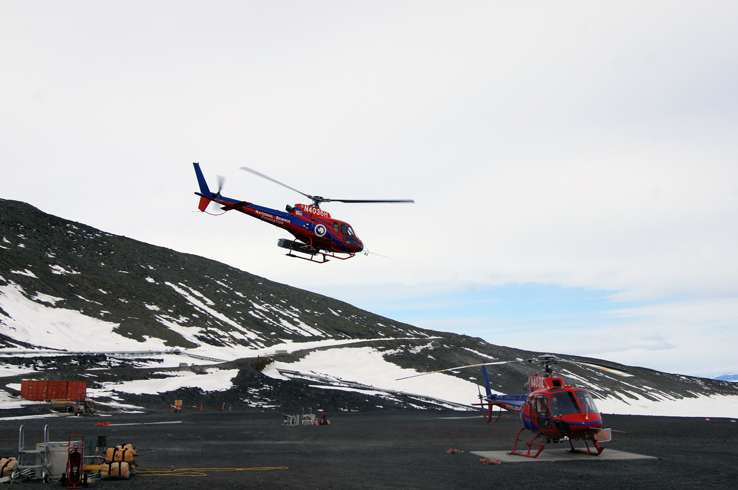 The McMurdo helicopter pilots enjoy the ever-evolving panorama beneath them as a perk of the job. On my last flight I asked the pilot about that and he said, absolutely — flying over other locations can be very monotonous by comparison. Leaning Tower: One day that enormous chunk will come crashing to the ground. 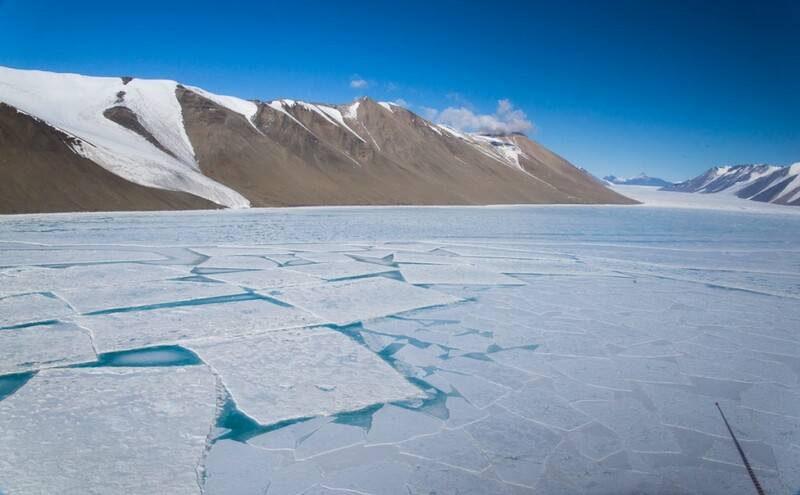 As we began to enter the area of the Dry Valleys, we saw a variety of other patterns in the ice below: an area where it had broken into large, roughly rectangular sheets; turquoise melt pools and a stream between sparkling white ridges; and a long blue melt pool with parallel sides as if someone had built a canal there. The way the sea ice could fracture along long straight lines into almost rectangular shapes intrigued me. 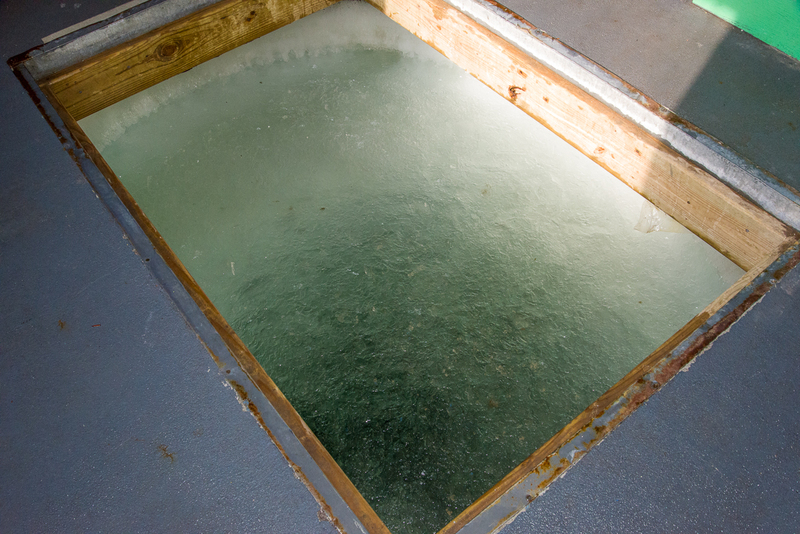 Roughly rectangular blocks of ice are outlined by turquoise melt water. Beside them, more irregular patches resemble a flagstone path. Further along were these gorgeous turquoise and white patterns as we headed between the hills. The helicopter rotor is a blur in the top center. That view gave way to narrow streams and a few melt pools. A sea ice “canal” with parallel sides that are so evenly spaced it looks manmade. Our helo flight to Blood Falls turned and crossed over the steep gravel Kukri Hills. On the other side of the valley, you could see the Canada Glacier spilling down to Lake Fryxell, which was on the right, and Lake Hoare, on the left. 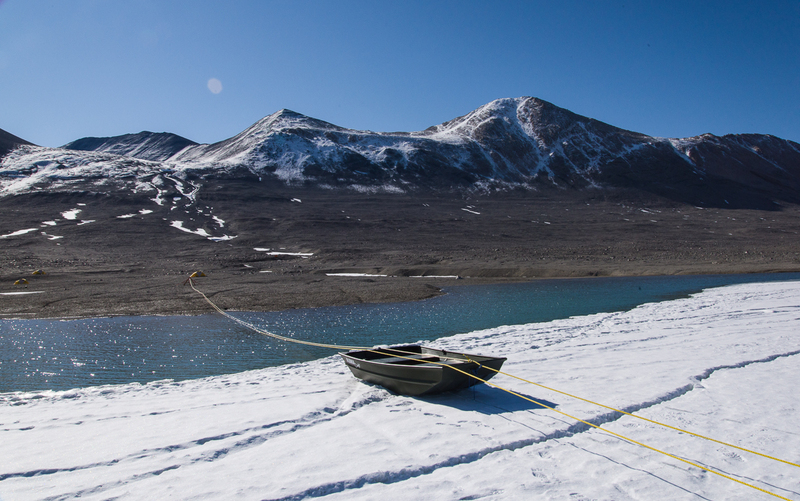 We landed briefly at Lake Hoare to drop off some supplies before continuing to Blood Falls. That was my first view of the field camp where I would return a few days later and spend five nights. If you check out my earlier blog post about Lake Hoare, you’ll see ground level views of the camp. 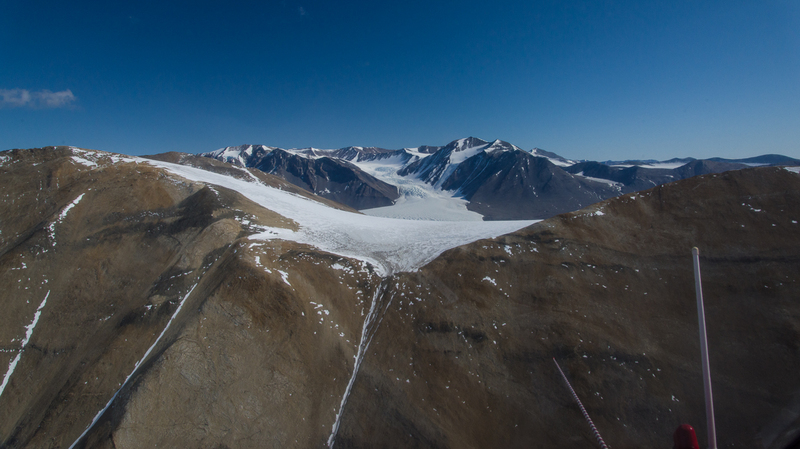 From the air, it’s clear how tiny the main hut, lab buildings and tents are in relation to the Canada Glacier. 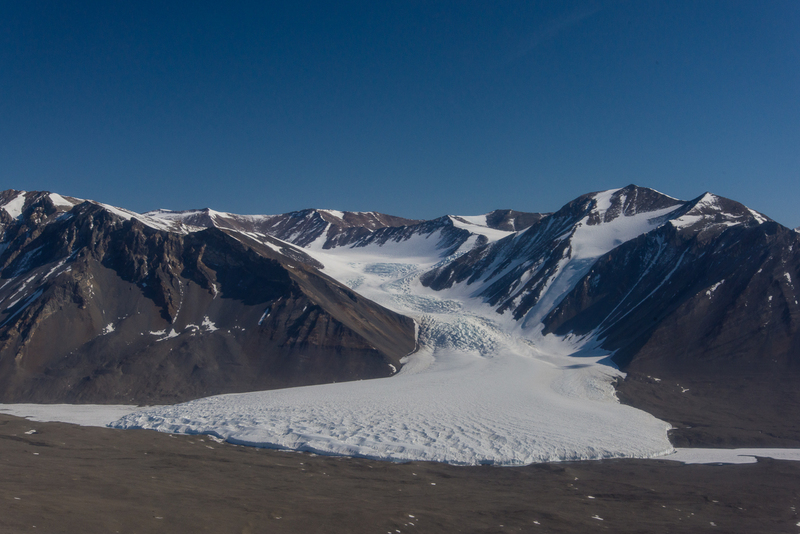 Flying over the hill, the Canada Glacier in the distance, with helicopter antennas in the right foreground. 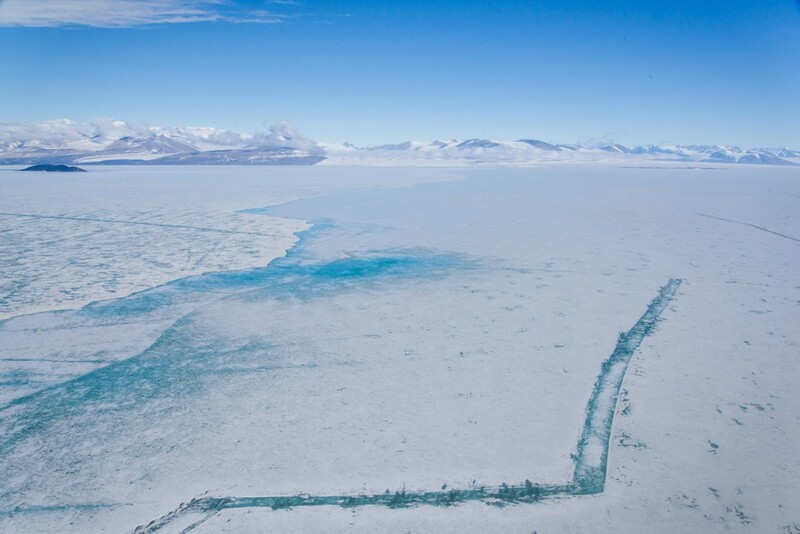 The Canada Glacier comes into view, with the frozen surfaces of Lake Fryxell to its right and Lake Hoare to its left. 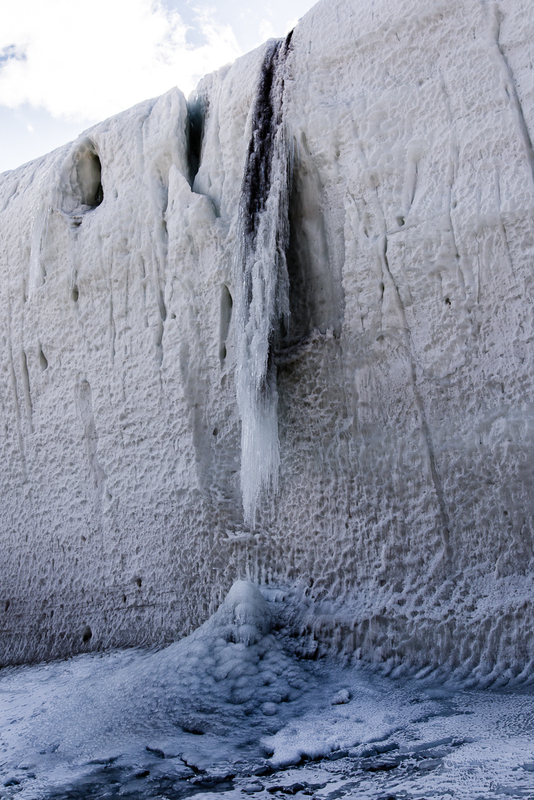 The light was perfect for capturing the rugged texture of the ice falls further uphill. A few days later, I hiked to the bottom of the lower ice falls, over the top of the glacier, and down to Fryxell. I’ll write up that trip in a later blog post. 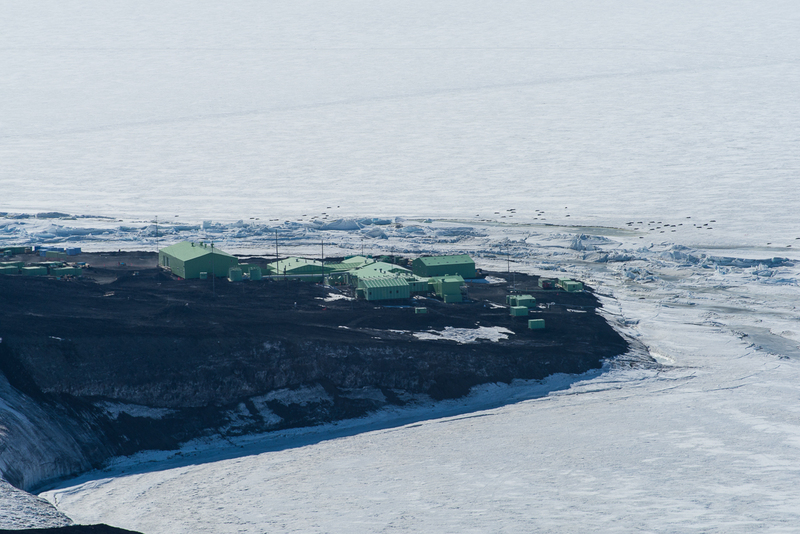 In this aerial view of the Lake Hoare camp, you see a portion of the Canada Glacier looming over the main hut, three labs, smaller outbuildings, and if you look really closely (click image to enlarge), small tents where the scientists and camp personnel sleep. For a ground level view see my earlier post. The final photo in this sequence was taken just before we got to Blood Falls, looking into the Taylor Valley toward the distinctive striped hills resembling chocolate sandwich cookies, yet another unexpected sight in a trip that was full of them. Sandwich Cookies? : The Taylor Glacier is bordered on one side by distinctive striped hills. Lake Bonney is in the foreground. The hill in the foreground blocks the view of the west lobe of Lake Bonney and Blood Falls, which are on the other side.